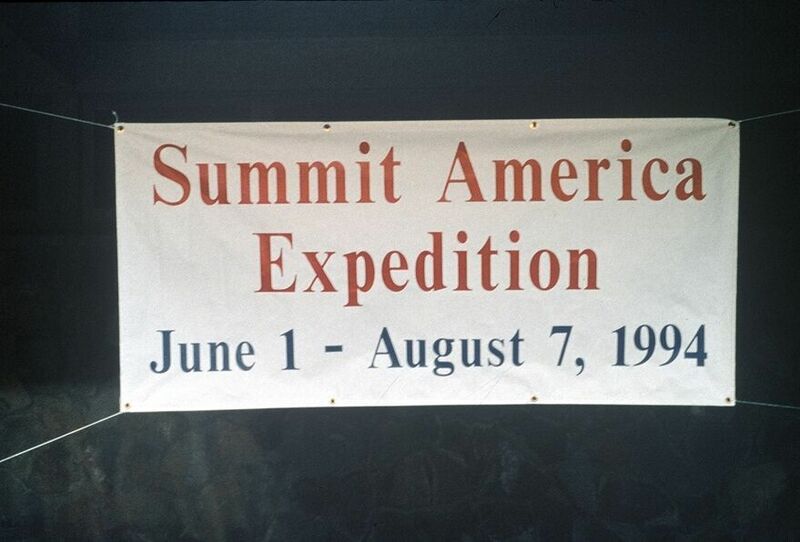 In June of 1994, my oldest friend, Todd Huston, began a project he called “Summit America”. 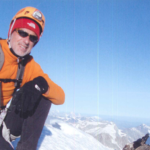 Todd had a goal of breaking the record time for summiting the high points of all 50 states. The existing record was 101 days and was held by Adrian Crane, an ultra-endurance athlete. Adrian Crane has two legs; Todd has only one. When Todd was fourteen years old, a boat ran over him, sucking both of his legs into the propellers. His left thigh was torn to the bone, the back side of his right leg was missing, and his right knee was sliced in half. The doctors were able to save both legs, but his right leg was paralyzed below the knee. The infection that plagued his leg for years led to the decision to amputate when he was 21. Todd is one of the toughest guys I know. His leg was amputated while he was wide awake. He asked to be anesthetized below the waist, and while he was talking to the doctor, they fired up the saw and amputated his right leg, below the knee. Anybody that tough can do anything they put their mind to. I never treated Todd any differently than anyone else or showed him pity over what had happened to him. When he came to visit me in San Francisco 35 years ago, he hiked the hills all day on crutches. When my car wouldn’t start, I had him push it with one leg while I sat in the car and popped the clutch to get it going again. In hindsight, it was great training for his future. 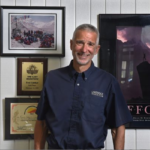 Todd and I have always had each other’s backs, so when he ran into an unexpected challenge with his Summit America project, he knew who to call. 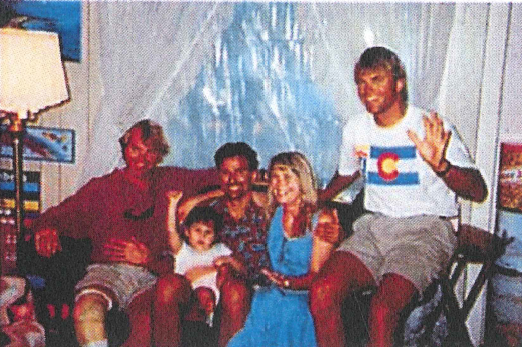 Todd had initially invited me to be part of the expedition but I wasn’t able to take that much time off from work, so I’d had to say no. I offered suggestions regarding the sequencing of the climbs, including starting the time-clock at the summit of Denali in Alaska, the highest of the 50 high points at 20,320 feet. This suggestion changed the course of the climb and of Todd’s life. 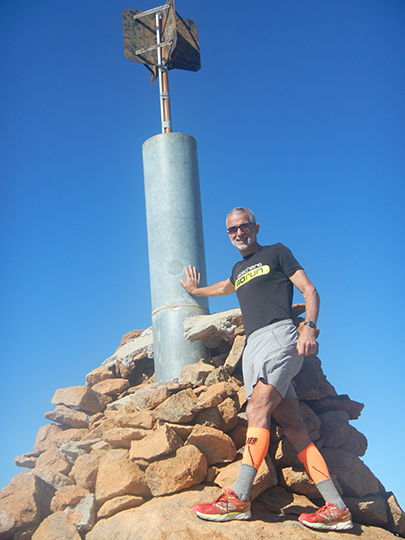 By late July, Todd had successfully summited 46 of the 50 high points and was well on track to break the record. I had been following his progress and was really excited for him. On July 30th, the phone rang. There was a problem in Oregon. A week earlier, a team of 5 climbers on Mt Hood had fallen. Two had died and two had been seriously injured. Apparently, there was a problem with snow melting due to unusually warm weather, resulting in serious rockslides on the mountain. 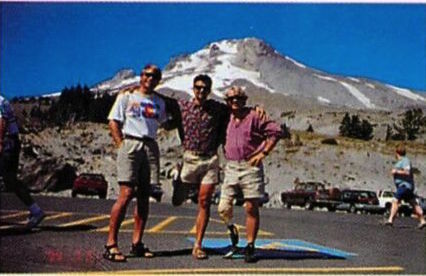 Todd had already arranged for a guide to take him up Mt Hood, but due to the conditions and the fatal accident the previous week, his guide pulled out at the last minute. 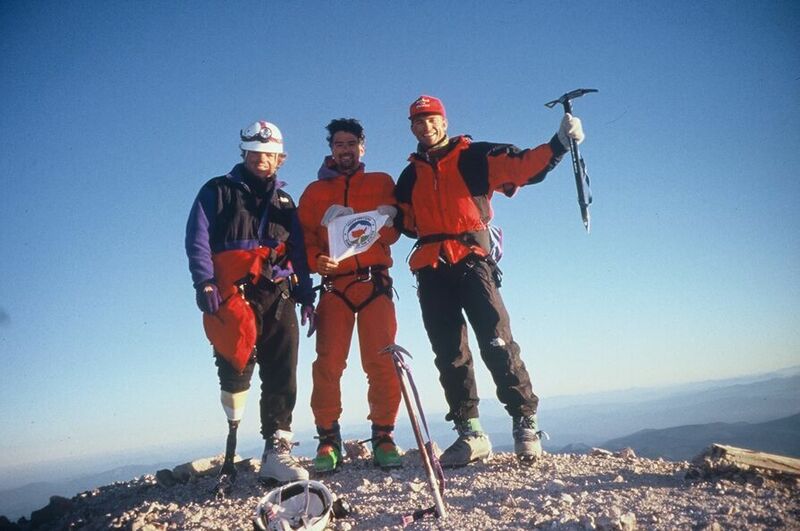 Todd tried to find another guide, but no one was interested in taking an amputee up the mountain in conditions that everyone considered dangerous. I had climbed Mt Hood 3 years earlier, and I knew that it was not a technical, challenging mountain. In fact, Mt Hood is the second most climbed mountain in the world, behind Japan’s Mt Fuji. Climbers of all levels have successfully summited Mt Hood. I knew I could help Todd get to the top. I told him that if he’d pay for my ticket, I’d take the first flight to Portland and we’d get it done. I took the next day off, and Todd picked me up at the airport at 9:30 AM. We headed to the hotel, where we met up with Whit, Todd’s climbing partner on this expedition, and Lisa, who was in charge of community outreach and logistical support. I assured them that Todd would be safe, and that we would have a successful climb and get the expedition back on track. On the way to the lodge, we visited a family whose little girl had recently had her leg amputated. 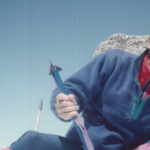 Todd has always cared first and foremost about inspiring others; the climbing came second. After dinner at the Timberline Lodge, as the sun was starting to set, Todd, Whit and I started our climb. We left about 8:00 PM, and climbed to Hogback Ridge, at 10,600 feet, where we made camp. 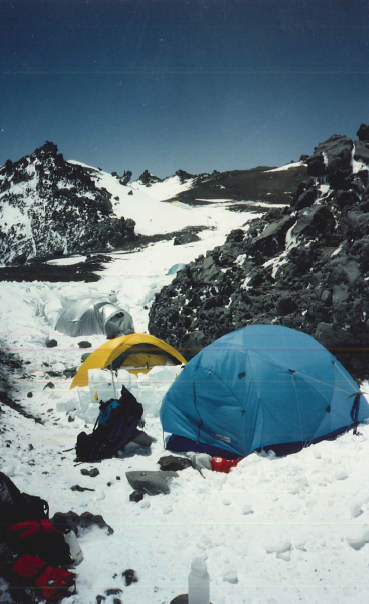 Our camp consisted of three ledges that we made with our ice axes, just wide enough for a pad and sleeping bag. We anchored our sleeping bags with our ice axes, and then we slept from midnight to 4:00 AM. At 4:00 AM, when the snow was at its coldest and safest, we roped up and began our summit push. The conditions were good. We came to an open crevasse with a narrow snow bridge. I crossed to the other side and anchored the rope to belay Todd and Whit. With one major obstacle behind us we now faced the crux of the climb – a steep narrow gully of ice and loose rock. I led the pitch. Todd and Whit were staggered behind. As debris fell from above, I repeatedly yelled ”ROCK!” to warn the climbers below me. We traversed carefully across the mixture of snow, ice, rocks, and mud as we approached the summit and were welcomed by a beautiful sunrise. We had done it. With smiles, high fives, and cheers, we took our summit photos, signed the registry, and started our descent. It was a race against the sun to get Todd and Whit down the mountain before the snow got too soft and warm, my main concern was the softening of the snow bridge. 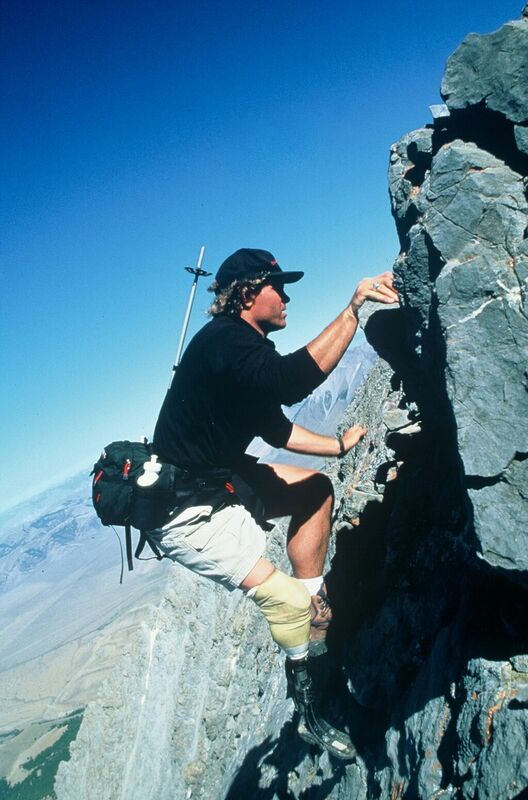 Todd glissaded down much of the mountain to speed up his descent and save energy from using his prosthetic leg. The clock was ticking. My flight back to Reno was leaving within hours of our summit. 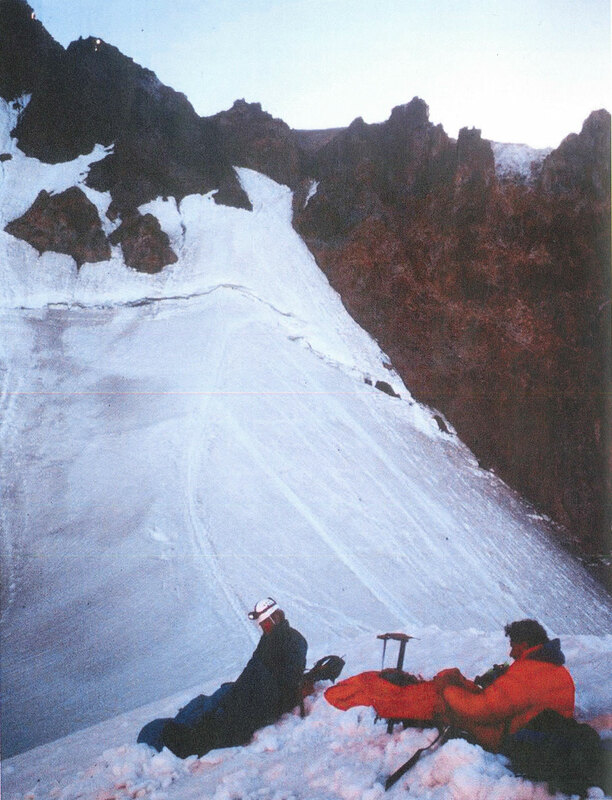 Once I got Todd and Whit got off the snow, I ran ahead and down the mountain to the Timberline Lodge to pack up our gear. Lisa and I loaded the truck and she revved the engine, urging Todd and Whit to hurry. They jumped in and we were off. Lisa had been tasked with getting me to the airport on time, and she took the challenge to heart, weaving the big red Ford pickup truck meticulously through the winding country roads. As we screeched to a halt in front of the airport, I said goodbye and wished Todd good luck, and then I ran for the gate. I arrived minutes before the flight took off, and was at work the next day. Todd successfully completed his “Summit America” project on the summit of Mauna Kea, Hawaii on August 7th, setting a new record of 66 days, 22 hours and 47 minutes. He became the first and only disabled person to break and hold an able-bodied world record. This opened the door for him to receive exposure in global media and thousands of publications, including Sports Illustrated and all of the major television networks. CBS did a story on him ten minutes before the Super Bowl, which was seen by tens of millions of people. Todd has numerous awards including having been named on the list of Ten Outstanding Young Americans (along with Peyton Manning). He has spoken at the Sydney Opera House, and has met with prime ministers and kings. A movie is currently in the works about his life and the “Summit America” project. I was—and I remain—proud of Todd, and happy to have been able to help him achieve his goal. Since high school, Todd and I have been together through a lot of ups and downs in life. This was by far the best “Up”! 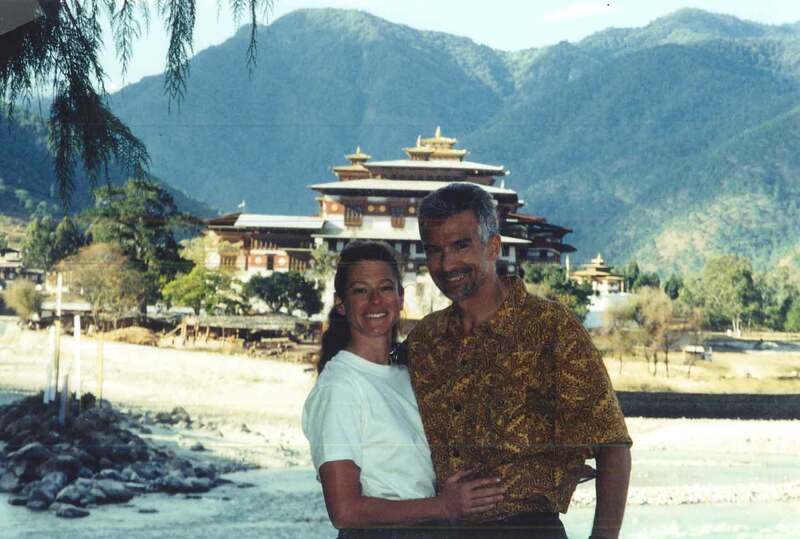 In August 2002, my wife Deb and I had just gotten home from a trip to Europe. 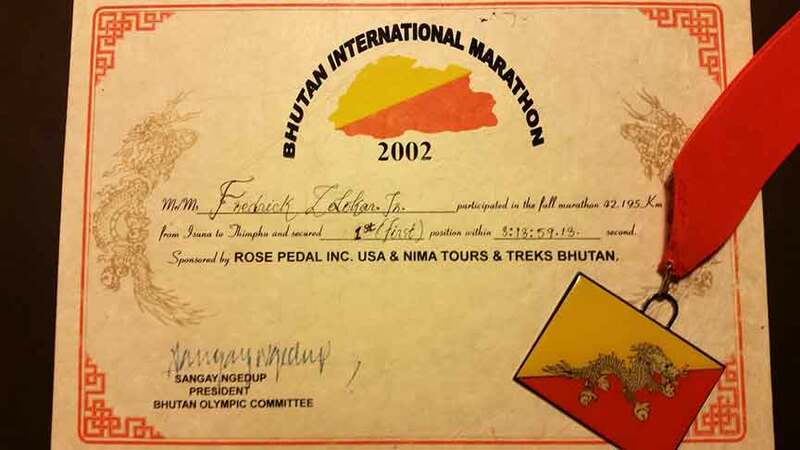 The following weekend, we were at our local running store in Reno, Eclipse Running, and I saw a flyer advertising the first-ever Bhutan International Marathon. It featured a picture of the Himalayas. Needless to say, I was interested. Very interested. When I showed Deb the flyer, she said something along the lines of “We just got home; I haven’t even gotten the laundry done from Europe!” I checked the date of the race and asked her if she could get caught up on the laundry by November 13th. Ultimately, we decided to check it out. The website on the flyer led us to a guy named Rick who was based in Portland. 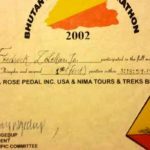 He was with a cycling company called Rose Pedal, Inc. who were working with Nima Tours & Treks in Bhutan. 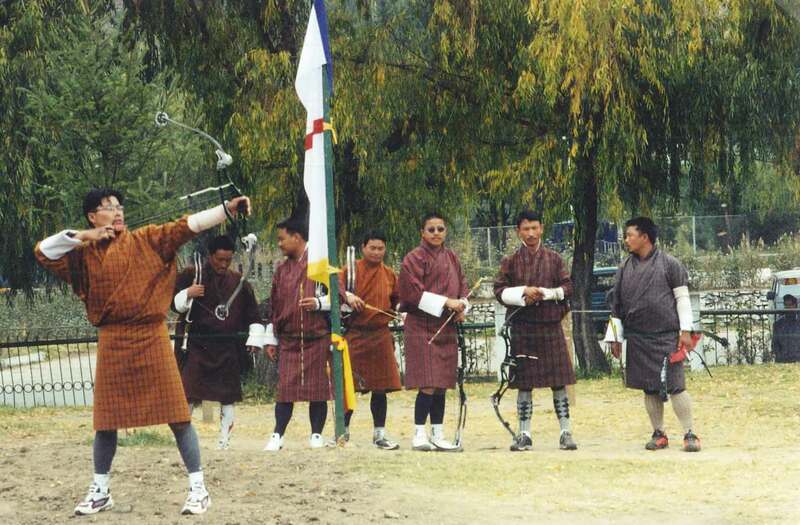 He was a cyclist himself, involved with the Bhutan Olympic Committee, and was working to bring 350 foreign runners to the race. He was helping to arrange visas, transportation, and other logistics. When we told him Deb wouldn’t be running the race (this pre-dates her marathon running), he asked if she’d like to borrow his bike and ride the course. She took him up on his offer, and we were going! 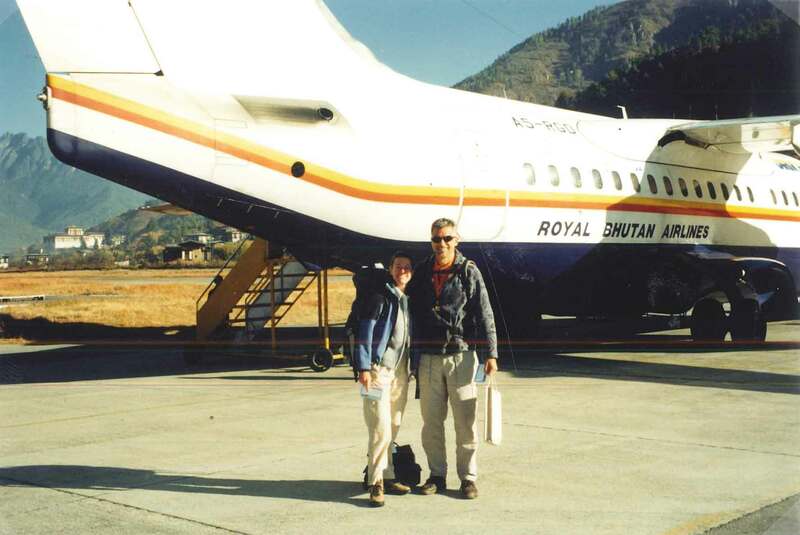 To fly to Bhutan (at least back in 2002) the only airline option was Druk Air, the national airline, whose planes were also the method of transportation used by the royal family and government officials. We flew to Bangkok and spent a couple of days sightseeing and then caught our flight to Bhutan. Flying in and seeing the profile of the Himalayas was so exciting. When we landed, we were met at the airport by a driver and guide who had been assigned to be with us for the entire trip. They gave us white prayer scarves and t-shirts with the race logo and welcomed us to Bhutan. Then, they took us to our hotel, where we met Rick. 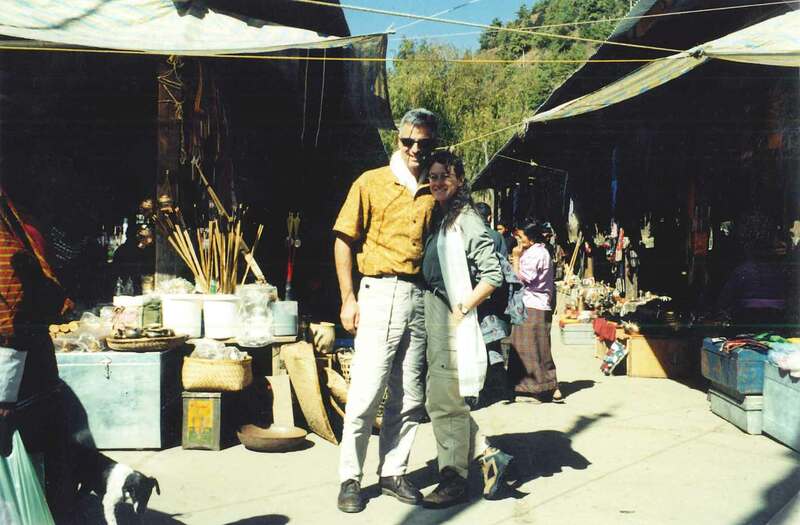 We had a couple days of sightseeing in the area around Thimphu, the capital. 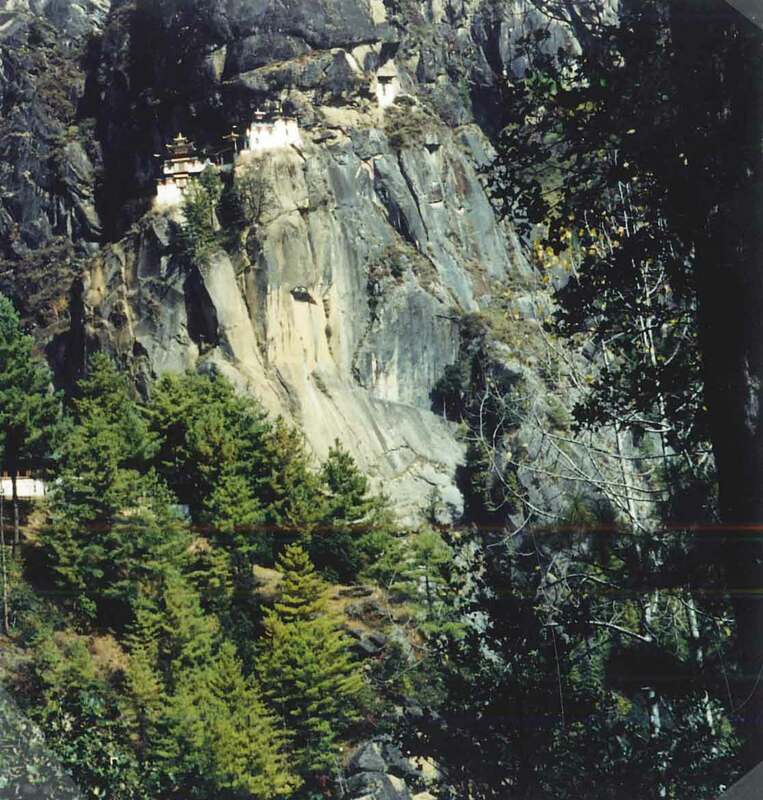 We visited the Tiger’s Nest Monastery and other traditional Bhutanese fortified buildings, known as Dzongs. We also spent some time hiking and watching Olympic athletes in an archery competition in the National Stadium. During this time, we also had a chance to meet the other foreigners who were running the race, as well as a few local athletes. 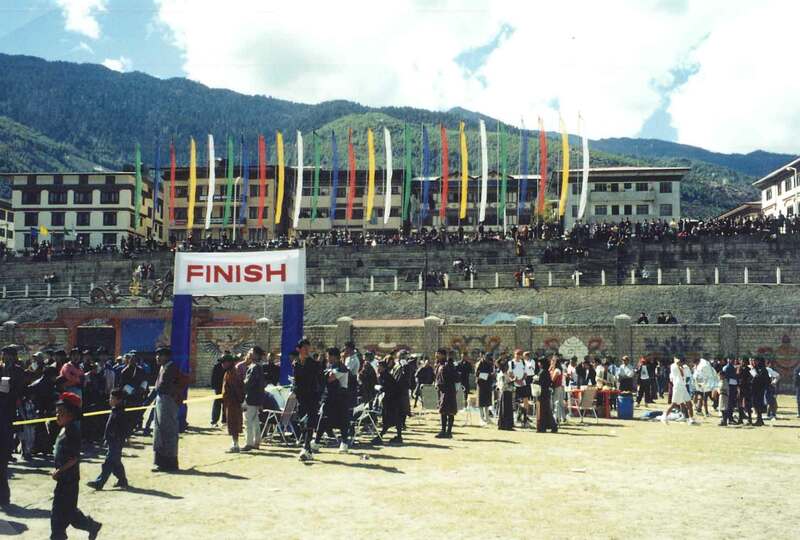 The day before the marathon, the local running community hosted a Friendship Run 5K in Thimphu. Deb ran, and because I was running a marathon the next day, I just jogged with her. The altitude was noticeable. The average altitude for the marathon (as I learned that morning) was 2300 meters—about 7500 feet. Race morning was spectacular. I will never forget it. It was the perfect combination of pre-race excitement, high altitude scenery, Himalayan culture, and nervous anticipation. 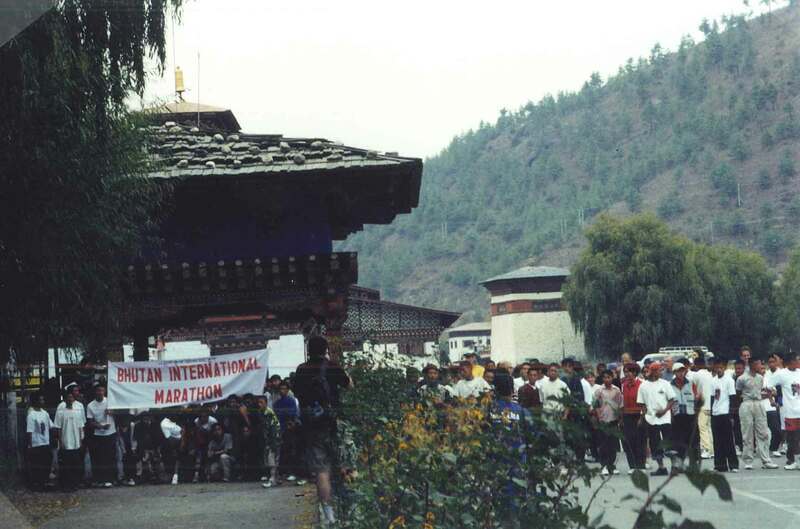 We assembled at the start line near the town of Paro before sunrise. 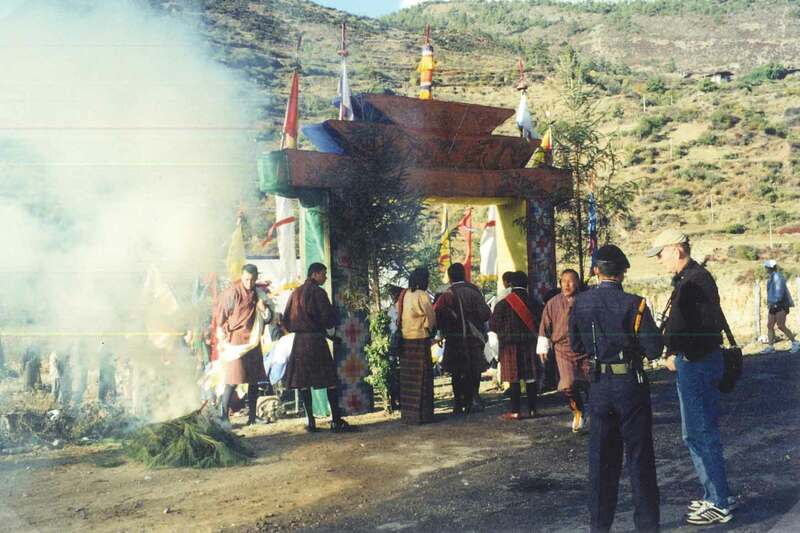 The race organizers had arranged a Buddhist puja ceremony to bless the race and bring safety and success to the runners. 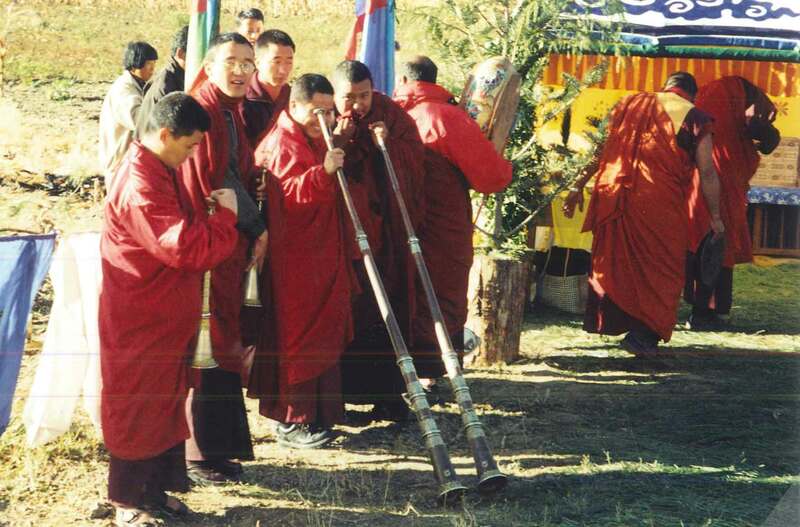 In addition to the prayers and the burning of branches, there were monks who played traditional instruments like drums and horns. The course was challenging but beautiful. While the contestants ran, Deb rode Rick’s bike and took pictures of the scenery, the runners, and locals cheering us on from the sides of mountain roads. With permission of the race organizers, Deb’s bicycle had a basket full of water bottles, and she was basically a mobile aid-station for a lot of thirsty runners along the course. Running into Thimpu, there were some young Bhutanese runners in front of me. They were Olympic hopefuls that I had met the day before, all of whom were really nice guys. I had joked with them at the Friendship Run that since I was old enough to be their father and since I only live and train at 1500 meters that they better finish in front of this old man. Three of them did. I was fourth overall and the first foreign runner. It was a great finish because Deb had the whole crowd yelling “FRED!” as I came to the finish line. After I finished, they gave both Deb and me medals, and brought me a chair and a bottle of water. It was first-class service. Later that night there was an awards ceremony and dinner with the Olympic hopefuls, the foreign runners, an Ambassador, members of the Olympic committee and the Director of Tourism. 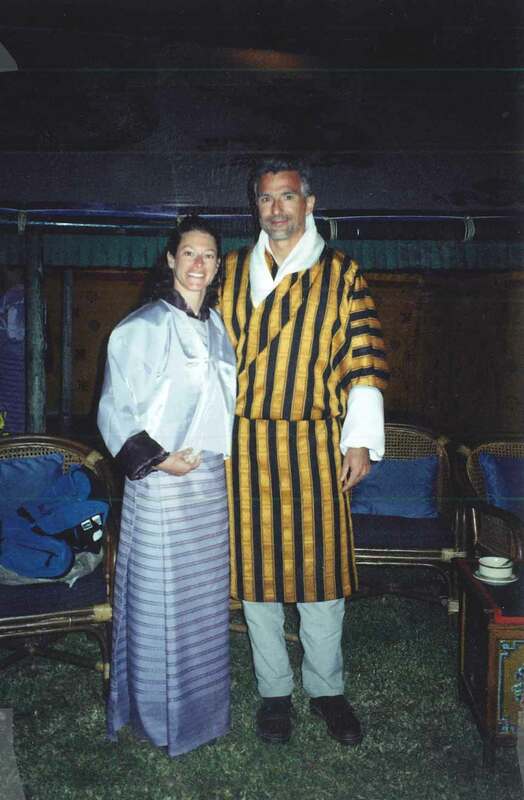 They presented all of the international runners with traditional Bhutanese dress: a gho for each man and a kira for each woman. With everyone wearing ghos and kiras, we had a huge dinner and a bonfire with singing and traditional dancing. After the race, we stayed in Bhutan for another couple of days, doing more sightseeing and hiking, before going back to Bangkok for our last days of vacation. 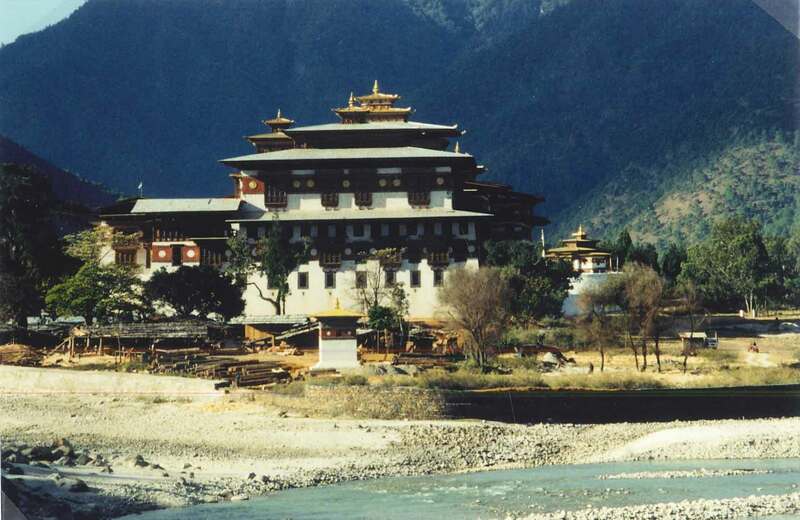 Visiting the Himalayan Kingdom of Bhutan was a great experience. 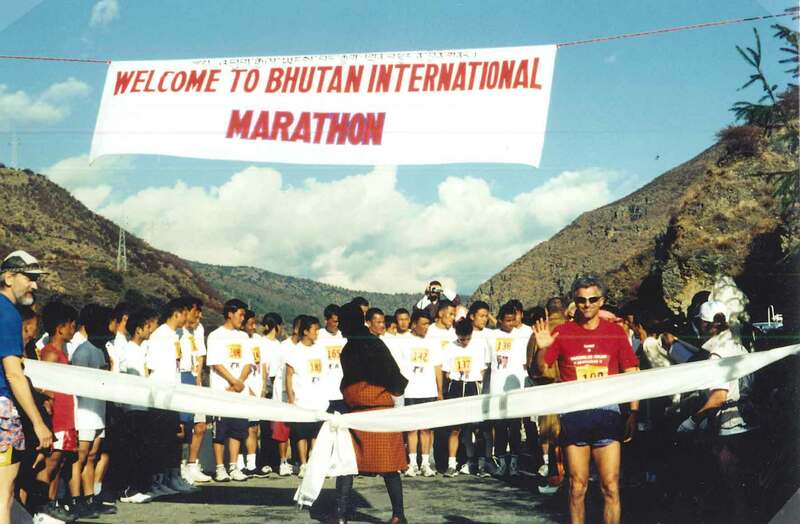 Running the first marathon in Bhutan was a worthy and memorable challenge. 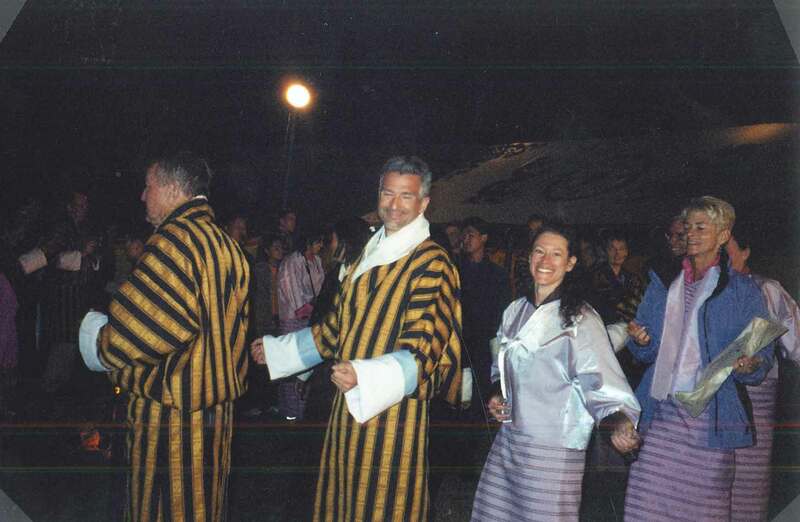 But hands down, participating in and experiencing the Bhutanese culture was the best part of the trip. It was an unforgettable, once-in-a-lifetime experience. 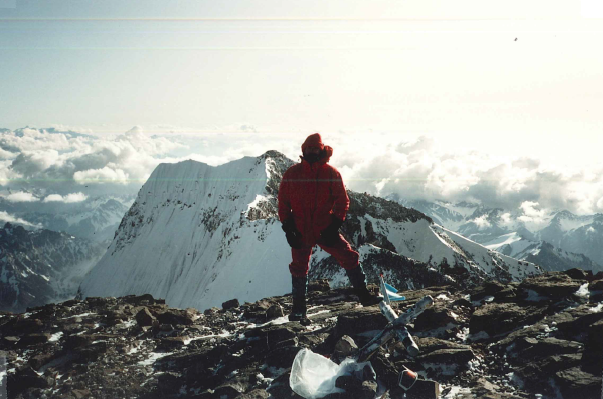 In December 1991, the highest I had ever climbed was the summit of El Pico de Orizaba, the high point of Mexico, at 18,700 ft. My new goal was to summit Aconcagua in Argentina. 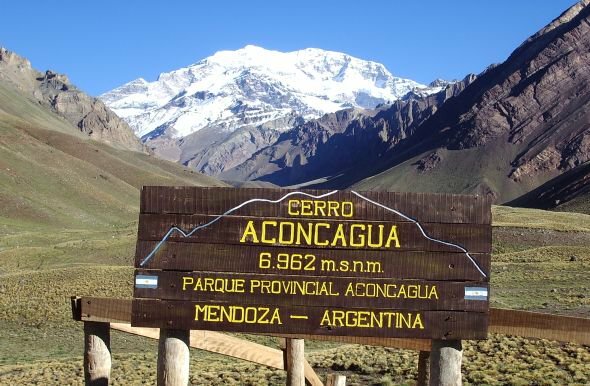 At a height of 22,841 ft, Aconcagua is the highest mountain outside of the Himalayas. 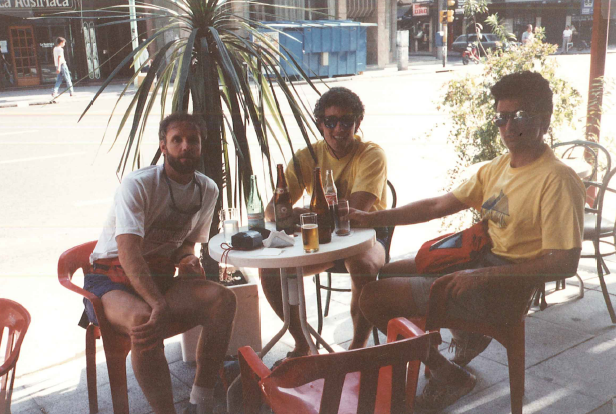 Our expedition party was made up of my friend Sean (with whom I had climbed Orizaba) and his friend Brian. We arrived in Mendoza, Argentina on Monday, December 23rd. 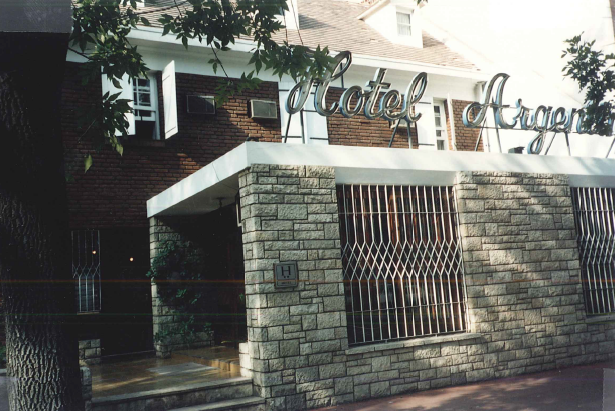 Our plan was to spend two nights in Mendoza, at the Hotel Argentina. After we checked in at the hotel, we went to get our climbing permits at the Office of Tourism, which was close to the hotel. We each paid $80 (USD) for our permits. Interestingly, the high season summit permit now costs ten times that! The weather was beautiful: sunny and in the nineties. We had dinner outside at an Italian restaurant and afterwards, we went to bed. The next day we went shopping for food and gas for our stoves—the usual pre-climb preparations. We organized and packed for the climb, and then we bought our bus ticket to Puente del Inca. We explored Mendoza a little bit and then rested and ate, getting ready to head out the next day. 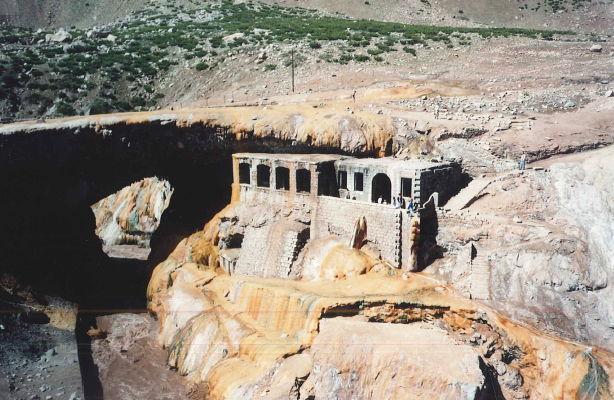 On Christmas Day we left Mendoza (2000 ft) and arrived at Puente del Inca (9000 ft). It was snowing at Puente del Inca, but we weren’t going to let that stop us. At Puente del Inca, we arranged to have mules carry half of our gear to base camp, which was at Plaza de Mulas. 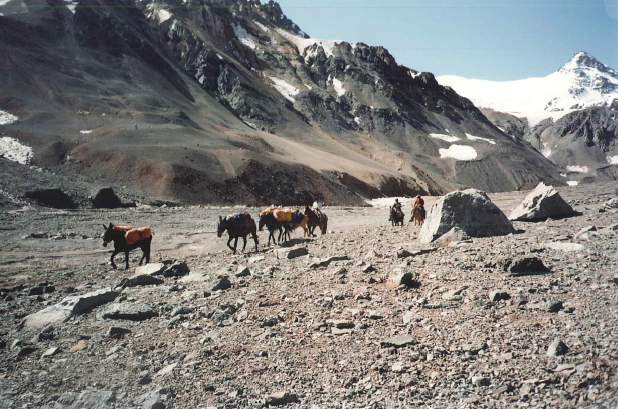 After making arrangements for the mules, the three of us caught a bus that was headed all the way to Chile; it dropped us off 4 miles up the road, at the beginning of the trail leading to Plaza de Mulas. Base camp was about 30 miles from where we got dropped off. We hiked in to just past Confluencia (about 10 miles) and spent the night. Even after sending some of our gear up with the mules, our packs were still fairly heavy; mine weighed 55 lbs. It was still snowing, so we didn’t have a view of Aconcagua (or anything else, for that matter). We ate and went to bed. The next day was the first full day of our expedition. We woke up to great weather. 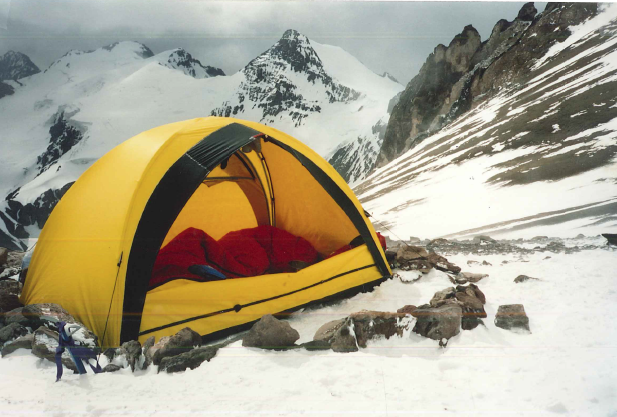 It had stopped snowing during the night, and we had an amazing view of the south face of Aconcagua. We were pumped up and ready to go. After breakfast, we broke down camp and started the 20 mile hike to Plaza de Mulas (14,100 ft). We arrived at base camp at 4 PM. We were surprised to see a huge lodge under construction at Plaza de Mulas. It looked like it was almost finished being built, but they told us that it wouldn’t be officially open full-time until the next climbing season. They did serve lunch and dinner, and sold ham sandwiches, snacks and drinks all day long. Brian, being a purist, didn’t want anything to do with the lodge. We had planned to climb without a lodge, so we decided not to use the lodge, or take any food from there. Instead, we found a good spot, set up camp, ate, and went to bed. We woke to another beautiful, sunny day and planned to do a little altitude training. We hiked to Camp Pendiente (17,400 ft), had lunch, and ran back to base camp, where we just hung out and relaxed for the rest of the day. The next morning, the weather was not as good as it had been the day before. It was partly sunny, snowing a little, and windier. Our plan was to start our ascent. Sean and Brian decided to carry partial loads up to Camp Pendiente and descend to sleep at Plaza de Mulas. I chose to take my whole load to Camp Pendiente and sleep there. When I woke up on Sunday the weather was mixed, so I decided to move up the mountain to Nido de Condores at 18,200 ft, taking all my gear with me. By the time I arrived at Nido de Condores, the weather had deteriorated. It was a real struggle to set up my tent in the wind and snow. I didn’t see Sean or Brian that day. I stayed in my tent the rest of the day and listened to my tent flapping in the wind all night long. The next morning the weather had taken a turn for the worse. It was still snowing, and even windier. I was getting very hungry, and pretty tired of my freeze-dried food. I started thinking about the new lodge at Plaza de Mulas, and about the food there. I decided I was going to the lodge. I left almost everything in my tent at Nido de Condores and arrived at our base camp at noon. I caught up with Sean and Brian and told them I was going to the lodge to eat. (I thought it would be rude to eat first without letting them know.) Brian wasn’t interested, but Sean went with me. We got to the lodge just before 1:00 PM, which was great timing because they were just about to start serving lunch. We had as much as we wanted; soup, bread, pasta, meat and dessert! It was awesome. The weather was still bad, so I decided to spend the rest of the day out of the elements, in the lodge. 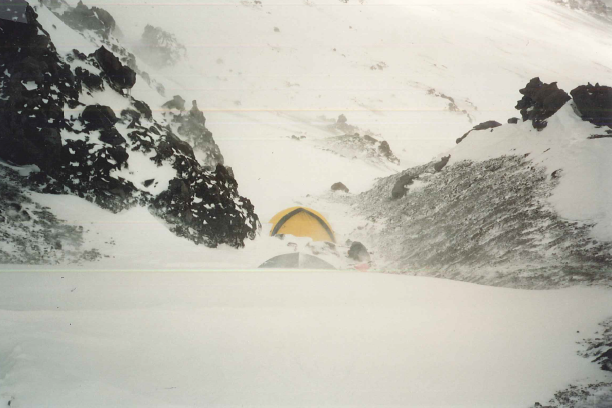 My original plan had been to descend to the lodge, eat, and go back up to Nido de Condores to sleep in my tent. I decided sleeping in the lodge was a better idea. Sean agreed. He went back to our base camp to let Brian know, and to pick up a few things. I stayed at the lodge, hung out, ate a ham sandwich and drank lots of sodas. Sean and a reluctant Brian showed up a little before 5:30, ready for dinner and a good night’s sleep. Dinner was at 8:30, and it was great! We woke up on New Year’s Eve and had a continental breakfast. Sean and I each took two ham sandwiches to go (Brian didn’t want any) and even though it was still snowing and windy, the three of us decided to go up to Nido de Condores. We went back to our base camp, and Sean and Brian packed up their stuff. My pack was very light, since nearly all my gear was already up the mountain. Sean and Brian carried partial loads to Camp Pendiente, where they picked up the supplies they had left there on the 28th. When we arrived at Nido de Condores, the weather was bad: snowing and windy. This wasn’t a problem for me, because my tent was already set up right where I’d left it. Sean and Brian struggled to set up their tent, but they got it done. Later, when they were in their tent and I was in mine, I was getting ready to eat. Out of nowhere, three climbers appeared at my tent and invited themselves in, saying that there was an emergency and they needed to stay in my tent. I let them in and told them that they needed to put their tent up. They said it was not possible because of the weather. I told them that we had just put up the tent next to me (Sean and Brian’s). They didn’t show any signs of wanting to go put up their tent. Frustrated, I took their tent, went out into the snow and wind, and started setting it up myself. When I was nearly done, the guy who seemed like their leader came out and helped me finish. When the tent was done, the other 2 came out of my tent and that was the last I saw of them. Finally alone, I ate a ham sandwich and went to bed. The next day was New Year’s Day, 1992! No college football for me. I spent the day in my tent, watching the snow and listening to the wind. When there were breaks in the weather, I went outside a little bit at a time; maybe a total of an hour outside my tent all day. I went to bed, hoping tomorrow would be a better day. There were a dozen people at Berlin, but they had decided to wait and try the summit tomorrow. Above Berlin, Sean and I were alone on the mountain, just the way we liked it. The route was easy to follow, and there wasn’t much snow. I guess the wind had blown it away. At the bottom of La Canaleta, we ran into 3 Japanese climbers. 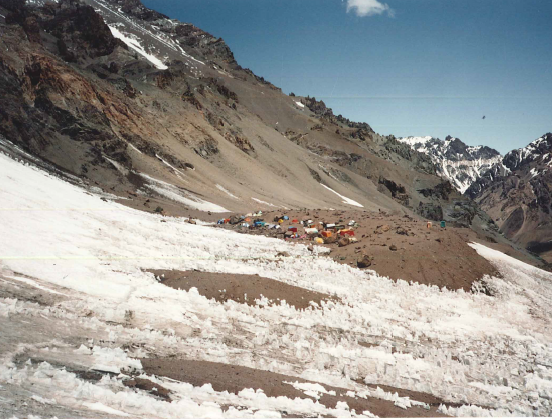 They had abandoned their summit attempt and were sitting on the ground (in the snow), smoking cigarettes at 21,000 ft. Sean and I pushed to the summit, standing on the top of Aconcagua in the late afternoon of January 2nd. It was nearly 5 PM by the time we got to the top. We hung out, took pictures, and enjoyed the view. We headed down, and by the time we got to Berlin, it was starting to get dark. When we got back to Berlin, there were about 50 people there. With the better weather, they had all moved up the mountain to Berlin, with a plan to go to the summit the next day. It was like a little village. Since we were the only ones to summit that day, everyone wanted to talk to us. Sean took off and headed down to Nido de Condores, but I hung out, had a drink, and answered questions about the conditions above. It was dark by the time I left Berlin, so I wandered off the trail a bit. In the dark, I nearly walked off the edge of a cliff. When I realized that the edge of the cliff was nearly under me, I grabbed a rock formation to try to steady myself and keep from going over. I was able to stop myself, but I watched my red Marmot Snow Goose sleeping bag sail away and disappear into the darkness of the abyss. I still miss that bag. I knew that I needed to find my tent. Of course, I headed away from the cliff. In the distance, I could see a light. Soon, I realized that the light was in fact, a tent, and I continued to head towards it. When I finally got to the tent, I said “Hello?” Four Japanese women inside unzipped the tent and invited me in. They didn’t speak much English, but were unbelievably nice to me! They fed me, offered me plenty to drink, and we all spent the better part of the night talking with our hands. They re-arranged their sleeping bags and let me spend the night in their tent. At first light, I looked outside. It was a glorious day: blue sky and no wind. It was only then that I realized that I was at Camp Pendiente! I said my goodbyes, and headed back up the mountain to Nido de Condores. When I got there, I yelled to Sean that I was back, and went into my tent and started packing up my stuff. About an hour later, I got together with Sean. He asked what I had meant when I yelled that I was “back”. I laid it on thick about spending the night in a tent with four Japanese ladies at Camp Pendiente. I didn’t know if he believed me or not, but I knew we’d run into them on our way down. 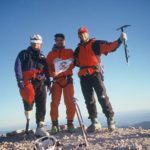 Sean and I were heading down to Plaza de Mulas, and Brian had decided to stay at Nido de Condores and make a summit attempt the next day. On the way down, we ran into my friends from the night before, which validated my story. We got down to the lodge just in time for lunch! 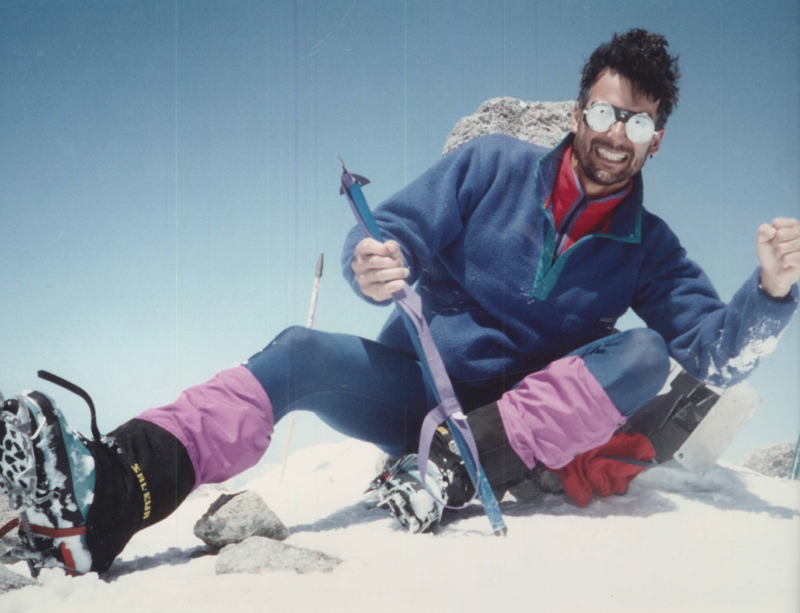 Since Brian was making a summit attempt the next day, Sean decided that he would run up to the summit from Plaza de Mulas, taking a shot at the mountain’s speed ascent record. I decided that chilling out at the lodge and eating good food was a better plan. Sean and I spent the night in the lodge. On the morning of January 4th, Sean took off running up the mountain. I wished him luck and went to breakfast. Around 2 PM, Sean and Brian got back to Plaza de Mulas. Neither had been successful in reaching the top. I said, “Let’s get out of here,” and Sean agreed. Brian decided to stay another night, and Sean and I started preparing to leave. We made arrangements for the mules to carry all of our gear. The mule wangler told us that it was too late in the day for us to get to Puente del Inca. We asked if the mules could make it, and he said “No problem.” We told him that we could do it in under 4 hours. He took our money and said “okay”. I’m pretty sure he didn’t believe us, but we ran alongside them and kept them in sight most of the way. 4 or 5 miles before Puente del Inca, a pickup truck drove towards us. The mule wrangler took our bags off the mules and threw them in the back of the truck and then we got in the back, too. We bounced along the dirt road until we got to the paved road that took us to Puente del Inca. We got dropped off at the hotel in Puente del Inca. We got the last room available for the night, had a big dinner, and went to bed. After we checked out of the hotel the next morning, we explored the ruins of the Incan Baths and took the bus to Mendoza. Brian arrived in Mendoza 2 days later. 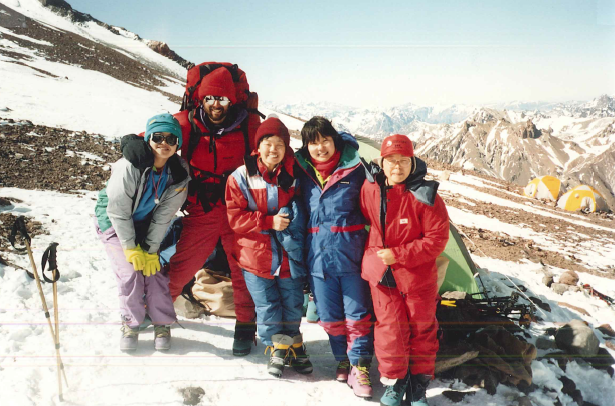 My Aconcagua climb was the first of many trips to South America, as well as being the first successful attempt at one of the Seven Summits. 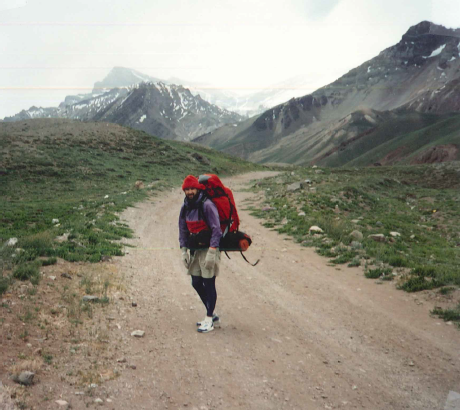 I found the Aconcagua area beautiful and easily accessible. The climb, via the Normal Route, is not technical, so the biggest challenge is successfully handling the altitude. 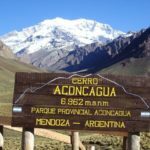 For all of these reasons, I highly recommend an Aconcagua climb as a goal for aspiring mountaineers. In the summer of 2015, my wife Deb and I were planning our next adventure. I was looking for a new country, an interesting high point, and a trip that would be outdoors-oriented. Deb was interested in wildlife viewing, and she suggested we find somewhere in Africa. 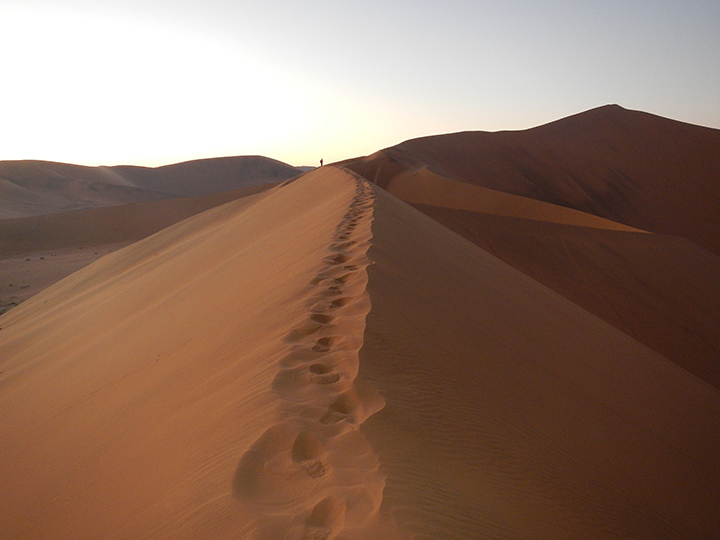 We decided a trip to Namibia would tick all the boxes. 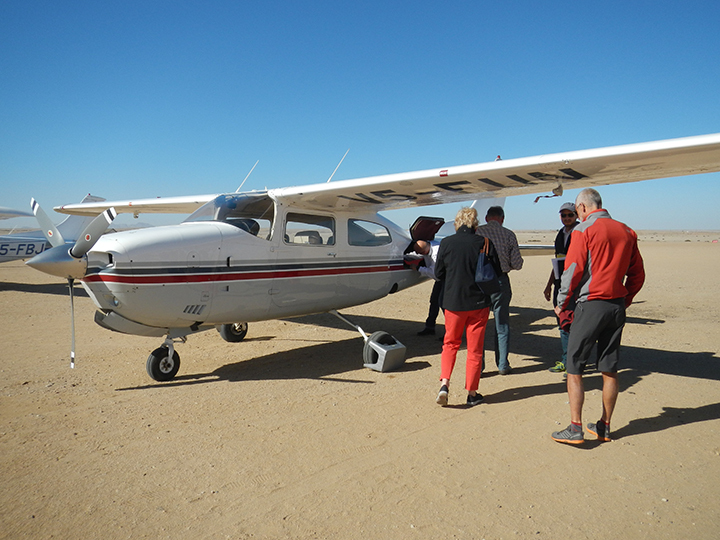 In June, we flew to Windhoek and rented a car. 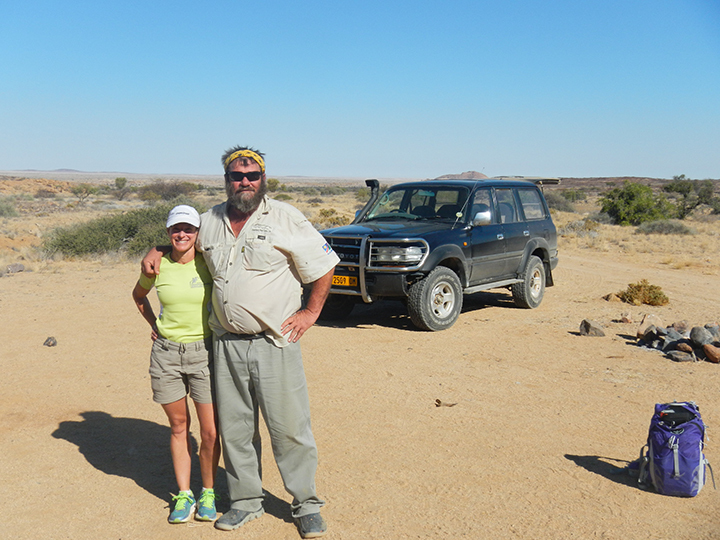 For the most part, Namibia’s road system is very good, and I was looking forward to driving all over the country. 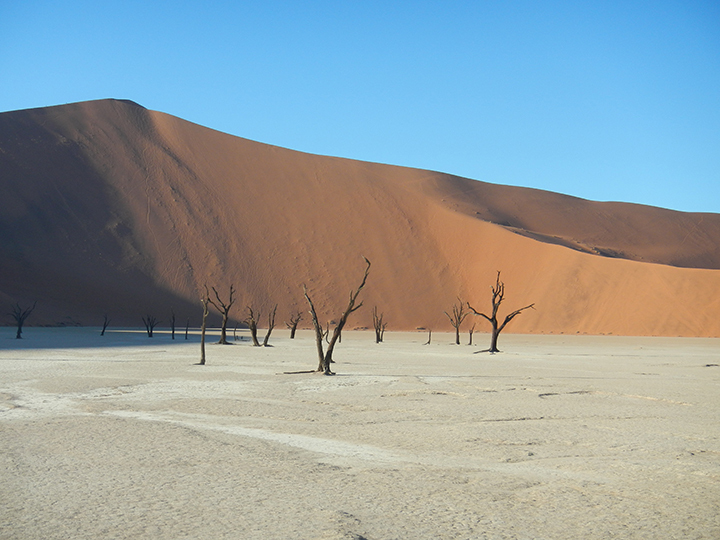 We headed to Sossusvlei, a part of Namibia that has huge, beautiful sand dunes bordering something called the Dead Vlei, where the skeletons of dead trees are scattered on a pan of dried mud. We stayed at Sossus Dune Lodge, in the park. 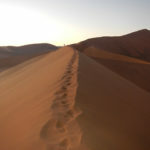 After checking in, we went out and climbed one of the sand dunes, Dune 45, before having dinner and going to bed. 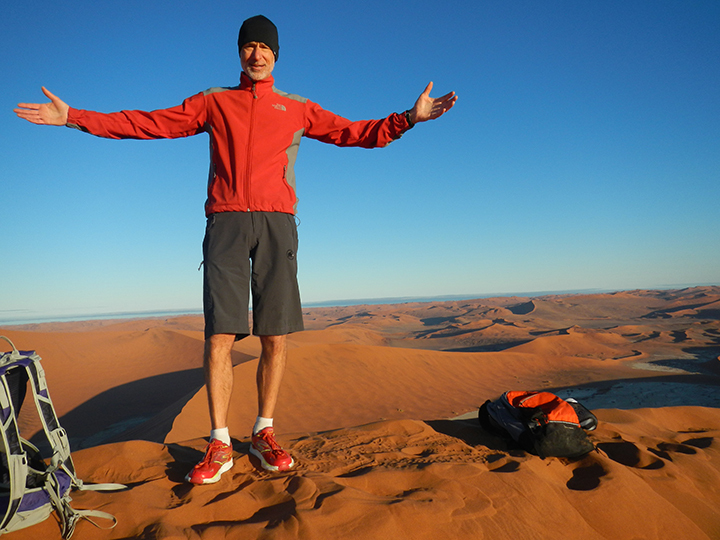 We got up early the next morning and headed to the trailhead to hike in to “Big Daddy,” the tallest dune in the area, which is adjacent to the Dead Vlei. We started hiking in the dark, and were on top of the dune before the sunrise. When the sun came up, the view was spectacular. 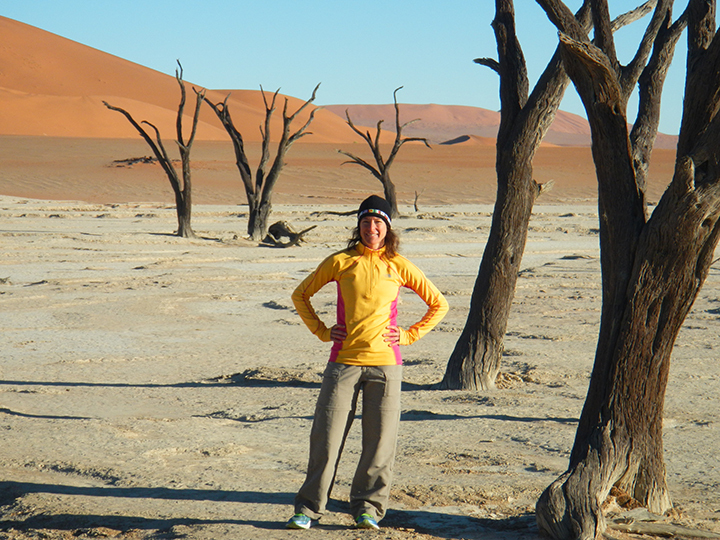 Then we ran down the back side of the dune, skating and sinking through the sand, right into the Dead Vlei. Walking through the dead trees in the pan was surreal, like being on another planet, with the red dunes rising up on all sides. We were there so early that we had the whole pan to ourselves for a little while, just sharing it with a couple of indigenous oryx called gemsbok, before the other tourists appeared. 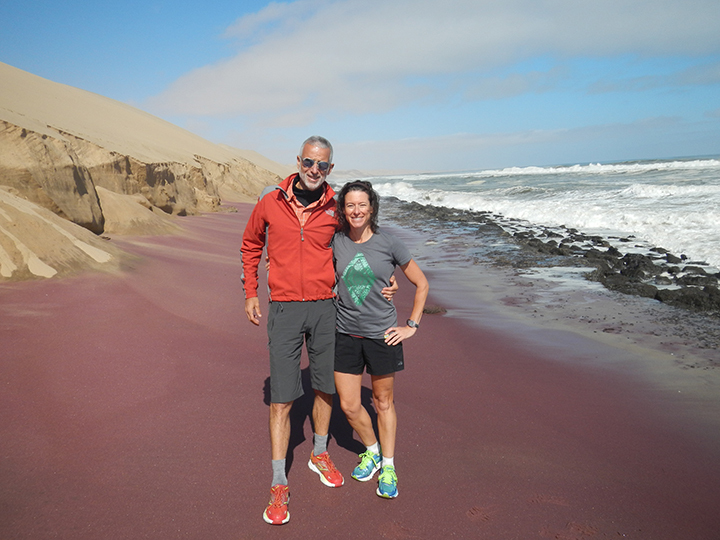 We headed north, to the coast to Swakopmund. 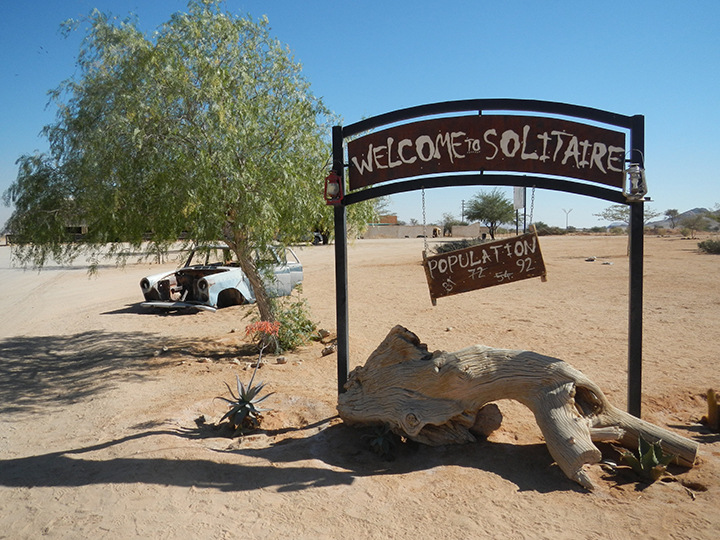 On the way, we stopped for gas and the best apple pie that I’ve ever had, in Solitaire. 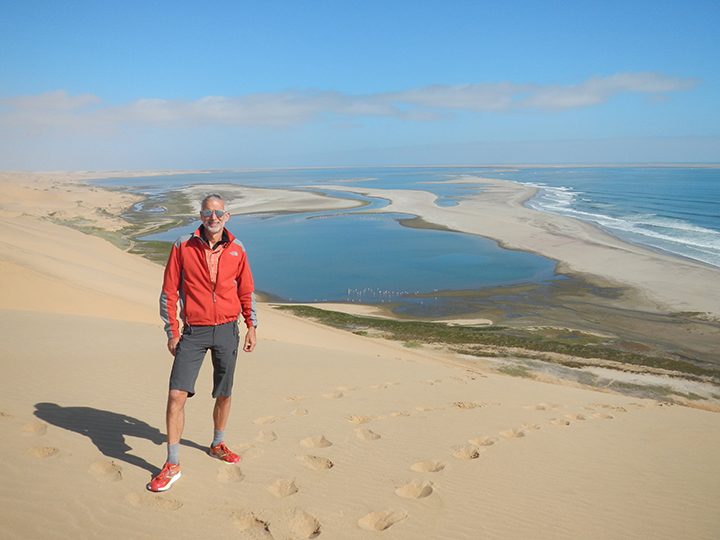 In Swakopmund, we explored the coast with a guy who drove us over the sand in a Land Rover, and took us to a place where we climbed a nearly vertical dune overlooking the ocean. 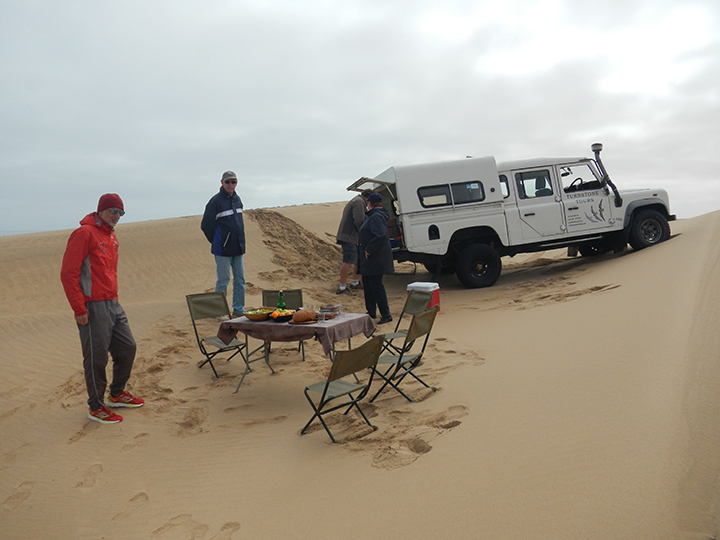 He drove the vehicle up the other (more gentle) side of the dune and we picnicked on top of the dune, with the best lunch view in the country. On the drive down, we bounced and slid through the sand. 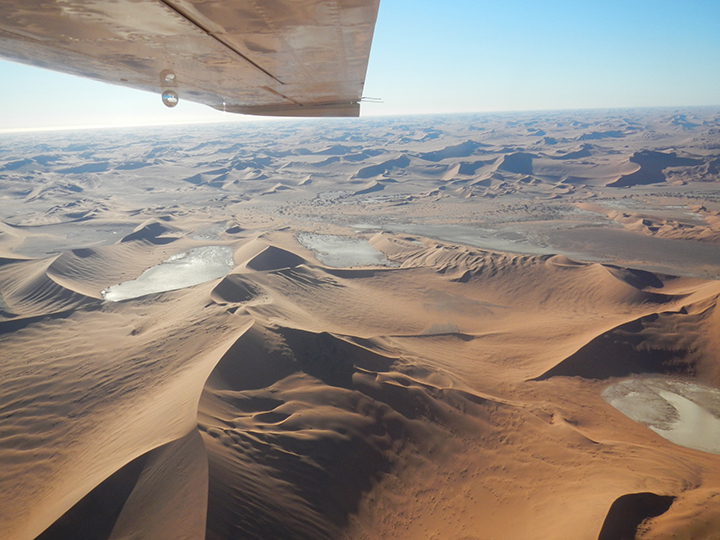 The next day, we went on a three-hour flight in a six-seater plane (two pilots and four passengers) over the dunes and along the famous Skeleton Coast. From the air, we could see all the different colors in the dunes—red, yellow, gold and white—and thousands of cape fur seals lying on the beach. 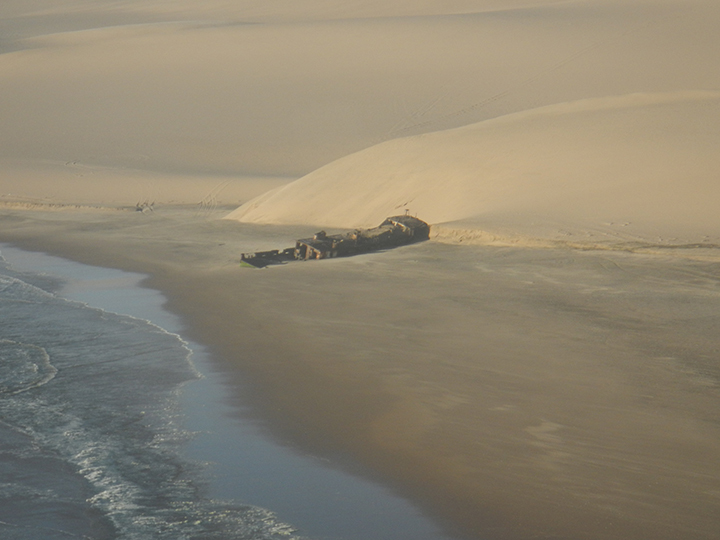 We flew over the remains of old diamond mines, which were almost buried in the sand, as well as two shipwrecks. Over time, the shipwrecks had started slowly moving inland, as the sand from the dunes is gradually expanding the shoreline out into the ocean. It was a beautiful, breathtaking experience unlike anything we’d ever seen. After the aerial tour, we continued north to Uis. 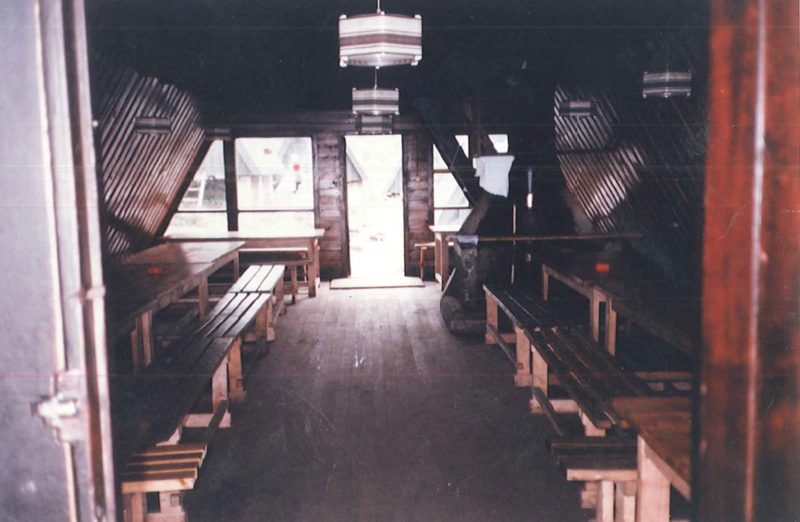 Our destination was the Brandberg Rest Camp, owned and managed by a man named Basil Calitz. 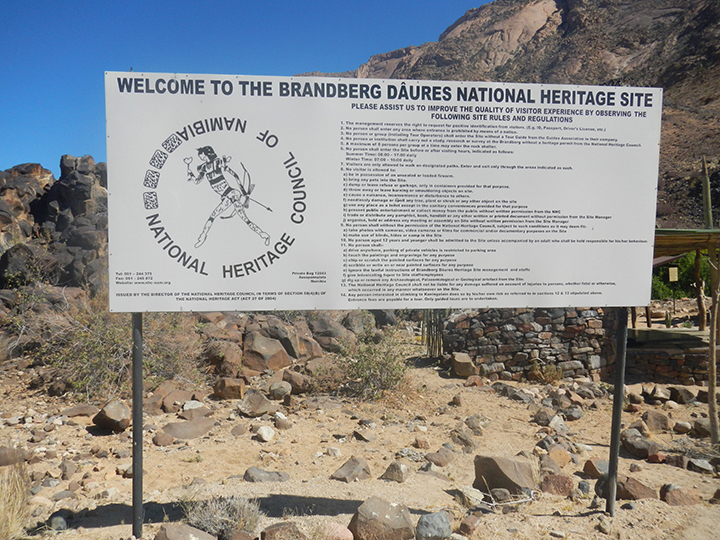 I had talked with Basil online prior to our arrival, and he had taken care of all of the paperwork to arrange my climbing permit through the National Parks service for the Brandberg (Burnt Mountain), the high point of Namibia. The Brandberg’s highest peak is Konigstein, at 8550 feet. 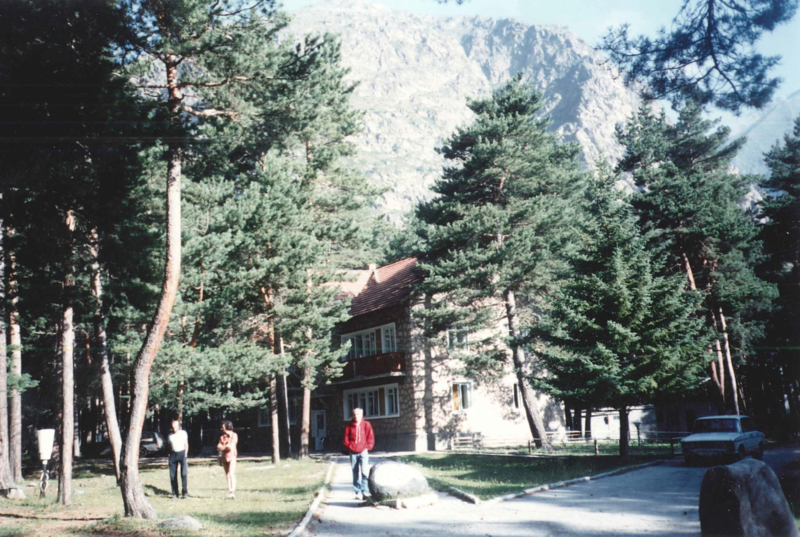 Typically people spend three days and two nights in order to summit Konigstein. 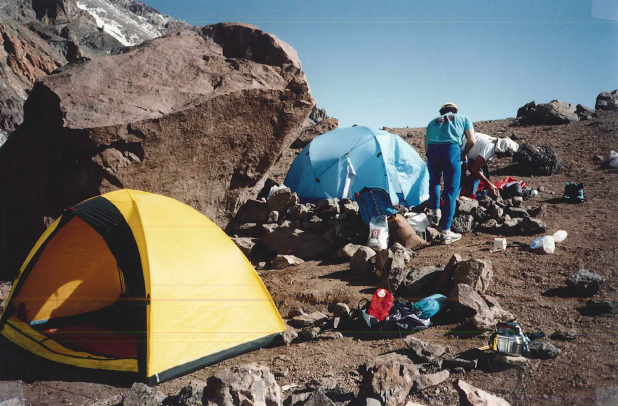 They hike to a camp, spend the night, summit the mountain the second day, and return to spend the second night at the same camp. They descend on the third day. Naturally, I was not interested in spending three whole vacation days climbing a 8550-foot peak that required no technical skills. After we checked in at the Rest Camp and met Basil, we drove to the park office to pick up my permit. 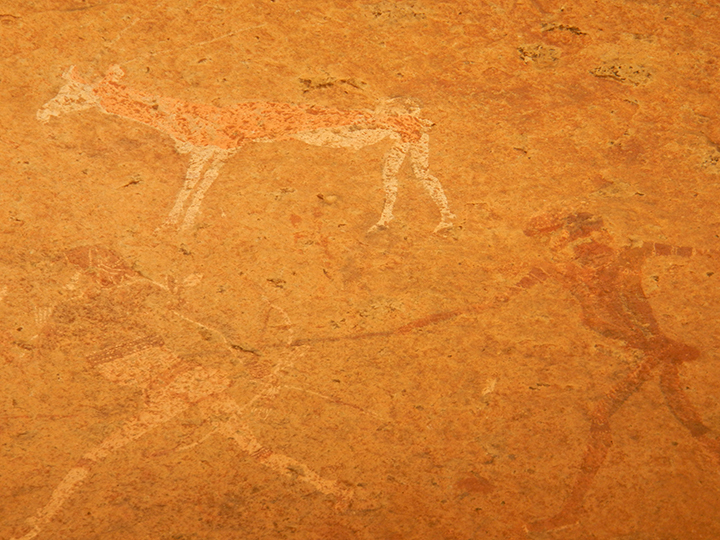 While we were there we hiked into the park to see “The White Lady of Brandberg,” a famous rock painting. The next morning, we had breakfast with Basil. My guide, John Taniseh, met up with us at the hotel. After breakfast, Basil, Deb, John and I drove to the trailhead. John and I started our climb. While John and I climbed, Basil and Deb drove all over the area, looking at geological sites and watching for wildlife, having a picnic lunch outside with zebras looking on. The climb was straightforward, and relatively easy. The trail was well marked, and it was a beautiful day. John initially seemed skeptical about the single-day expedition, but I let him set the pace, and we were on the summit in about 4 hours. We spent about half an hour on top, and then headed back down. When we arrived at the trailhead, Deb and Basil were waiting for us. They’d set up an outdoor barbecue, called a braai; they were already grilling steaks and had cold beers ready for us! Basil shook my hand, and congratulated me. Unbeknownst to me, he had started his watch when we began our ascent, and he told me that he clocked us at 8 hours and 6 minutes round-trip. He informed me that this was a new record. I thought to myself that if I’d known I was trying to establish a record, I wouldn’t have hung out for half an hour eating lunch and taking pictures, and I would have run the downhills! That night at dinner, Basil presented me with a framed photo of John and me with the date, and our record-setting time printed on it. He hung a copy in the hotel bar, and he had one made for John, too. That picture hangs in my office now. 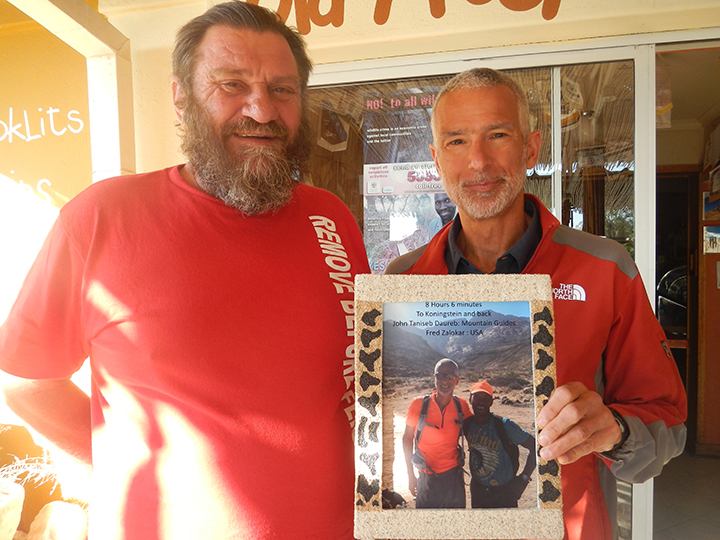 It was such a thoughtful gesture, and I could tell that he was really proud to have been a part of our expedition. 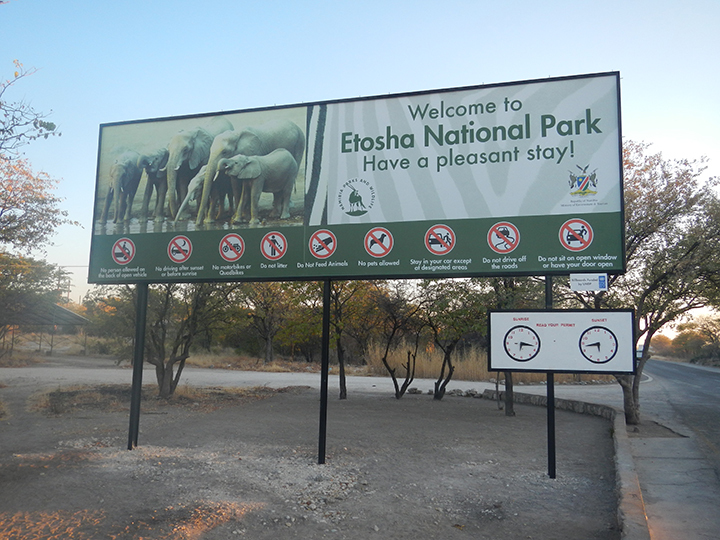 Our next destination was Etosha National Park, further north. We stayed at Okaukuejo Rest Camp, in the park. 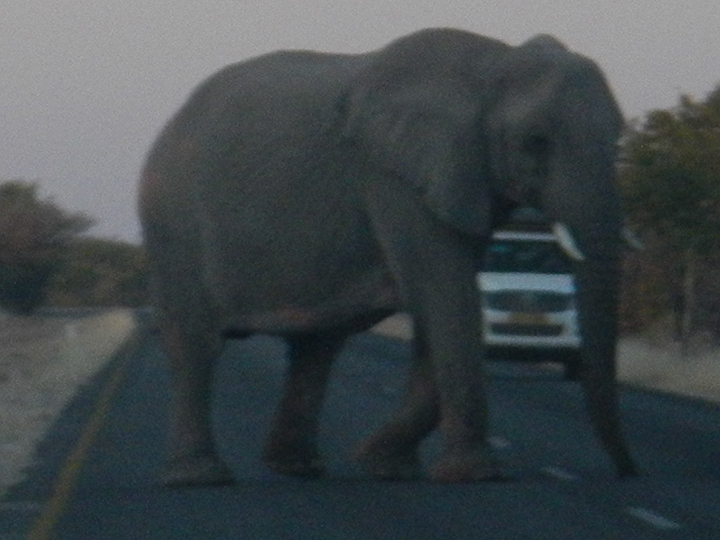 This allowed us to sit outside at the watering holes after dark, which was an incredible opportunity to see wildlife. 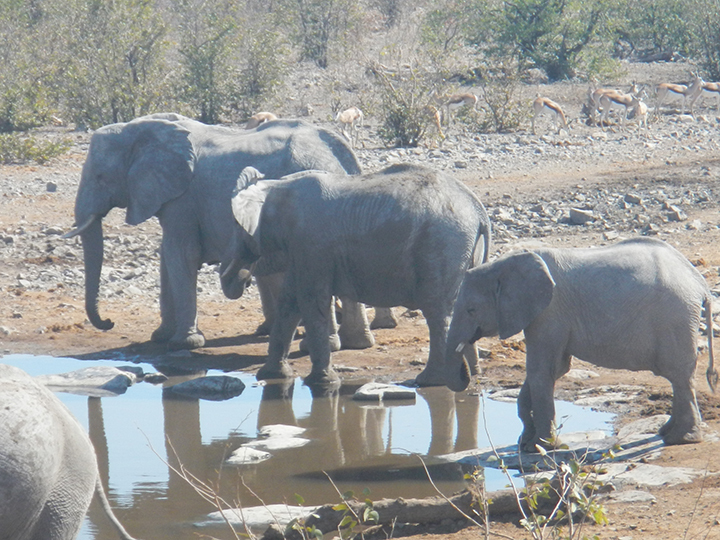 One night we saw three rhinos and seven elephants at once, all sharing the watering hole with zebras, antelopes, and giraffes. During the day, we drove through the park, stopping at watering holes or just pulling over to the side of the road, watching lions, rhinos, giraffes, warthogs, elephants, ostriches, cape buffalo, wildebeest, hartebeest, impala, springbok and gemsbok. 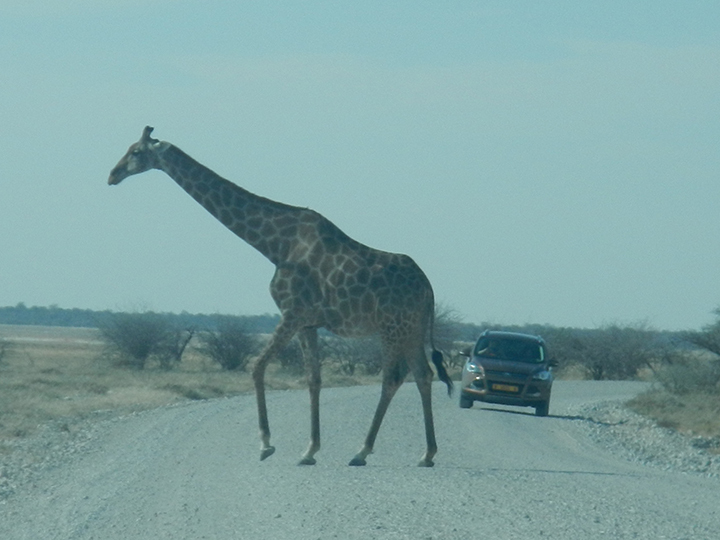 My favorite thing about Etosha compared to other African wildlife parks that I have visited, was that we had complete autonomy; we could drive ourselves everywhere. The only rule was “Don’t get out of your car!” It’s a good rule, and we were happy to follow it! 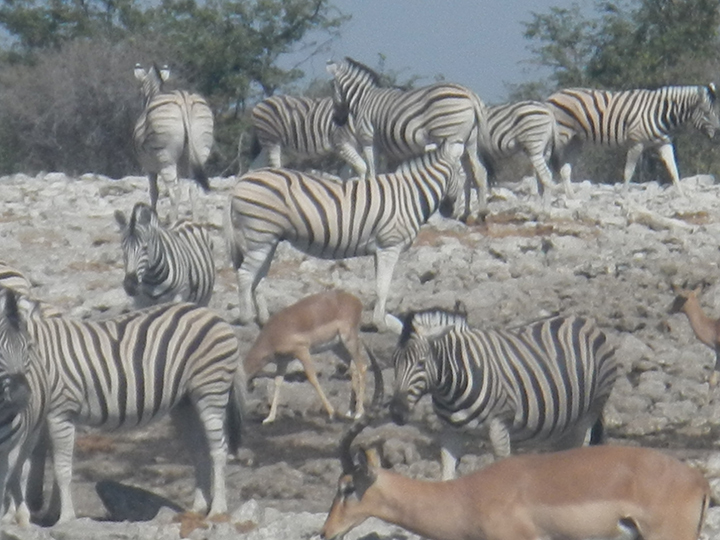 When we left Etosha, we headed back to Windhoek. While I was checking in at the hotel, Deb was walking around the lobby and started flipping through the newspapers, many of which were in Afrikaans. Behind my back, I heard her start laughing, and she said, “Hey, Fred…”. 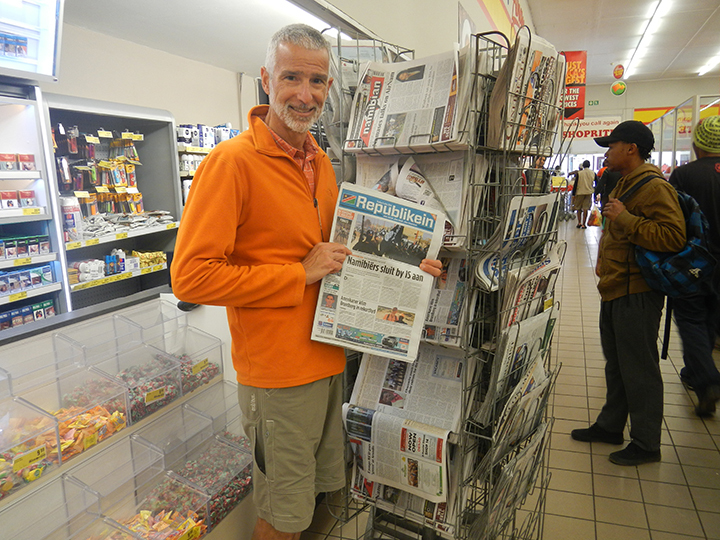 On the front page of a Namibian newspaper called the “Republikein” was a picture (taken by Basil) of John and me! The article was in Afrikaans, and was titled “Amerikaner Klim Brandberg in Rekordtyd” (American Climbs Brandberg in Record Time). We showed the picture to the guy at the hotel’s front desk, and he was pretty impressed. He shook my hand, read us the article (translating it into English), and let us keep the paper! Later that day when we went into town to eat and do a little souvenir shopping, we were in a grocery store, and we saw a rack of the “Republikeins”. The next day in the airport, 2 different men came up to me, and asked me if I was the American from the paper. They shook my hand, and congratulated me. I felt like climbing royalty. That newspaper front-page is one of my all-time favorite souvenirs! While I was following my goal to run a marathon on each of the seven continents, my wife Deb started running marathons as well. 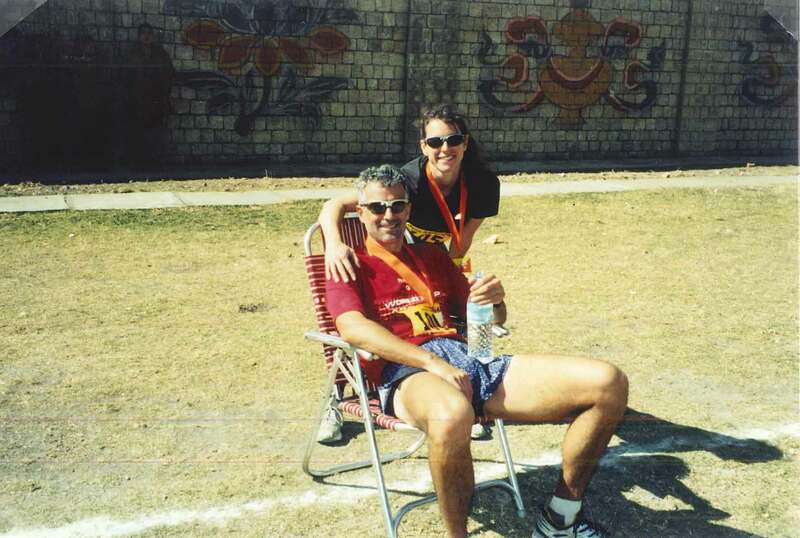 Deb decided that she wanted to qualify for, and run, the Boston Marathon. At the time, that didn’t sound interesting to me at all. She ran Boston in 2009, with a friend, and I stayed home. When she came back from Boston, Deb changed tactics. She told me about the Marathon Majors—Boston, New York, Chicago, London, and Berlin—and said that her new goal was to run these five races. 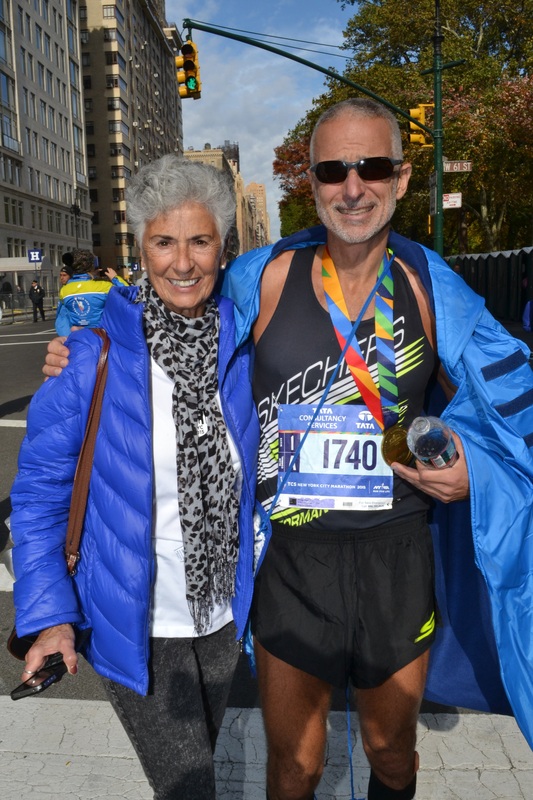 Specifically, she started trying to get me interested in running the Berlin Marathon, knowing that I had traveled extensively through Germany but had never been to Berlin. It was a flat, fast course, she said, unlike Boston. 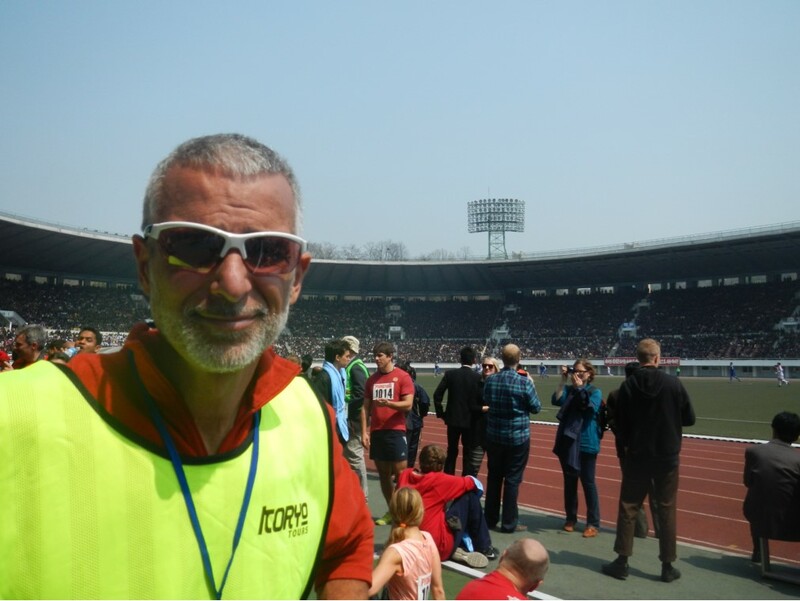 I would be 50 the following year; maybe I could run a marathon PR at age 50 in Berlin? I started to give the matter some thought. I committed to running the 2010 Berlin Marathon, and we both registered. As part of my training, I started to make some adjustments to my running. I changed my running mechanics from being a heel striker to a midfoot-striker, switching my shoes to facilitate that change. I also started to focus on dropping weight. These changes made a big difference in my training for Berlin. 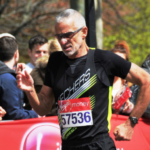 I averaged between 125 and 140 miles a week for three months, but I was much less sore than I had been previously, even when I’d been running lower mileage. When I got to Berlin, I was ready. We had a few days of sightseeing (in the rain) leading up to the race. On race morning, it was still raining, and it rained for the entire race. There was nothing I could do about the weather, so after the first couple of miles, I just relaxed and ignored it. The course was as flat as I had hoped, and I ran well. I ran a 2:37:03, and surprisingly won my age-group (which, at the time, was Men’s 50-54.) I was hooked. Actually, I’m still hooked. I haven’t really slowed down since Berlin. Eating a pretzel after the race, I told Deb that my new goal was to run all 5 Marathon Majors. She was psyched; we were going back to Boston. We went to Boston in 2011. Boston is a much hillier course than Berlin, so I adjusted my training accordingly. I ran more downhills and did my treadmill workouts with a downhill grade. I averaged 140 to 150 miles per week for 3 months. 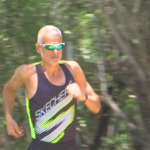 With the hills on the course, I didn’t expect to run a fast time; I was focused on trying to win my age-group. 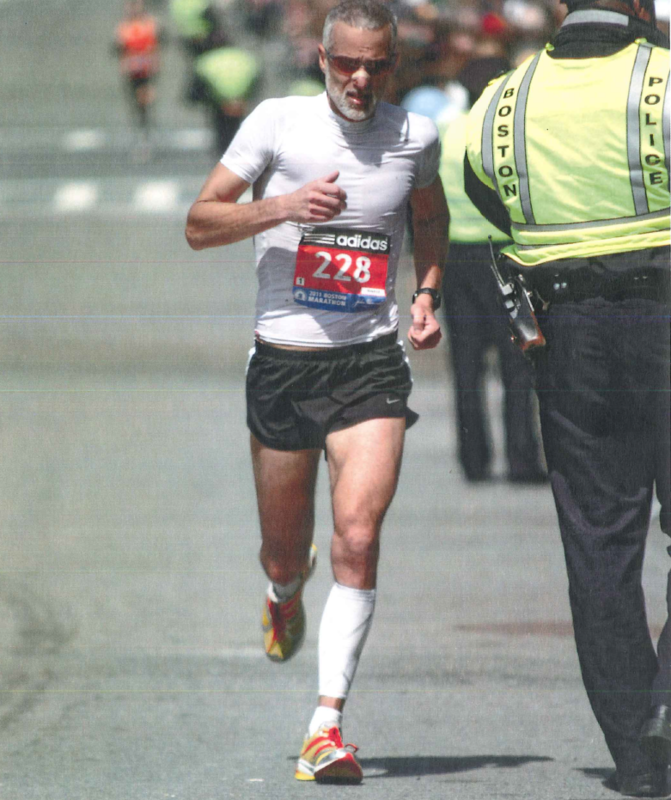 As it turned out, I ran a personal record that day: a 2:34:46. And I did win my age-group. The awards ceremony after the race was fun, and it was cool to stand next to, and meet, Joan Benoit-Samuelson, who had won the Women’s 50-54s. The next stop was New York. That was a tough race. Although my training for New York was similar to my training for Boston, I wasn’t feeling 100% on race day. I had an injury on the bottom of my right foot, and while I was able to run well for the first 10K, the rest of the race was not good. I finished in 14th place in my age group, with one of my slowest times ever: a 2:50:44. I knew I could do better, and I wasn’t happy with my time or my place. In the back of my head, I thought that someday I’d like to go back for another shot at it. Not right away though, because I was already committed to run London in April of 2012 and Chicago that fall. London, like Berlin, is a flat course, so I adjusted my training. I focused on turnover and flat training runs, running 140 to150 miles per week for 3 months. I ran decently, and I was 3rd in my age group with a 2:37:35. That took some of the sting out of my New York race, but I knew I could do better. I was going to figure some things out and make some changes in the 6 months between London and Chicago. I got my foot completely healed and added more speed work to my training. 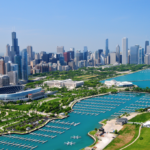 Chicago is a flat course, so I continued training fast and flat, focusing on turnover. I dropped a few more pounds, too. I was healthy, I was well trained, and I was incredibly focused mentally. I wanted to run fast, and I wanted that age-group win. I was able to accomplish both. I won my age-group with a 2:35:10, and was 5th Masters overall. I was happy. The Marathon Majors had been a worthwhile goal. 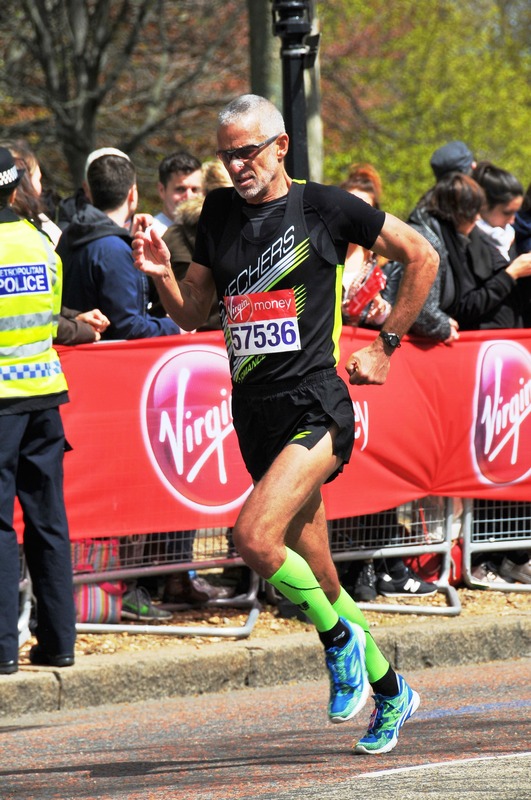 I had actually enjoyed being part of the large fields (with more than 40,000 runners) and the excitement that the Majors conjured up. I had challenged myself, facing the challenges that the individual courses had offered, while maintaining a high level of training and mileage from 2010 to 2012. I had picked up 3 out of 5 age-group wins, and been on the podium 4 out of 5 times, facing some of the toughest age-group competitors at the marathon distance in the world. I was ready for some shorter distances, and at this point, I started running more half marathons. In February of 2013, Deb and I were watching coverage of the Tokyo Marathon on TV. The commentators casually mentioned that Tokyo had recently been added to Berlin, London, New York, Boston and Chicago to form what was now being called The Abbott World Marathon Majors. Deb started laughing uncontrollably. When I asked her why she was laughing, she just said, “I’m going to Tokyo.” I said, “That can’t be right. They can’t just add a race. There were 5. I ran 5.” Again she said, “We’re going to Tokyo.” I was still unconvinced, so I said, “Google it.” She did. The Tokyo Marathon had, in fact, been made one of the Majors. We were going to Tokyo. I had a lot of time to get ready for Tokyo since it wasn’t following on the heels of another marathon. I did my standard 3 months of training, averaging between 160 and 170 miles a week, focusing on running flat and fast. One week, just for the heck of it, I ran 200 miles. I dropped a couple more pounds. 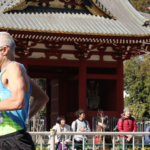 Tokyo is not like the other Abbott World Marathon Majors. In 2014, faster runners were not seeded in the front of the race, the way they are elsewhere. The elites were on the start line. Then they were followed by the Japanese Athletics Federation in the next corral. There are no time requirements to be in this corral, and in addition to faster Japanese runners, it is also the starting corral for many people dressed in costumes, and other, slower runners. I was behind them. This was bad. It was very frustrating to zigzag through runners dressed as Minnie Mouse, runners holding hands, and runners who stopped and stood still to take pictures. This went on for the first 5K of the race. I know I wasted some significant energy there. The other consequences of this chaotic start became apparent later, when we learned that the official race results are based on gun time, not chip time. Another difference between Tokyo and the other Abbott World Marathon Majors is the availability of race results. All of the other races post results online by the end of race day. For Tokyo, only our gun time was available. No age-group or other place information. We had the concierge at our hotel call the race office after a few days, to see if we could get official results; we were told that race results would be sent to us by mail. So, with not much choice in the matter, we waited. We waited over a month. Finally, our certificates arrived in the mail. My official finish time was 2:41:29. My net time (listed separately on the certificate) was 2:40:35. My place was 2nd in my age-group. I went online to see how far in front of me the 1st place finisher was, and how far behind me the 3rd place finisher was, but nothing was online. To this day, I don’t know who beat me, and by how much time, or where he started. I also don’t know whether his net time was slower or faster than mine. No matter; I had achieved my (revised) goal. 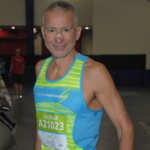 I had run all 6 of the Abbott World Marathon Majors. I had won my age-group in 3, and been on the podium for 5 of the 6. I was ready to cross the Abbott World Marathon Majors off my list. By 2015, my son Ian had started college at Columbia University in New York. Deb wanted to go visit and decided to remind me that I had unfinished business there. I had turned 55 in May. With 3 out of 6 age-group wins in Men’s 50-54, she reasoned, why not try to win the other 3 in Men’s 55-59? While part of me suspected that she was just looking for a family vacation in New York City, part of me liked the idea. I knew I could do better in New York. I was healthy. I was running well. I was at the bottom of a new age-group. My mom and sister said they would come to cheer me on, my kid was in New York, my wife wanted to go, and I wanted to kick off my new age-group with a big win. The race was a lot better than the one in 2011 had been. Hearing my family cheering for me along the course was amazing. Deb and Ian were waiting for me on 5th Avenue at the entrance to Central Park; they had the cops running security detail yell “ZALOKAR!” for me as I went by. 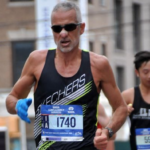 By this time, I was sponsored by Skechers Performance, so I was wearing a singlet that said “Skechers”, and strangers were yelling “Go Skechers Guy!” I ran a 2:43:10, and won my age-group. 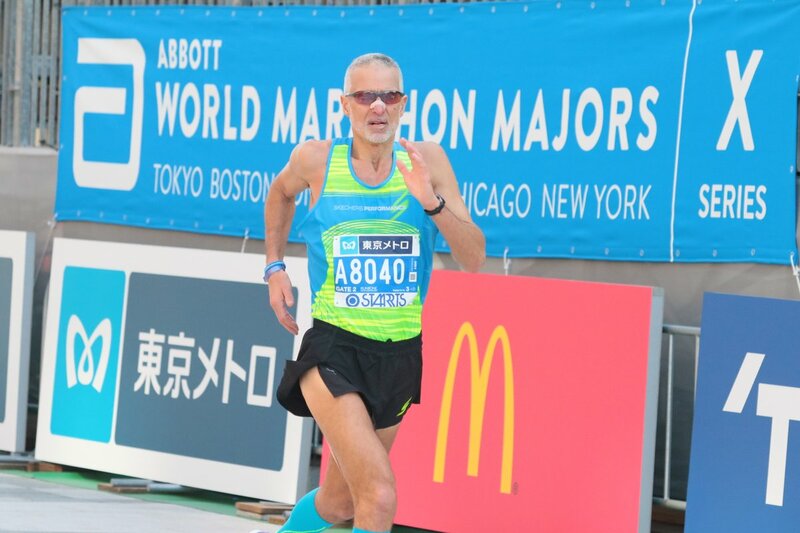 At dinner that night, I announced my new goal to my family: I was going to win my age-group in all 6 Abbott World Marathon Majors, 4 down, 2 to go. Somehow, nobody was surprised. When I got home, I started researching to see if anyone had won their age-group in all 6 races. It didn’t appear that anyone had. That made the goal even more enticing. Could I be the first person to do it? I had London and Tokyo to choose from. I’d had a much better race experience in London, and Deb hadn’t run London in 2012 when I did, so she was excited to go and get her 6-Star Finisher status at the Abbott World Marathon Majors. London, 2016: we had a plan. I was healthy and able to put in 3 months of good high mileage training before the race. I felt strong during the race, was familiar with the course and was focused on that age-group win. I got it, running a 2:39:50, 5 out of 6. Only Tokyo stood between me and my goal. I was a little apprehensive about running Tokyo again, because of the (in my opinion) poorly managed start, and also because I felt that the official results being based on gun time, rather than chip time, did not work in my favor. But, I was 5 for 6, and Tokyo was number 6. There was no getting around it. Fortunately, in the 3 years since I had run the race, Tokyo had slightly restructured their start line and corral set up. With a qualifying time, I was able to apply for an Overseas Semi-Elite position, which would put me in a corral directly behind the elite runners. I applied and got the position. I was cautiously optimistic. On race day, my position was exactly as I had been told it would be, which was really important because the race still used the gun time for their race results. The race wasn’t easy, but I stayed focused on my splits, and they were OK. I wanted to win my age-group. I wanted to be done. At this point, I didn’t want to run this race again. With about a mile and a half to go, I tucked in behind an elite woman and decided no one was going to pass me. She and I passed at least a dozen runners in that last stretch. I finished the race in 2:45:42 (chip time), only 6 seconds off my official race time of 2:45:48. I was so happy to have had that Semi-Elite starting position! Now, the only thing to do was wait to find out the age-group standings. And we waited. Just like 2014, there was no placement information online, just my time and splits. Just for the heck of it, I sent an e-mail to the race and had the concierge call, but in both cases, we were told that no age-group place information was available. I really don’t understand the delay, but there was nothing to do but wait. By the time we got home, there was still no information available. A day didn’t go by without multiple people asking Deb and me how I had done, and whether I had gotten that 6th win. We all waited. Eleven days later, official race results were posted online. I had won my age-group. YIPPEE-KI-YAY!! I won by less than a minute. Both 2nd and 3rd place in my age-group were Semi-Elite Japanese runners. Thank goodness I had the Overseas Semi-Elite entry. I e-mailed the race to ask about age-group awards. They e-mailed me back and said they didn’t give age-group awards, which is another way that Tokyo is different from the other 5 races. 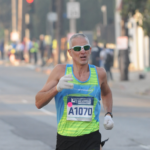 Running all 6 Abbott World Marathon Majors and earning 6-Star Finisher status is a huge accomplishment. Winning my age-group in all 6 took a lot of hard work, and was exciting and challenging. Being the first to accomplish this Abbott World Marathon Majors Age-Group Sweep makes it even better. 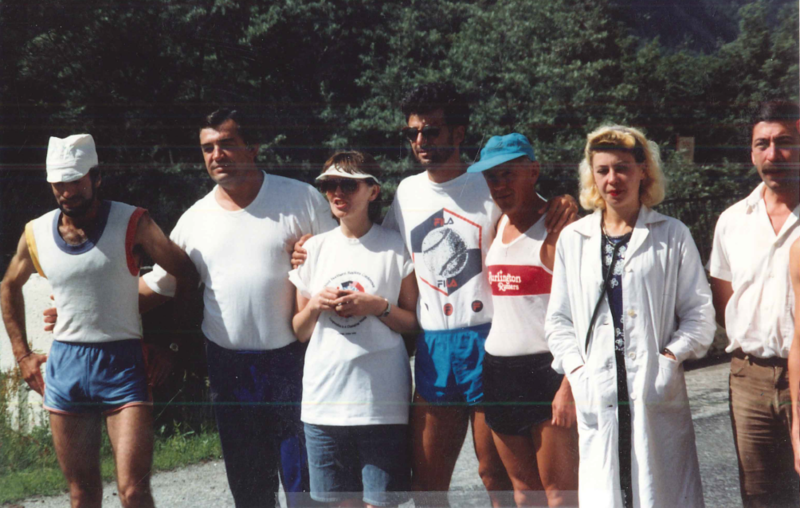 In March 1992, I heard about an event called, “Run to the Top of Europe”. The flyer said that the previous summer, a group of runners had made a multi-day running ascent of Mt. Elbrus in Russia. In the summer of 1992, a second such attempt would be made. The flyer went on to say that “With the new spirit of co-operation beyond the spirit of glasnost, getting to and around the USSR is now much more possible for determined athletes. Any American runners who think they can handle the challenge are invited to participate.” When I read that, I thought, “I’m always up for a challenge!” I had been wanting to climb Mt. Elbrus, because it’s the high point of Europe, and this seemed like a great way to accomplish that. The race was organized as a four-day stage race. The first stage was from Tynaus (1350m) to Elbrus (1650m). It was 42 kilometers (marathon distance), completely on pavement. 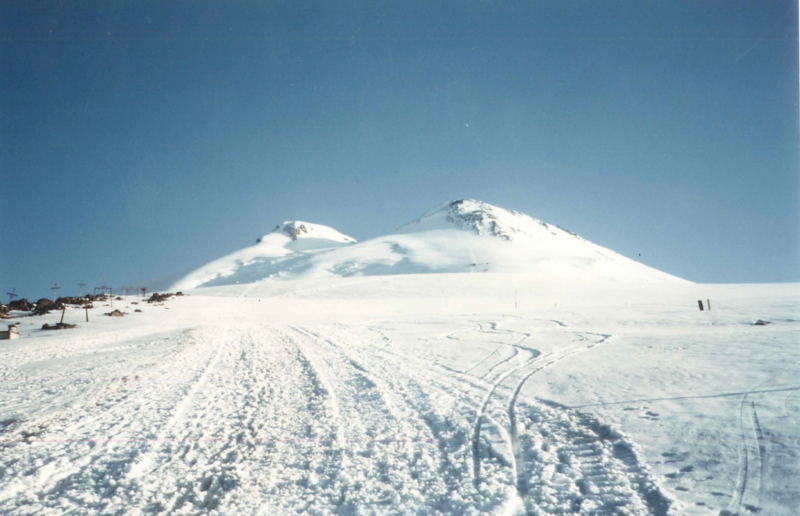 The second stage was from Elbrus to Azau (2350m). It was 23 kilometers, also on pavement. The third stage was from Azau to Priyut II (4100m). It was 15 kilometers on a dirt mountain road. 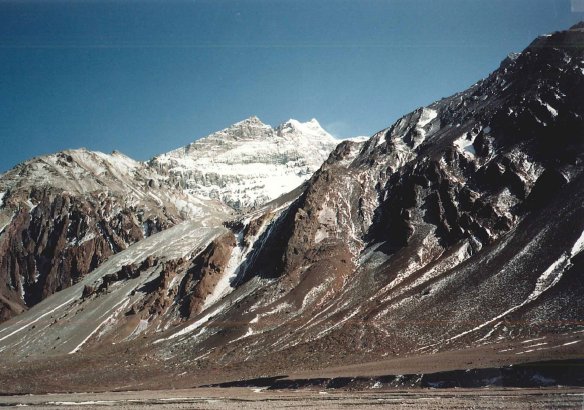 The final stage was from Priyut II to the top of Mt. Elbrus (5642m). That stage was on snow the entire way. I thought that this event was right up my alley, because I was a climber and a distance/mountain runner. I signed up for the event, and was accepted. The race was scheduled to begin on July 31st. On July 27th, 1992, I left Reno and flew to London. I arrived mid-day on the 28th and spent the day sightseeing. On the 29th, I flew to Moscow, arriving late in the day. When I arrived, the weather was grey. The Moscow airport was like nowhere I had ever been before. It was a little surreal, arriving there alone, not speaking any Russian, and unable to read any of the signage, as it was all in Cyrillic. After going through immigration and customs, it took a while for me to locate the two guys who were there to meet me. They spoke broken English and took me to a very small, very old car. It was all a little like something out of a movie, and I briefly thought I might never be seen again! These thoughts vanished quickly when we arrived at the offices of the Adventure Club/Sputnik, the organizers of the race. I met my interpreter, as well as the race director and other Sputnik members. A group of us had supper, and then I was taken to a very basic dormitory-style hotel where I spent the night. The next morning, I was taken back to the Sputnik office, where all of the race participants (about 25 of us) had breakfast together. There were 2 Americans, 6-8 Europeans, and the rest were Russian. We took a bus to a small, regional airport, Bykovo. The 35-kilometer ride was interesting. My impressions were that everything was square, and in disrepair. There were a lot of checkpoints along the road, but most were abandoned. Those that were manned, we stopped at, without incident. When we got to the airport, I was told not to speak, and to stay with the group. I followed directions, and we cleared security as a group and went to the gate. It was a one-of-a-kind flying experience. As a group, we walked into the bottom of the plane, carrying our luggage, and stowed it on giant luggage racks. Then we climbed steep metal stairs to the upper level of the plane, where the seats were. We were told to just take any open seat. The cabin was worn, and in disrepair. Take-off was also interesting. The whole cabin shook, overhead compartments opened, luggage fell out, and unoccupied seats folded forward. The drink and snack service was on mismatched plastic plates and cups of different colors and sizes, with 2 or 3 drink choices. Again, it was surreal, like a scene from a movie, and completely different from anything I had ever experienced. We made it, though, and arrived at our destination, Mineralnye Vody, around noon. We waited for over 1 hour for our bus. On the way to the lodge, we stopped for supper. We arrived in Terskol around 7. On the morning of the first stage, we had breakfast and then took a bus to the start line. The 42K course was on a paved road, and fairly flat, with a net gain of 300m. The race started at noon. It was raining at the start line, and it continued to rain the whole way. I won the stage, maybe because most of the participants were climbers, rather than runners. A few of us finished well ahead of the rest, and we cheered for the rest of the group as they finished. When the last runner finished, we took the bus back to the lodge in Terskol. We took saunas and had Russian massages. Another surreal experience: hanging out with sweaty, naked men and being whipped with tree branches. At supper, the race director announced the results of the day’s race. The next day, the rain was gone, and the weather was good, but I felt a little sick, and was having some digestive issues. The race started at noon. The course was a 23K with a 700m net gain, on pavement. It started at the previous day’s finish, and ended at a ski resort. I was second. After lunch we stopped at a mineral water plant and went back to the lodge, where I had another massage. This time it was with the race’s doctor, and it was a much better experience. At supper, when the race results were announced, I learned that my second place finish was close enough to the winner to keep me in position as the overall race leader. The day of the third stage, I still wasn’t feeling 100%. After breakfast, we packed our bags, because we were moving up the mountain to Priyut II, our next lodging, at 4100m. I called it “Camp Tin Cans” because the cabins looked like red and white cans lying on their sides. We went to the start with our bags and a tram took them to Priyut II for us while we went back to the lodge for lunch. The race started at 3 PM. 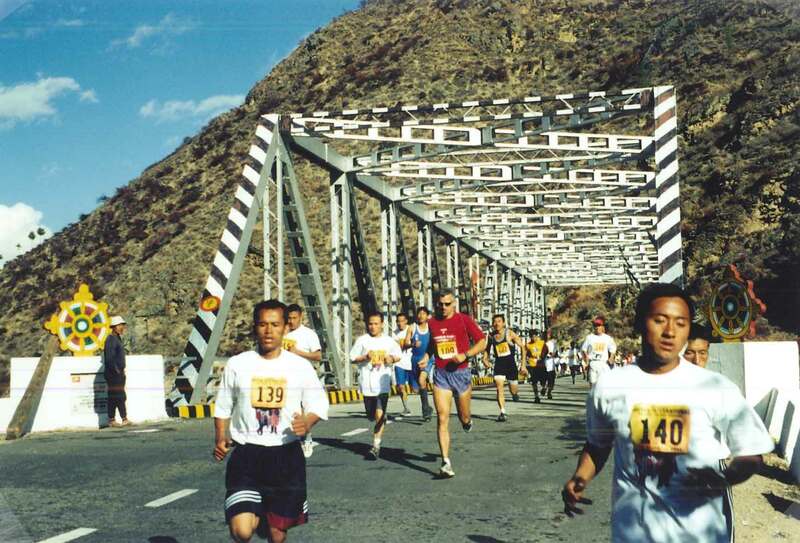 The course was a 15K with a 1750m climb on a dirt road, starting at the previous day’s finish, and ending at Priyut II. The camp at Priyut II was another thing about this trip that was unique. I’ve never (before or since) stayed in a camp with round tube-shaped cabins made of metal. It was another out of a movie moment. A unique thing about the camp was the outside toilets. They were a plywood box, almost hanging off the side of a cliff. They weren’t attended too very well, and they were pretty dirty and disgusting. When the race started, my stomach was really hurting, and I fell back to last place. Midway through the race, I started to feel better, and stronger. I made a big push, and picked up the pace. I made up a lot of time, and was able to finish fourth. After 3 consecutive days of racing, I was second overall, and a few minutes behind the leader. With the next day scheduled as a rest day, I felt confident that I could make up the time on the last stage. I was excited about climbing to the summit of Elbrus in 2 days. Looking up at the mountain from Priyut II, we could see the two summits: the closer, east summit and the higher, west summit. I asked the race director what route we were taking to the summit. This was the exact moment when I learned that the race finished on the top of the east summit, not on the “Top of Europe” which is the west summit. I was shocked, and in total disbelief. I said “The event is called “Run to the Top of Europe, which is the WEST summit.” He replied “What’s a few meters?” and shrugged. I was still stunned. This whole time (since March) I thought I was going to the Top of Europe, the west summit of Mt. Elbrus. I said, “Well, I’ll climb the west summit instead.” He said “No, Too far. Not possible.” I said “OK and walked away, but I had already decided what I was doing the next day, and it wasn’t resting. The next morning, I got up early and at 7:15, while everyone else was still asleep, I left the camp. I headed toward the saddle between the east and west summits. Within the first hour, I came across an old wooden hut, Priyut I. It looked like Noah’s Ark, stuck up on the mountain. It was a straightforward climb to the west summit. It took a little less than 6 hours, with an elevation gain of 1542m. I was the only person on the mountain above 4500m. It was awesome. On the summit, I saw the rock where a bust of Lenin had once been, but the bust itself was gone. While I was on the summit, clouds started to roll in. I spent 15-20 minutes on top, and then started my descent. When I got to the saddle, I could see Priyut II and the red and white tin cans. Then I found myself in the clouds, with visibility limited to 10 yards. Walking in the clouds, I started to fall into a slow, sinking crevasse. I spread my legs wide, and my crampons caught both sides. It was 3-4 feet wide, and there was a black chasm between my legs. I couldn’t see the bottom of it. I used my ice axe to swing over to one side and climb out. I just sat there waiting for the clouds to clear. It took a while, and when they finally did, I realized that I couldn’t see the tins cans anywhere. I thought I had moved too far to the left, so I walked about 100m to the right, and I could see Priyut II again. I headed straight for it, and was back in camp at 5 PM. I wasn’t sure what kind of reception to expect. To my surprise, I discovered that everyone at camp had been watching my climb through a telescope until the clouds closed in. Everyone congratulated me, and there were no issues. Phew! I was very tired after 4 straight days of all-out exertion, but I was also really happy, that kind of happy that comes from pushing your body hard and knowing that you’ve answered the challenge. I decided to drop out of the next day’s final stage of the race. I was toast. I was completely exhausted, and I truly felt that I had gotten what I had come for; I had stood on the Top of Europe. Finishing the race didn’t seem as important anymore. The race director was shocked that I wasn’t going to finish the race, since I was potentially a contender to win the whole thing. His lack of comprehension regarding my decision not to finish the race was equal to my lack of comprehension on the previous day, when I had been told that we weren’t actually racing to the Top of Europe. He tried really hard to talk me into it, but my mind was made up. The next day, the race started at 4 AM, so when I got up, it was already in progress. After breakfast, I hung out at camp and watched the race. 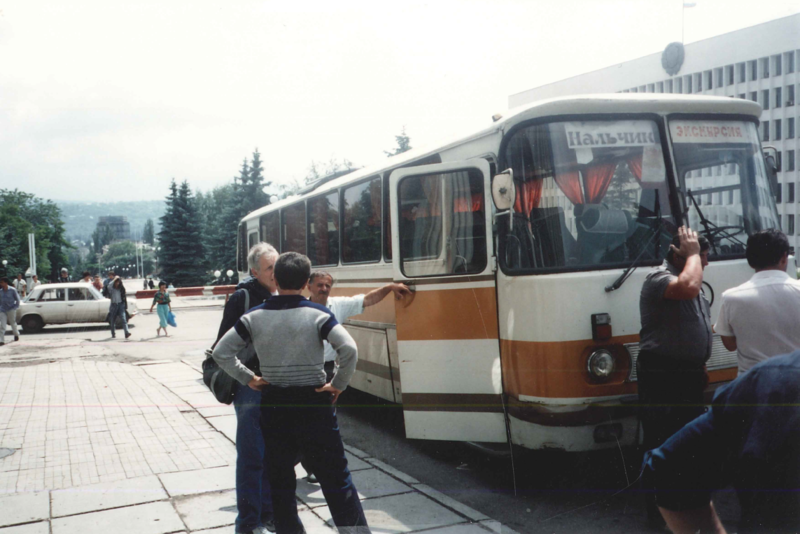 When the last person finished, at about 2 PM, everyone hurried to make the last tram down, at 3, to catch the bus back to the lodge at Terskol. The tram was packed full, so I decided to run down the stage 3 course. I flew down, and arrived at the same time as the tram. We waited for more than an hour for our bus. When we finally arrived at the lodge, we had a big celebration and awards dinner, which meant drinking a lot of alcohol. We started with cases of wine, and when they were gone, they brought out the cases of vodka. No mixers, just vodka. 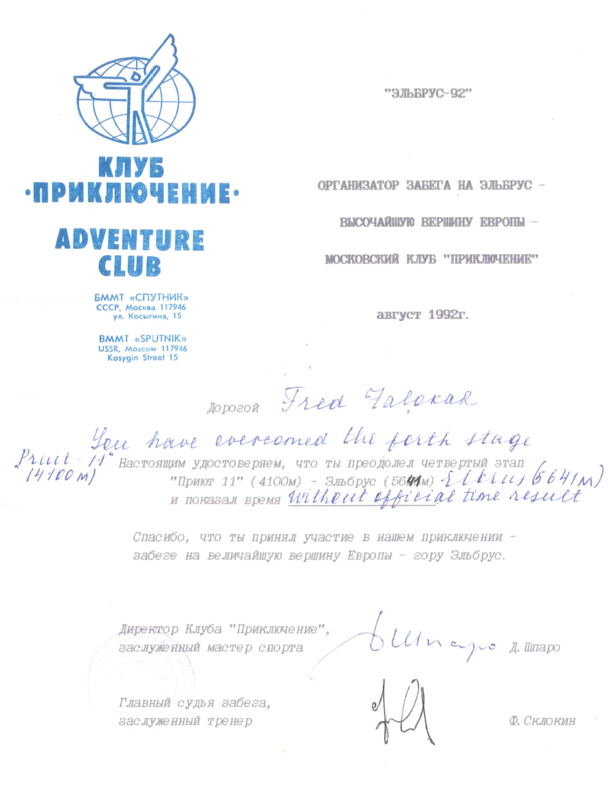 They gave me a special certificate and said, “Fred, who has had freedom his whole life, and we here in Russia, for only a few months.” While they were giving me my award, celebrating my ability to exercise free will, they also mentioned that I was the only participant not to finish, to which I relied that I was the only participant who truly went to the Top of Europe. It was all in good fun, and one hell of a party. It was another once in a lifetime event. The next day we woke up late, nursed our hangovers at breakfast and packed up our gear. We were going sightseeing in Prielbrusye National Park. We spent a few hours in a river gorge, soaking in the river and doing some bouldering. Then we headed to Nalchik. We checked into a hotel downtown where we would be staying for 2 nights. We had supper which was really good, especially in contrast to what we had been eating at the lodge in Terskol and at the camp at Priyut II. The food there had been basic. There were always 2 saucers on the table: one with salt to flavor the food and one with sugar for the tea. I tried not to mix them up. I’ve always said that to be a good climber, you have to have a cast-iron stomach. I ate everything, but there were definitely some challenging meals. There were more once-in-a-lifetime moments. There was a neon orange broth with fish heads floating it in. There was also the night we were served some sort of mystery meat, served with peas, and covered in a thick white paste. The next day was spent sightseeing in Nalchik. I remember seeing a lot of statues, and one statue of Lenin that had been knocked down and was lying on the ground. My favorite thing was taking the teleferic up the hill and going to the restaurant on the top, with great food and great views. The people we met were all very friendly and nice. The following day we did a little more sightseeing, going to a local market. After lunch, we packed up and headed to the airport to fly to Moscow. We arrived late in the day, had supper, and then went to the Moscow Circus. I spent 2 days in Moscow, sightseeing. Thankfully I still had my interpreter with me! 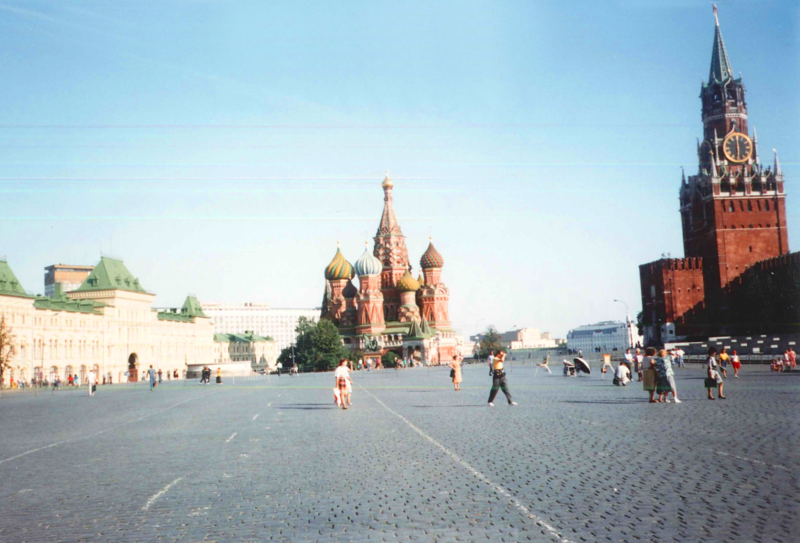 We rode the metro, and went to Red Square and to the Kremlin Museums. We tried to see Lenin lying in state, but weren’t able to. Finishing my trip in Moscow after all the time in the mountains was a great way to get a feel for a different aspect of the country. My favorite part of the trip was, of course, summiting Mt. Elbrus, and standing on the Top of Europe. Maybe it was even better because I had to do it on my own. The whole trip was so unique, and so memorable. 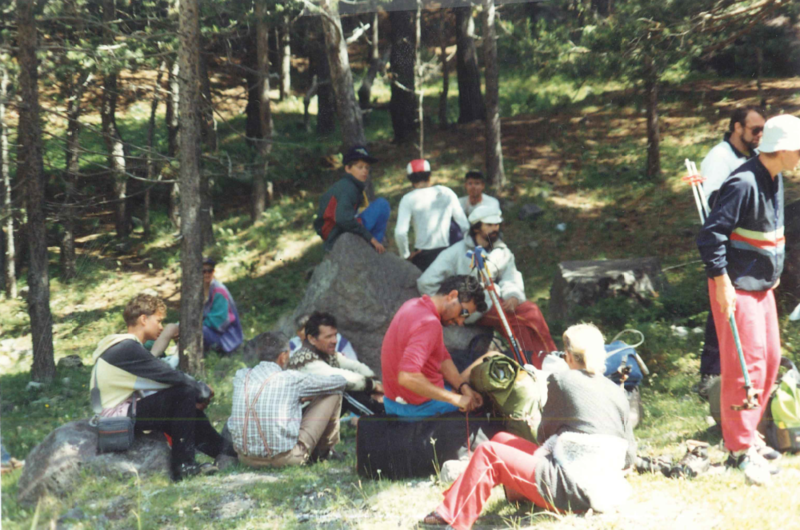 I consider myself lucky that I was able to be part of a predominately Russian expedition, and that I spent the bulk of my trip in the mountains, running and climbing. The camaraderie between the participants and the fitness challenges we all faced together, were all things that most Americans traveling to Russia would never get to experience. I felt that I was offered a unique look into Russian culture, particularly in 1992. The food, the accommodations and the race itself weren’t designed for tourists, but everyone I encountered was warm and welcoming, and the trip couldn’t have been better. I had climbed six of the Seven Summits—the high points of the seven continents—and had summited five of them. At this point, it became clear to me that climbing Mt Vinson, the high point of Antarctica, was not going to be economically viable, particularly with respect to the relative ease of the climb. When I heard about the Antarctica Marathon, I thought, “Hey, I could do that”. At the time, the race was a significantly more affordable travel option than other ways of getting to Antarctica. 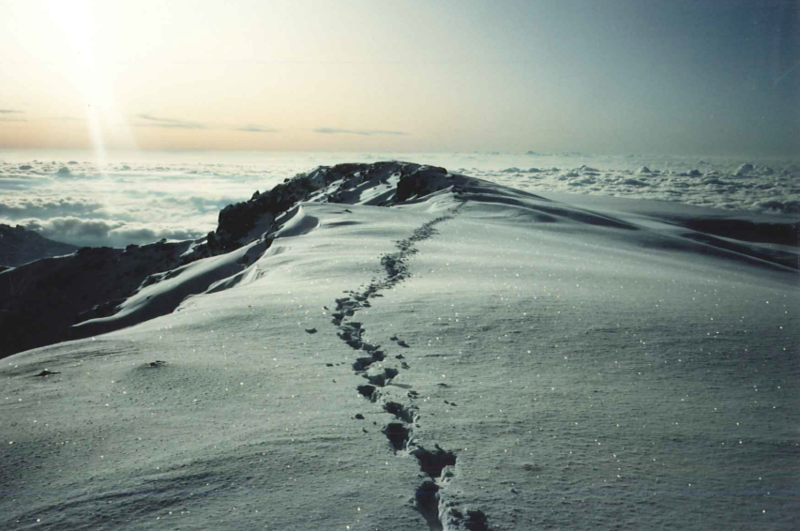 I was eager to travel to Antarctica, because it was the only continent that I had not yet visited. Running a marathon seemed like a good way to go to Antarctica with a purpose, rather than just visiting as a tourist. In 1998, there was no waiting list and I signed up for the 1999 race with a group called Marathon Tours. We all met in Buenos Aires on February 7, 1999. A big group of us went for a shakeout run. Towards end of the run it started pouring rain and the streets filled up with nearly a foot of water. It was amazing how fast the water rose. The next day we flew to Ushuaia, the world’s southernmost city. Ushuaia is known as “The End of the World”. It definitely felt that way. We went to the end of the Pan-American Highway in the southern part of Patagonia. It certainly was desolate. We spent one night in Ushuaia. 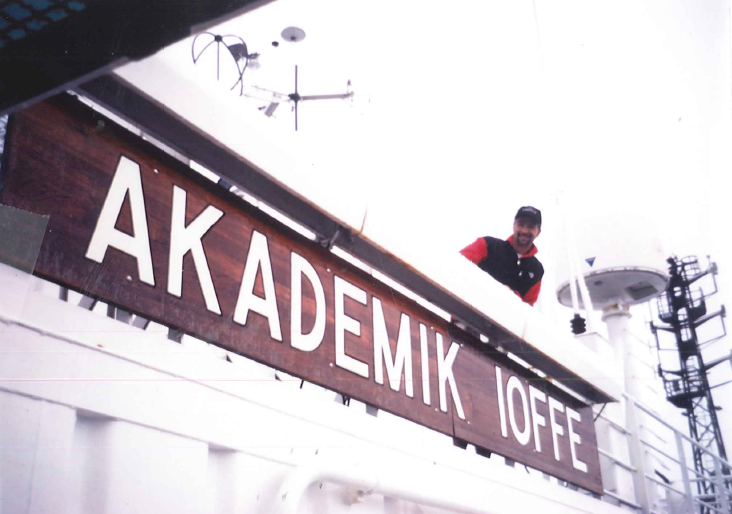 The next day we boarded the “Akademik Ioffe” with its Russian crew. It is a two-day journey from Ushuaia to King George Island, where the race was going to be held. 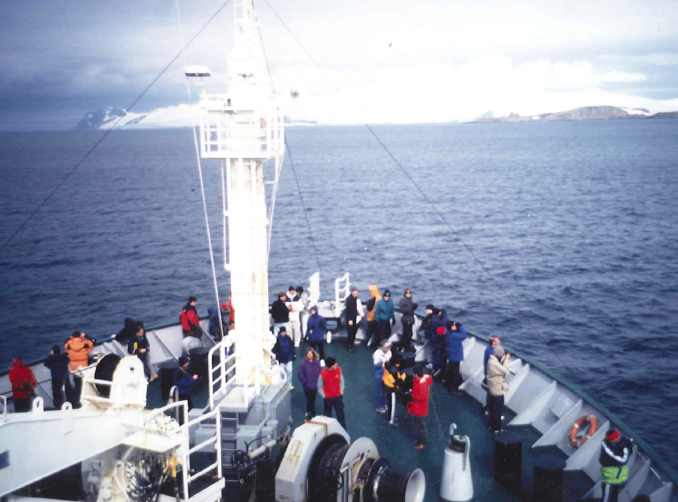 The journey was uneventful, except for the crossing of the Drake Passage. Almost everyone got sick and there was a lot of vomiting. I remember a female Russian crewmember walking down the swaying hallway with a bucket and mop to clean up the messes. The ship smelled pretty awful, too. It took 18 to 24 hours for most people to stabilize and feel better. Even I felt nauseous for about 12 hours. I took some Tylenol and spent a lot of time lying down. After we all survived that, everyone came back to life and started to hang out together. It was a fun, good group of people. There were about 100 people on our ship, nearly all of them running either the half or full marathon. There were a few non-running spouses who were there for the vacation aspect of the trip only. Everyone got along. There was also another, smaller ship carrying more runners. Even though I had always run, I was mainly a climber and an ultra runner. Because of that, I thought that I would be able to fly under the radar, but there were a couple of guys from Arizona on the ship. They asked me, “Didn’t you win last year’s Crown King 50K?” I said, “Yes, that was me”. After that, I started getting more attention than I had wanted, or expected, and suddenly I was one of the favorites to win the race. The ship was our hotel and restaurant for the entire trip. 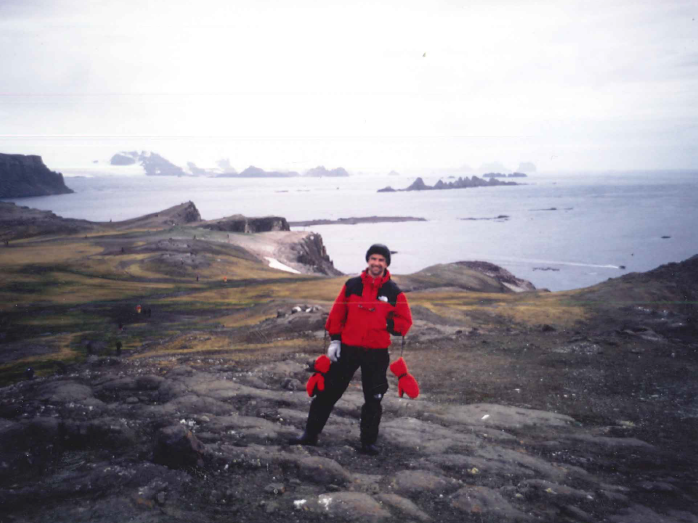 We arrived at King George Island, and dropped off a group of people whose job it was to set the course for the race. The rest of us went off sightseeing. 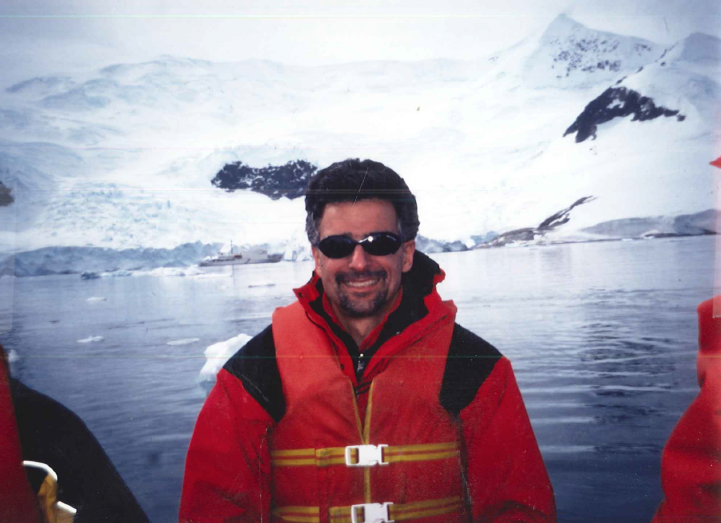 We sailed through the Antarctic Sound to Paulette Island. The icebergs were massive, plentiful, and thoroughly amazing. The water was bluer than blue. Landing on Paulette Island was like stepping back in time. There were whale skeletons with enormous bones piled & scattered on the beaches, quite a few seals of all sizes lying around, and thousands and thousands of penguins. The penguins weren’t afraid of us, and we walked through crowds of them (and their pink penguin poop!) When we left, there were minke whales swimming very close to our Zodiacs, at times even bumping the bottoms of the boats. It was pretty cool! 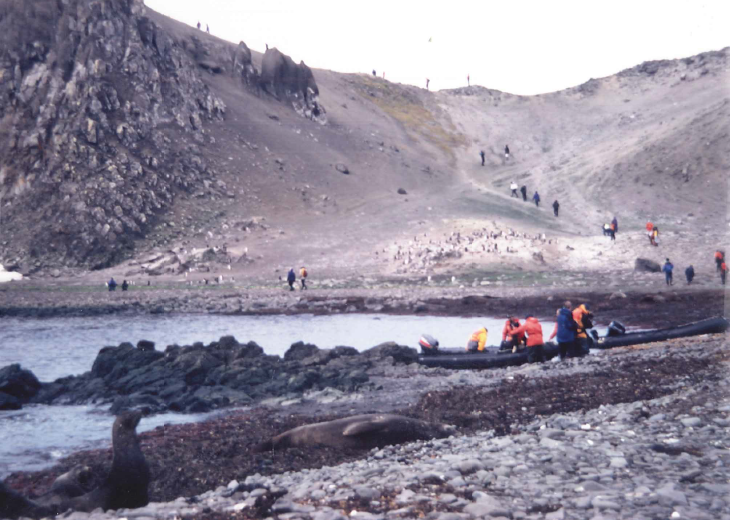 The wildest of the wildlife were the leopard seals and the skuas. A skua is like a seagull on steroids. More than once, I watched a group of 5 or 6 skuas surround a small penguin and rip it apart for food. 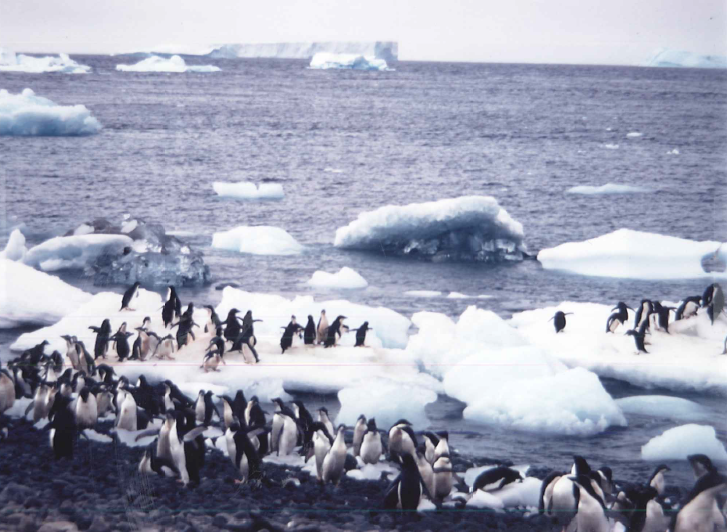 One unfortunate penguin was alone on a small piece of ice with a leopard seal circling it. None of these scenarios ended well for the penguins. It was a chance to watch the circle of life at its most raw. 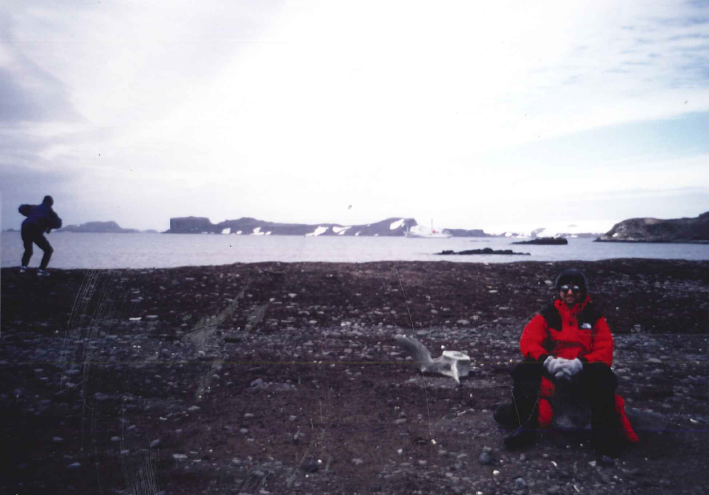 Eventually, we headed back to King George Island. 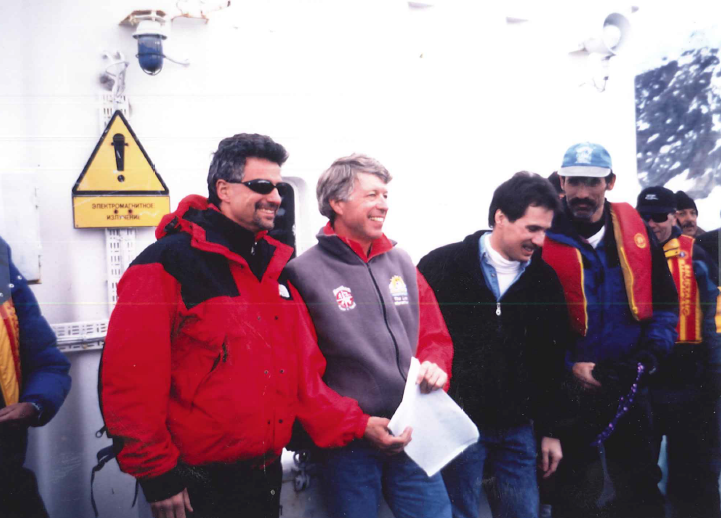 The group that set up the course also returned to the ship. At dinner that night, we had a course briefing. The marathon course started and ended at the Uruguayan base, running two loops of a half marathon course. We would start running in one direction, go up a snow hill and turn around, then head back to, and through the Uruguayan base, running another out and back with 10+ miles to go for the first half. That part of the course passed the Russian and Chinese bases along the way. Bart Yasso helped set the course and was really most people’s favorite to win. At dinner that night, Bart was talking like he wasn’t sure if he was running the half of the full, even though the race was the next morning. My strategy was to run with the leader for the first half, and then to pick up the pace and finish with a win. The next morning was race day. It took some time to get everyone onto the island. The weather wasn’t too bad, and since I train in Reno winters, I felt right at home! The temperature was above freezing, in the high 30s. The race started. From the outset, it was clear that Bart was going to lead. My thought was to push him by staying with him. We ran together. At the half, we were still running together. Bart stopped at the half and won the half marathon. I was by myself, but I knew the course. I had run the first half harder than I had planned to, so I was hurting a little. Bart’s friend Steve caught me at around mile 21 and passed me. By this time, Bart and the others were on 4-wheelers monitoring the race. At that point, Bart did me a big favor. When Steve passed me I heard Bart say, “There’s our winner”. I had an Incredible Hulk moment. I didn’t turn green, but adrenaline rushed through me and I told myself that I was not going to lose this race. I knew the remaining miles. There was a gradual climb for about 3 miles, then it leveled off, then there was a steep downhill, with a flat 50 to 100 yards to the finish. My plan was to stay in striking distance behind Steve on the uphill and start an all out attack on the downhill. I was working hard, getting warm, and carrying my gloves and hat. I saw the right turn and knew that after that, it was straight and flat to the finsh. When we got to the right turn, I was still behind Steve, but I was close. I made the right turn and threw the clothes that were in my hands in the air, and sprinted as hard as I could. I ended up barely winning. I love it when a plan comes together. After I caught my breath, Steve and I congratulated each other on a good race, and everyone hung out and cheered the other runners on to the finish line. On board the ship that night, I was invited to sit at the Captain’s table for the remainder of the trip. At dinner that night, I formally met the captain for the first time. I said, “Hi, I’m Fred from Reno”. He looked at me and shook my hand. The Captain says, with a heavy Russian accent, “I shot a man in Reno just to watch him die”. At the time, I wasn’t familiar with Jonny Cash, and I thought “That’s weird. Is he threatening me?” Now I know the song lyric, and I totally get it! 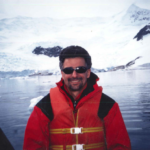 During the next couple of days, we toured around Antarctica. We went to Deception Cove. 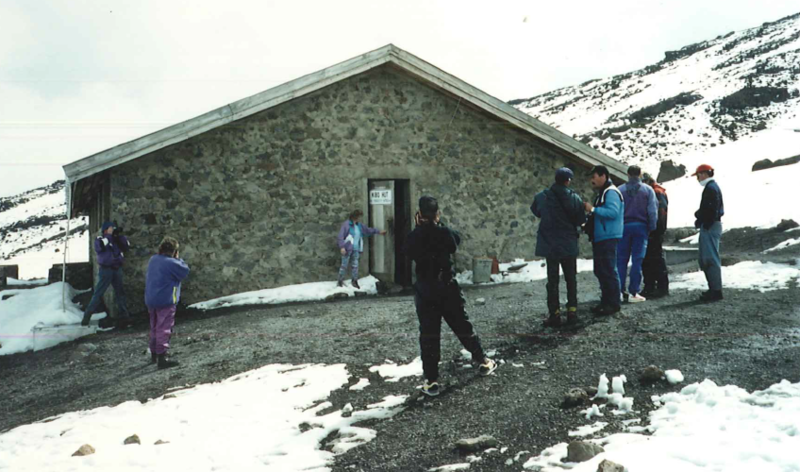 It’s a defunct whaling station and there is warm water, heated geothermally by steam vents from an underwater volcano, where some of our group went swimmimg. 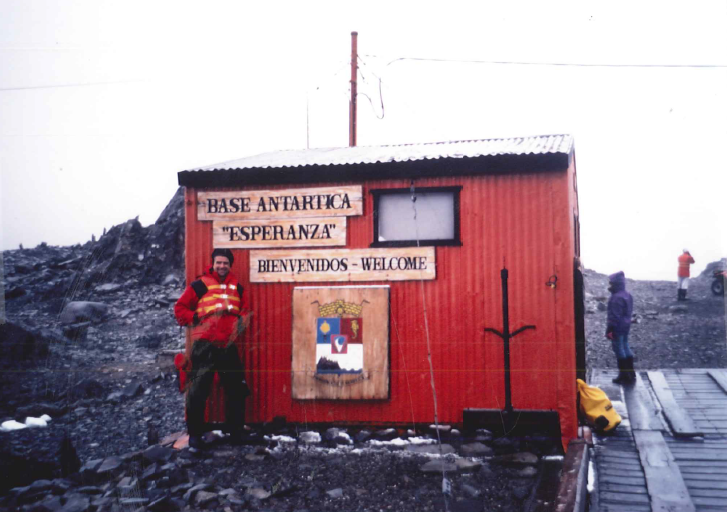 It was also interesting when we landed on the actual continent of Antarctica at the Esperanza Argentinan Base. The two day journey back to Ushuaia was much easier than the first crossing. The captain called it, “Drake Lake”. 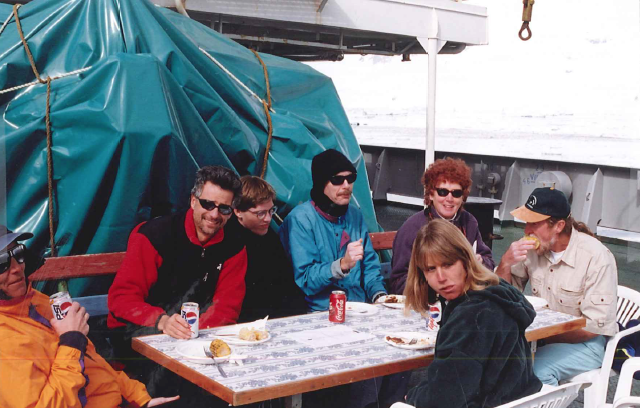 The Drake Passage is only as calm as it was for our second crossing once or twice each year. We were lucky. It was a great trip. Marathon Tours did an outstanding job. I highly recommend them for any running tours that they do. I’d also like to send a shout out to Bart Yasso. 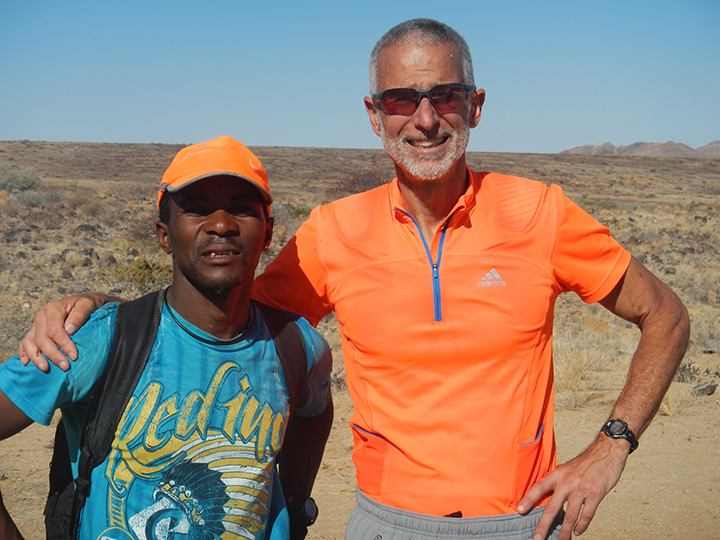 Over the years, he has been very helpful to me personally, and also to the running community as a whole! I wish him happiness in his retirement. To say that the Antarctica Marathon is a unique running experience is an understatement! It’s not a place to run a PR, but it is a race that will challenge you in different ways, from the temperature, to the terrain, to the Drake Passage crossing. It is an excellent way to travel to Antarctica with a purpose, if visiting all seven continents is something you aspire to. It is certainly a race (and a trip) you will never forget! In 2014, I came across an article on RunnersWorld.com dated January 22nd. The headline was “North Korea Marathon Open to Everyday Runners for First Time.” I was intrigued. 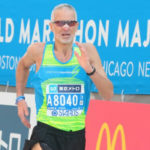 I had already run at least one marathon on each of the seven continents, and I was set to run my 6th of the Abbot World Marathon Majors (Tokyo) the following month. I had already been thinking about what my next running challenge or goal was going to be. Plus, I’m a collector of countries, always looking for somewhere new to go. 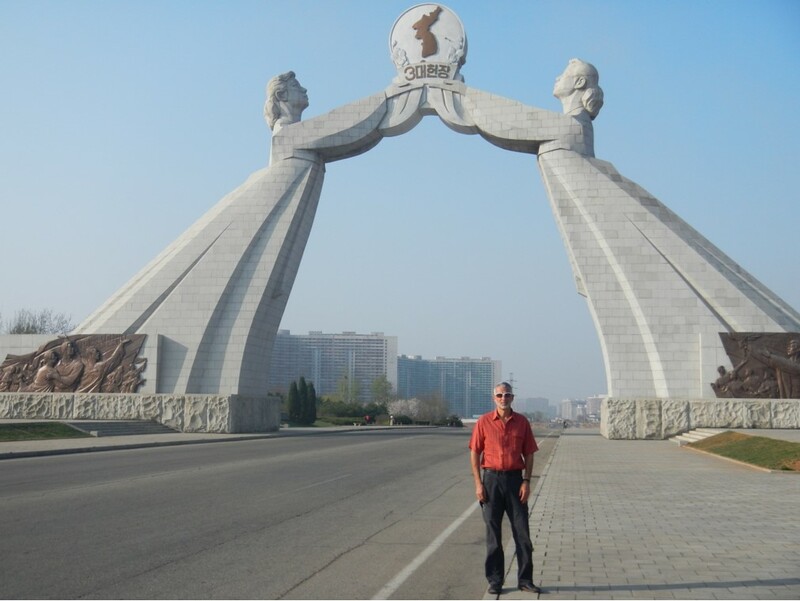 I had been trying to figure out how to visit North Korea safely and legally for some time. That night, I casually mentioned to my wife, Deb, that I wanted to go run a marathon in North Korea in three months’ time. She was not enthusiastic. I was not deterred. I got online and started researching Koryo Tours, a Beijing-based company mentioned in the Runner’s World article. 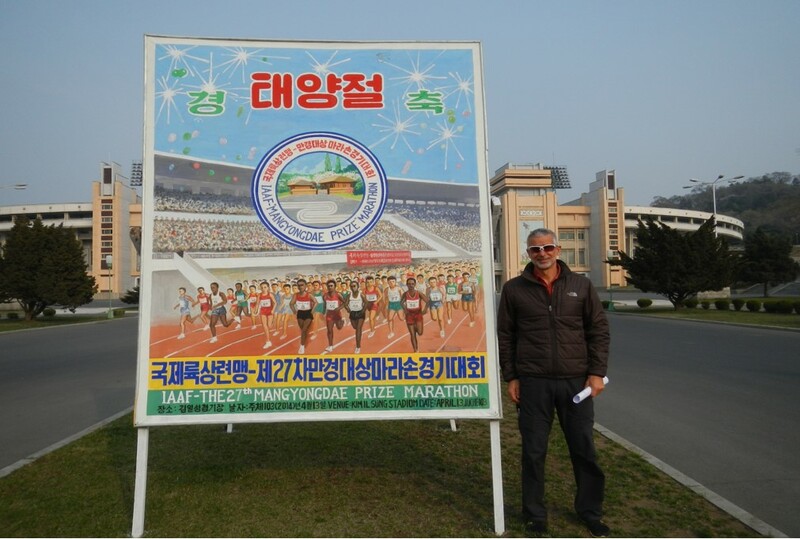 They looked safe and experienced, and they had a package listed that was specifically designed for runners and spectators of the 27th Mangyondae Prize Marathon—commonly known as the Pyongyang Marathon. I printed out the itinerary and presented it to Deb. At this point, she was a little more open to the idea. I told her that the tour company was based in Beijing, and that we could spend a few days on either side of the trip there. Deb loves Beijing. We were in. Deb and I both ran the Tokyo Marathon in February 2014. 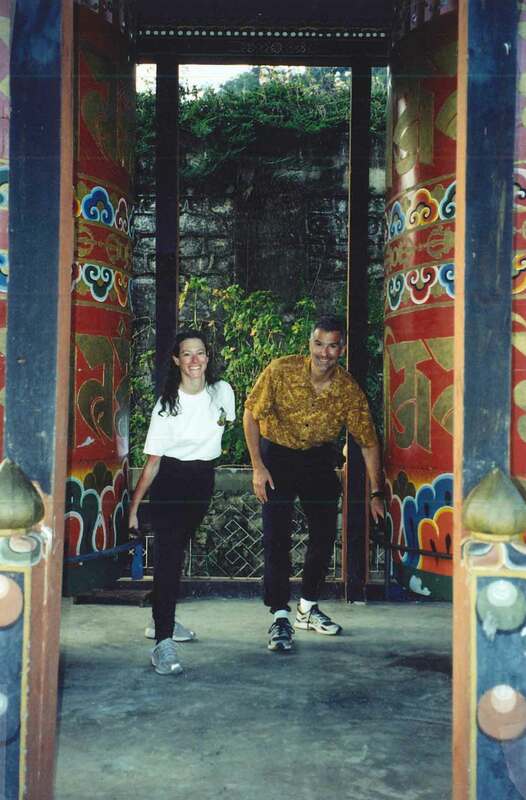 Deb thought it was insane to run two marathons two months apart, so she opted for the option of the Half Marathon in Pyongyang. If I was going to race in North Korea, I was going to go big or go home; nothing but 42K for me. 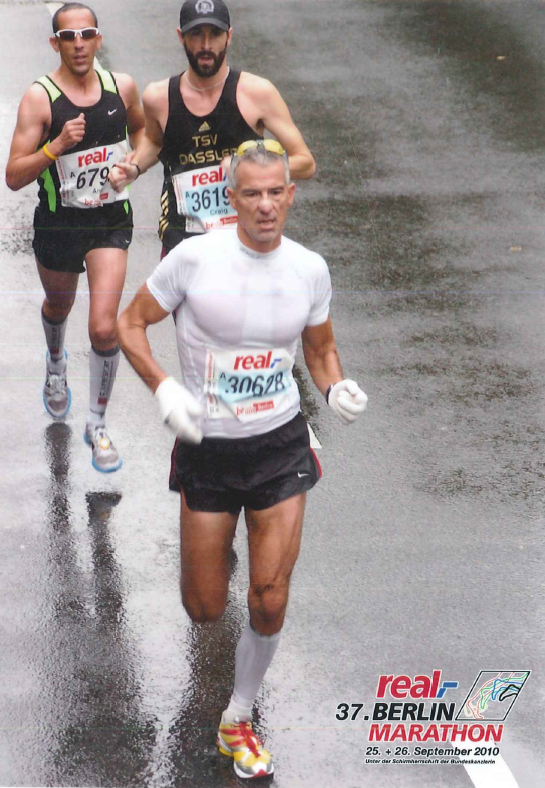 In Tokyo I ran a 2:40, finishing second in my age group (M50-54 at the time). My training leading up to Tokyo had me running an average of 142 miles per week, running long runs on Sundays averaging between 20 and 26 miles. After Tokyo, I kept up my training, running an average of 115 miles per week, and my long Sunday runs were a little shorter, averaging between 16 and 20 miles. We decided to run the San Francisco Rock ‘N’ Roll Half Marathon the Sunday before the Pyongyang Marathon (April 6th), where I won my age group with a 1:20 and Deb placed 3rd in her age group (W45-49). We traveled to Beijing, where we did some sightseeing and ate some Peking duck. We met with our tour leaders at Koryo Tours on an orientation with the other tour participants. We were briefed on politics and protocol for the visit to North Korea, but there wasn’t a lot of information about the race itself. We flew to Pyongyang the next day on Air Koryo. Fun fact: Air Koryo is rated as the worst airline in the world; it’s the only airline with a one-star rating from SkyTrax. Nevertheless, our arrival was smooth & uneventful. We were taken to the Yanggakob International Hotel, a 47-story Communist-style building on an island in the Taedong River. Hotel guests are not permitted to leave the island, which is not large by any stretch of the imagination. It consists of the hotel and its parking lot, and that’s it. If we wanted to run, our only option was to run in circles around the parking lot. Once again, the parking lot was not large. No treadmills inside the building. No shakeout runs after our flight, no runs to loosen up before the race, no runs to recover from the race. No runs allowed, except the marathon. The hotel rooms were functional, but not comfortable. We were told that the elevators were probably bugged, and that some rooms might be as well. We were told that there were cameras everywhere. 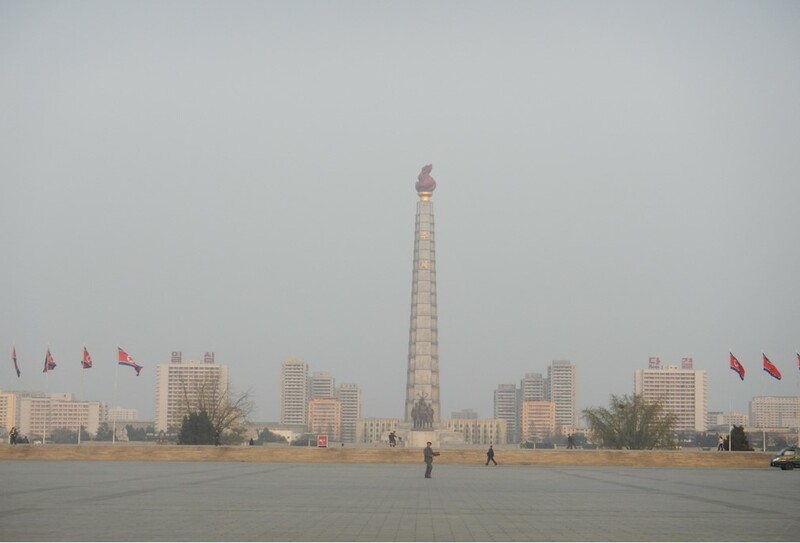 The first days of our trip were spent doing some obligatory North Korean sightseeing on the Tourist Circuit. We took the Metro tour and went to various statues, parks, and monuments, where we were instructed in how to stand in (very) straight lines and bow to the Dear Leaders in the appropriate manner while flowers were placed at the base of huge statues. For posterity, we were videotaped constantly—and we were told that at the end of trip, we would be able to purchase a souvenir DVD. The day before the race, we took a detour from the prescribed tourist agenda, and did a little pre-race prep. We were given a Xeroxed copy of a hand-drawn course map. The bus driver was going to take us on a drive-through of the course, since we weren’t allowed to run it. The map didn’t make a lot of sense to the bus driver, and our government-issued tour guides were not really informed about the logistics of the race. We did the best we could, but no one could really help us with the math of the race. 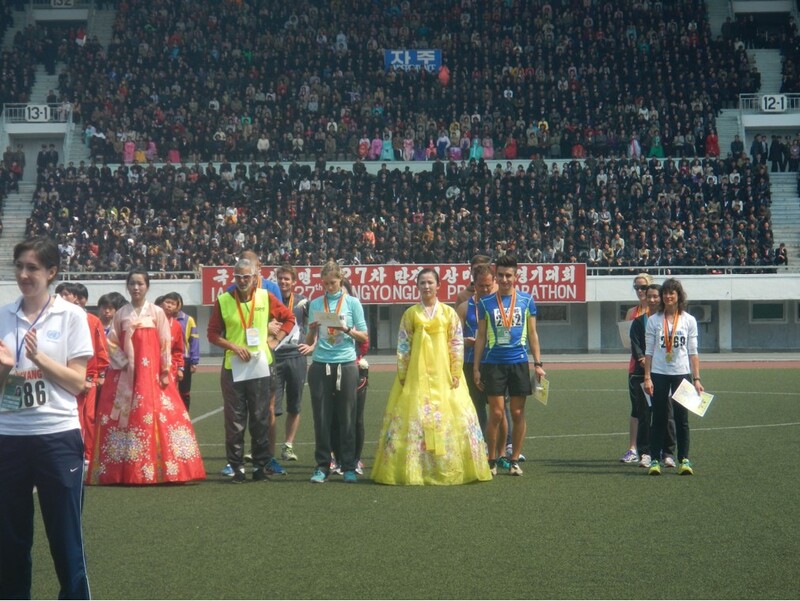 The course was essentially a 10K, starting in the Kim Il-Sung Stadium, and finishing on the street just outside. We were told that the half-marathoners would run two laps of the 10K course and that the marathoners would run four. The problem, of course, is that two ten-kilometer laps don’t make a complete half, and four of them don’t make a complete marathon. No one could tell us where the extra distance was coming from. We drove some of the course in the bus, but there were still some surprises on race day! We were taken to the stadium, where we posed for pictures with the sign outside advertising the race. That day, the air quality took a turn for the worse. Visibility was terrible, and we could only see a block or two into the distance. 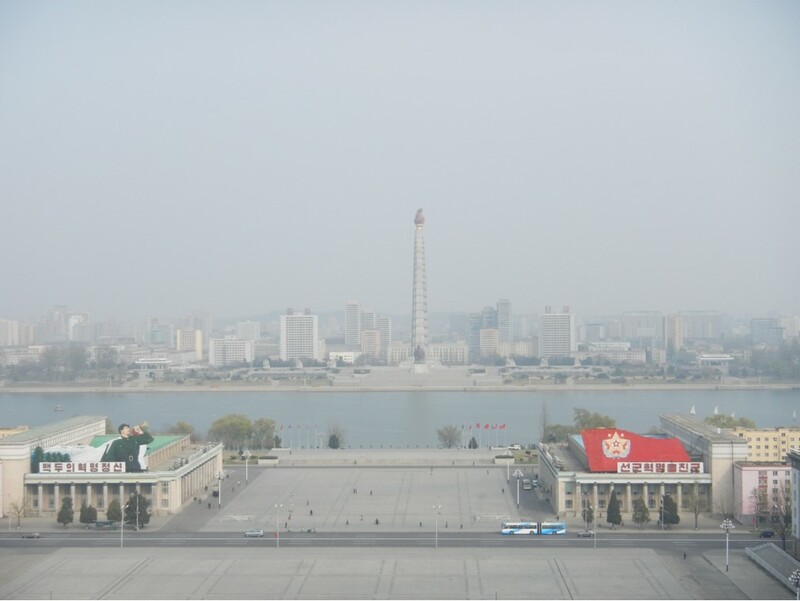 I’ve been to a lot of cities in Asia where people wore masks even though the air quality seemed okay to me, but in Pyongyang, I found the exact opposite. The air quality was horrible (due to a coal mine close by?) and no one was wearing a mask. When we asked about this, we were told that the government’s stance is that if people are not wearing masks, there obviously isn’t a problem with the air quality. I am generally not a finicky eater, but I think most runners tend to lean toward a certain type of meal the night before a race, particularly before a marathon. At our hotel, we were fed banquet style. Our pre-race meal was fried fish and the ubiquitous kimchi (offered daily at breakfast, lunch, and dinner), with a few other side dishes. It was far from an ideal pre-marathon meal. Deb and I ended up eating a few Clif Bars in the room before we went to bed. We had Clif Bars for breakfast race morning as well, and after I grabbed some coffee from the restaurant, our bus took us to the stadium. April 13, 2014: race day! The morning was chilly, and we arrived at the stadium in our warmups, wearing our race credentials around our necks and feeling like running rock stars. We had been told repeatedly that, as “amateurs”, we were not allowed to represent our countries with flags, country names, or any other logos on our clothing before, during, or immediately after the race. We were also told that the size of any branded logos (like a Nike swoosh) would be strictly regulated. After the race, we heard about one guy who was told that the logo on his shorts was too big, so he ran in his jeans. I don’t know what distance he was running, but for his sake, I hope it was only 10K! There was a grand procession into the stadium to begin the opening ceremonies. We lined up in the parking lot in three groups of international amateur runners, totaling about 225 people. We were not allowed to carry anything: no cameras, no water bottles, no bags. Before we entered the stadium, the professional runners marched in, one country at a time. 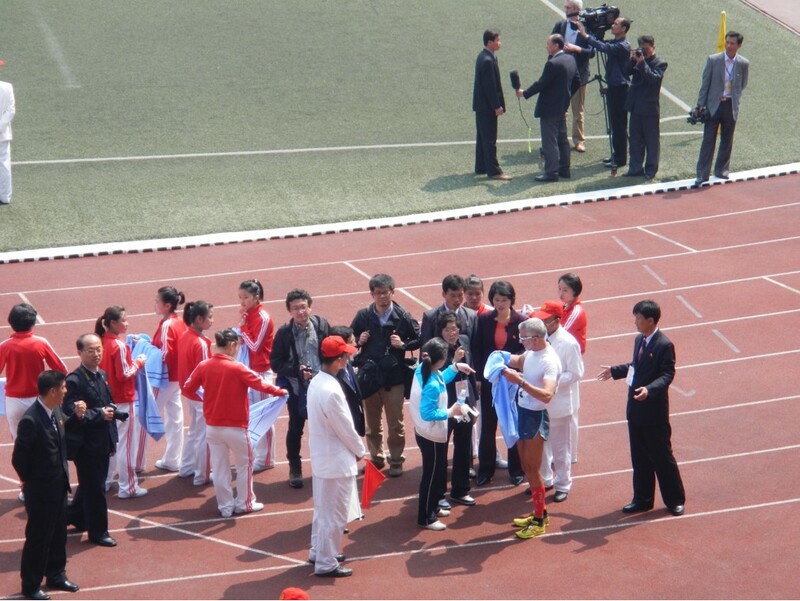 There were eight countries from Asia and Africa, with one or two runners each, followed by a North Korean contingent of around 60 (male and female). We followed the professionals in and lined up (in very straight lines) on the field to stand through the opening ceremonies, which consisted of speeches (in Korean) and music, all enthusiastically received by the 50,000 spectators. It was a sight to behold. The cheering was so loud, and so persistent, that even though it felt staged, it was hard not to respond with a smile and a wave. After the opening ceremonies, we filed back out of the stadium (still in those very straight lines) and went towards our bus, where someone was waiting for us with large plastic bags. We quickly deposited our warmup gear in the bags and went back to the stadium to get into position for the start of the race. The professionals, all of whom were running the marathon instead of the shorter races, lined up in front, on the track, with everyone else lining up wherever they wanted to. There was no seeding or structure whatsoever to the start line for the amateur runners. 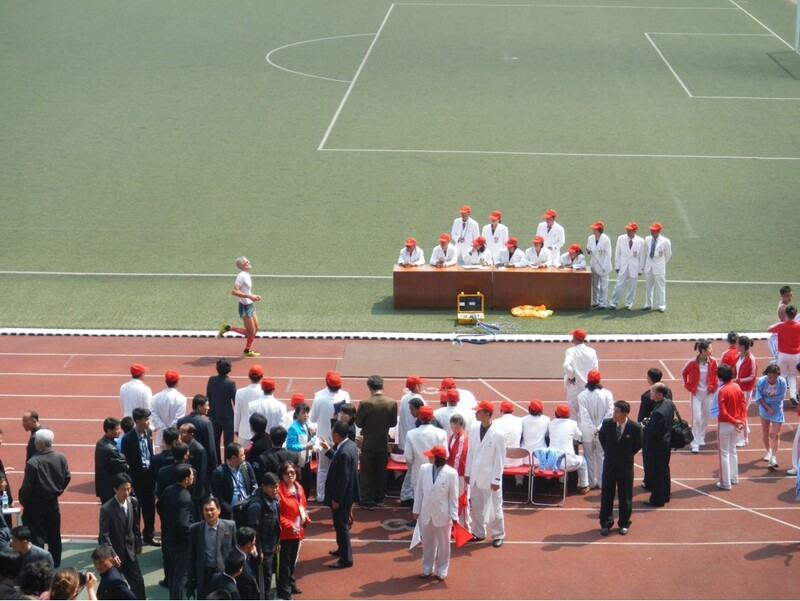 In addition to the people who had been on the field for the opening ceremonies, several hundred amateur North Korean runners appeared, ranging in age from what looked like ten-year-olds to men in their seventies. Looking around, I noticed that the pricey, high-tech running gear worn by the international runners, both amateurs and the professionals, was very different than the older, baggy singlets and loose, old-school 1970s-era race shorts worn by the North Korean men and women. Their shoes were very worn, and many of them were not even what most in America would consider “running” shoes. The gun went off. Everyone bolted. The gun went off again. False start. In a marathon? That seemed odd to me, but we all shuffled back into place. After everyone was in position, the gun went off again, and we were on our way. About 100 meters down the track from the start, there was a 90 degree turn off the track and into a tunnel, going out of the stadium. The race slowed to a crawl until we were out of the tunnel. The kids, and many of the other DPRK amateurs went out hard and fast. I have never seen that many people start a race of that distance—or even a 10K—with that level of intensity. As I passed many of them on the first lap, their breathing and their faces told me that they were redlining, running at their maximum capacity. It’s hard not to wonder what the results of this race might mean to them, for better or for worse. The course itself was not very exciting. We passed the Arch of Triumph and the May Day Stadium, and there were some spectators around the 10K mat. Interestingly, despite the specific directions we had been given about flags and country names, I saw a few runners (from Norway, Ukraine, Great Britain and Germany, to name a few) who were definitely representing their countries. After the race, I found out that the flag rule only applied to American and Japanese runners. The air quality during the race was awful. I felt a burning in my throat and had a horrible taste in the back of my mouth the whole time. By the start of the race, I still hadn’t figured out how we were going to get 42K out of running at 10K loop 4 times. 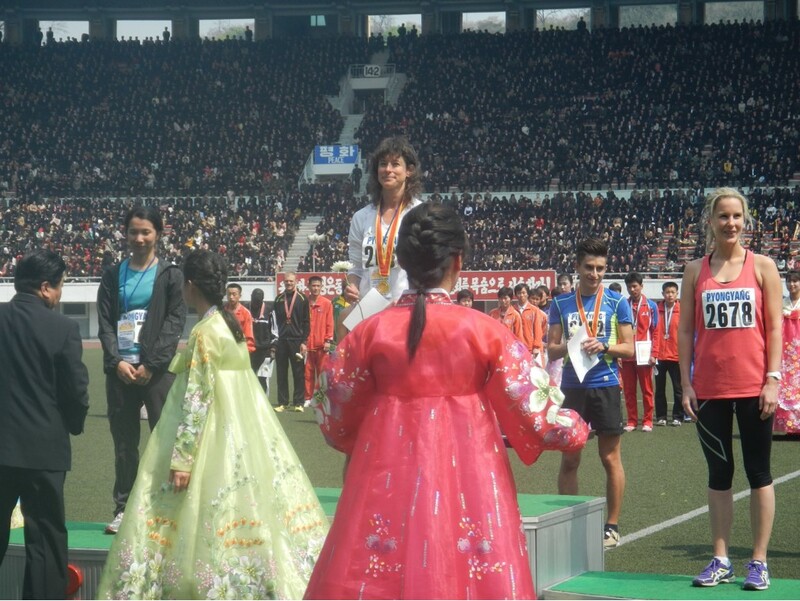 I was running a good pace and was able to stay with the some of the leading women, who were all North Korean athletes. When in doubt, I always follow the locals. 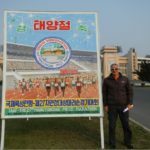 I followed the North Korean women and easily found the extra out-and-back stretch that was added to the course after finishing the 4th 10K and before turning down the course into the stadium to finish on the track. Deb, running the half, got to the stadium before me. When she ran in, there was no one in front of her, so when she saw the timing table, she though she was done, but she had a lap around the track to run. Coming up to the timing mat for the second time, she wondered why they were holding a tape across the track. She thought the first place marathoner must be coming up behind her, but the tape was for her. She had won the women’s half! She had never broken a tape before. When I entered the stadium, finishing with a 2:50, they weren’t even ready for me! Sadly, this meant I didn’t get to break a tape the way Deb did. I was the only international amateur to break 3 hours. The race official at the finish came over to me and asked me, “You are not in the marathon?” even though my bib number indicated that I was. I said, “Yes, I am.” She replied, “But you didn’t run 4 laps!” I said “Yes, I did.” She asked “Did you do the out and back before you came to the stadium?” Again, I said “Yes, I did.” She acted like she didn’t believe me. I was hot. I was tired. I was thirsty. Finally, I said “Hey, I ran right behind the top women and followed them every step of the way. We’ve got chips on and there are mats, so you can check it.” A few minutes later, she came over and verified my win. After the race, we went to get our stuff out of the plastic bags & the buses & changed into dry clothes. We had to wait around more than two hours with no food and a limited amount of water for the awards ceremony. Because it was North Korea, we couldn’t go anywhere; we just had to wait. While we were waiting, I got interviewed by an international news station, and the interview showed up online, so a lot of people back home got to see it. Receiving a medal for winning a marathon in front of 50,000 cheering people is pretty cool. The race organizers lined us up on the field (in—you guessed it!—very straight lines) by gender and race distance, and we took turns standing up on huge 1st, 2nd, 3rd place podiums, being handed certificates & a flower, and bending over to have medals put around our necks. It was like the Olympics. Unlike the Olympics, they did not raise the American flag, or play the national anthem for me or for Deb. When we got back on our bus after the award ceremony, the Koryo Tours guy was pretty happy to have gold medalists on our bus. He actually had three of us, because the winner of the Women’s 10K was also in our group. We had a couple more days of sightseeing, but no more running, before we left. 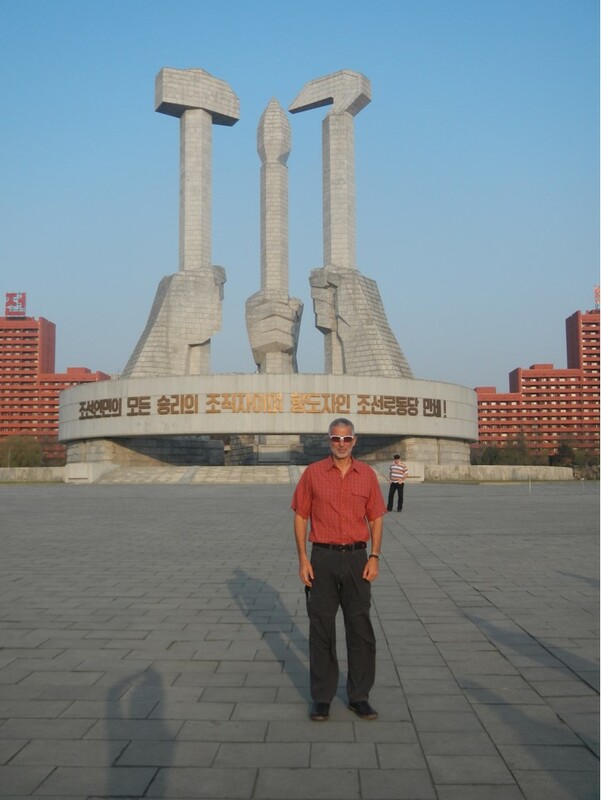 More monuments, more statues, more museums (including the “Victorious Fatherland Liberation Museum”, celebrating the “defeat of the US Imperialists”) and a trip to the DMZ (where the rhetoric includes how the “American Imperialists were afraid”.) 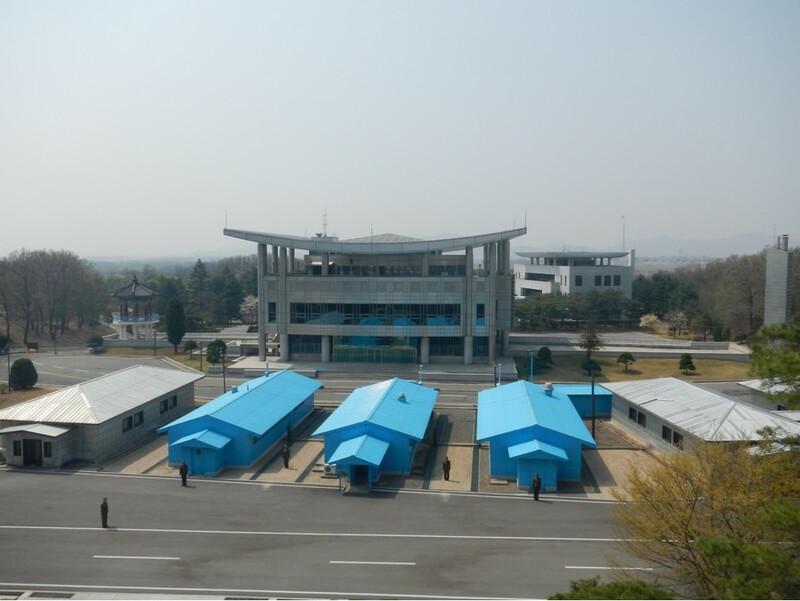 I had always thought that when I went to the DMZ I would be on the south side; it was strange looking across to the south. It just didn’t match up with all the images I had seen on the news and in documentaries. 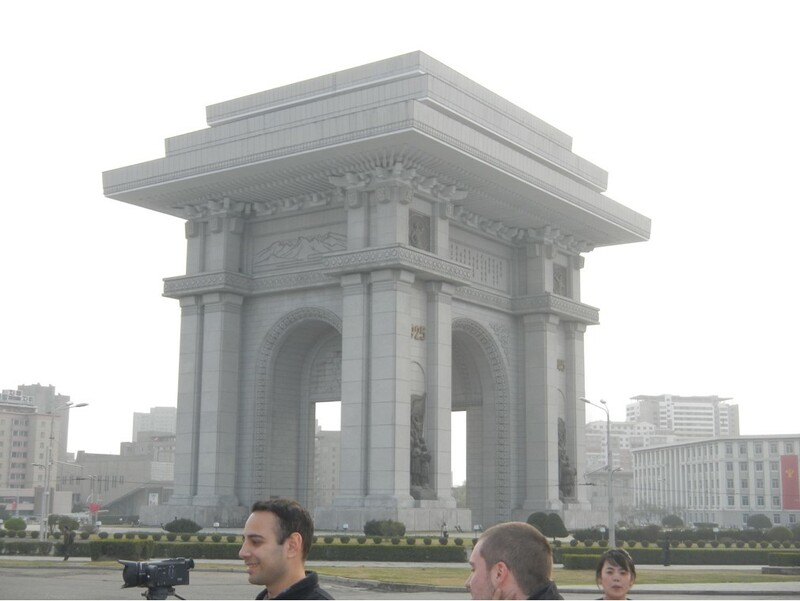 We visited the mausoleum where Kim Il-Sung and Kim Jung-Il are viewed. All of these excursions were constantly videotaped. There is an overwhelmingly oppressive, totalitarian feel to every aspect of traveling in North Korea. To visit the Democratic People’s Republic of Korea is to travel to a time and place where Communism is in full force and all of its propaganda is inescapable and on full display everywhere: on posters and billboards, in statues and monuments, and broadcast over loudspeakers. 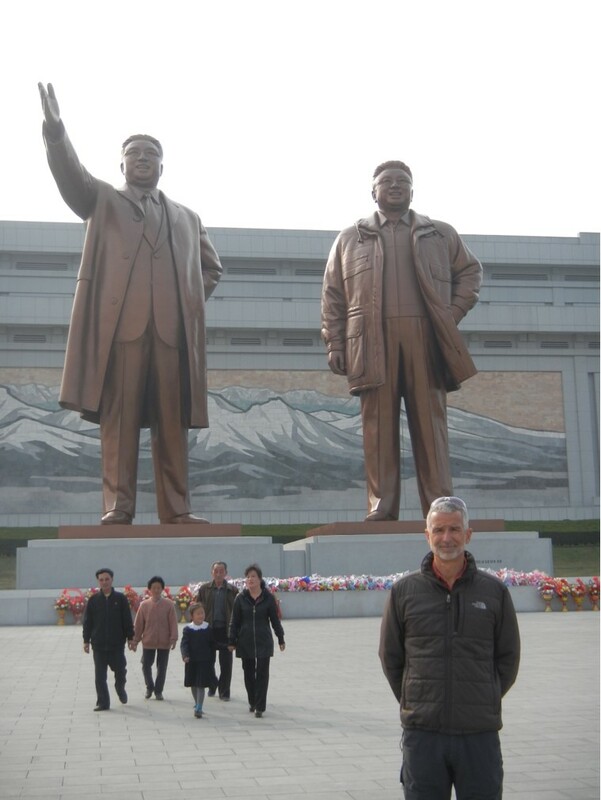 If the opportunity to experience this is as intriguing to you as it was for me, I highly recommend Koryo Tours. They are a first-class operation. While we were outside the hotel, the food was quite good, and we were treated with nothing but courtesy, but there was still a strange feel to the entire trip. All of the people we met seemed nice enough, but they also seemed meek, and afraid to truly engage with us. The most challenging part of the trip was not anything logistical or political. It was temporarily losing my freedom. Being told I could not go for a run, could not leave the hotel, could not get a snack while waiting around for the awards ceremony, could not take a photograph without approval, could not eat or shop anywhere that I wasn’t taken as part of the government approved tour itinerary, were all examples of this. 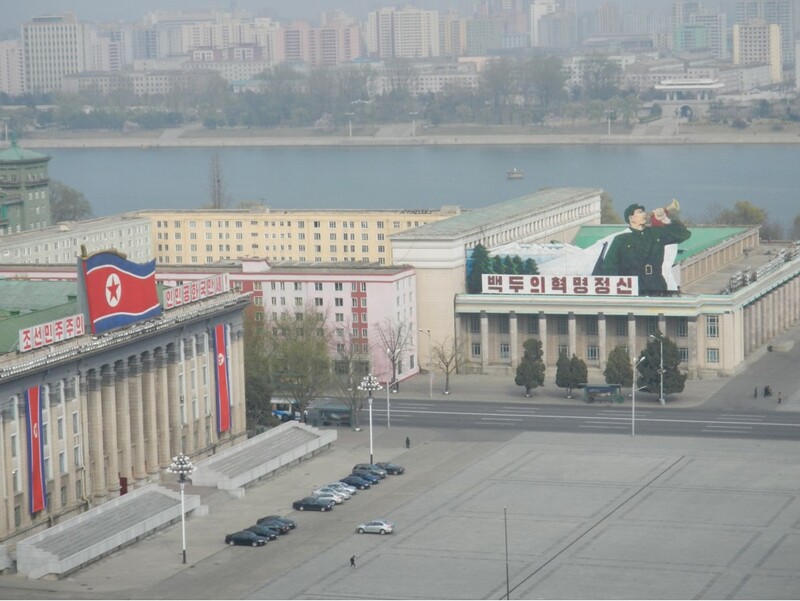 There is nothing scary about visiting North Korea. Nothing ever felt dangerous or unsafe. However, if you go, listen to the rules laid out by your tour operator, and follow them. There are too many examples in the news of people who don’t, resulting in a much more permanent loss of their freedom. It would be interesting to visit again after a Korean re-unification (or after a regime change) and see how the country and its people would be different. I don’t know that I’d run this race again, but maybe someday I’ll go back to climb Mt. Paektu, the highest point of both North and South Korea! Might be a future Trip Report! Who’s in? I had always wanted to go to Kilimanjaro, but I couldn’t find anyone to go with me. Eventually, I decided to go solo. I booked round trip air on Air France from LA to Kilimanjaro International Airport, which is between the towns of Moshi and Arusha. 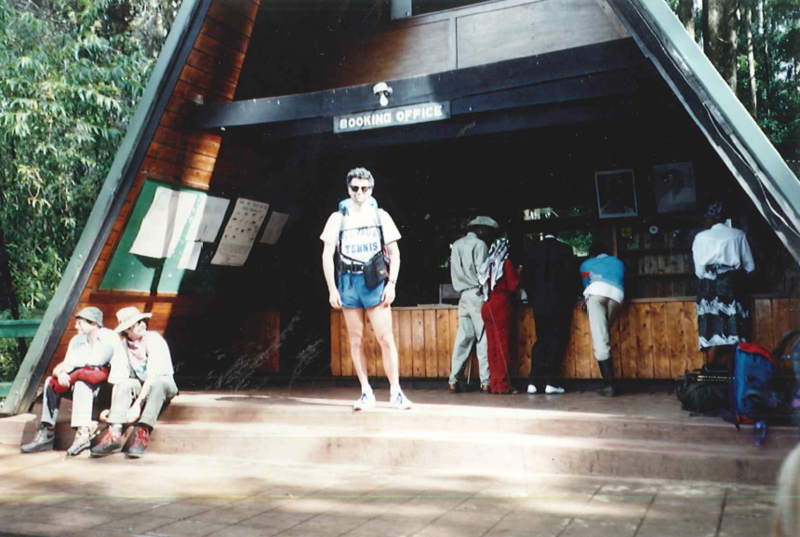 I arrived on the 16th of January 1993 and found a ride to the Marangu Gate of the Kilimanjaro National Park. 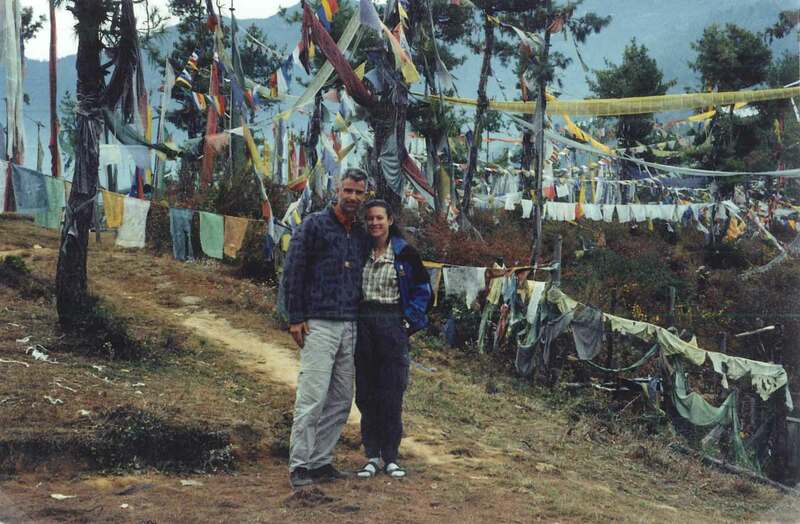 Starting the next day, I arranged a 5-day climb that cost $358. The cost of the climb included a guide named Obre, a porter, use of the huts on the mountain if space was available, and food for 5 days. The route we were taking was the only route up Kilimanjaro with huts along the way. 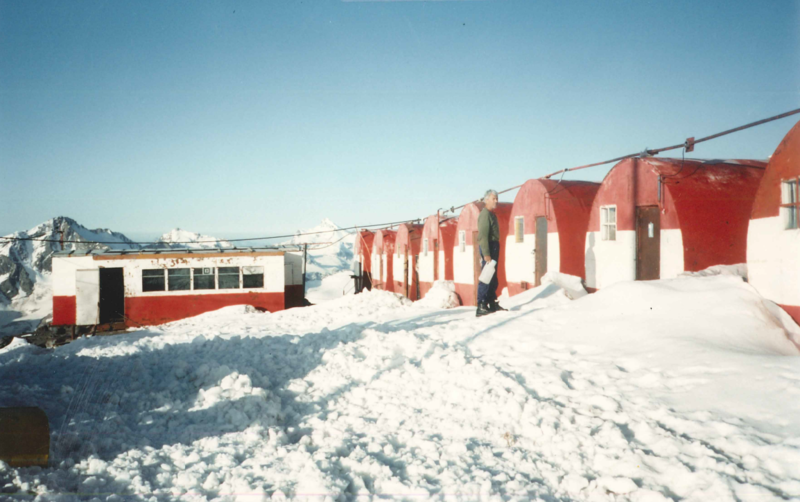 Each camp had huts with bunks for the climbers, separate huts for the porters and guides, and other ones for cooking, eating, and bathrooms. It rained hard the night before our climb began, but in the morning the weather looked much better. After breakfast, I met with Obre and the porter. We went to the gate and checked into the National Park. We found out that there were no bunks left in the lower huts on the mountain, so Obre went and got a tent for me. I decided that I would carry all of my own stuff, even though we had a porter with us. I liked to carry all of my gear, in order to be self-sufficient. If, for some reason, the porter didn’t make it to the hut, I wanted to have everything I might need with me. We started the hike to the Mandara Hut, which is at an altitude 2700m. Halfway there, it started pouring rain. The rainforest became a mudforest. There were mud puddles everywhere, some of them 6 inches deep. I tried to walk through the bushes on the sides of the trail more than the trail itself to keep myself from sliding. The only animals I saw along the trail were monkeys in the trees. Even in the rain, it took us only two and a half hours to reach the first hut. Normally I would have wanted to continue, but Obre wanted to stop and it was pouring, so I agreed. I hung out at the main hut for the rest of the afternoon. The porter took my wet clothes to the cooking hut and dried them by the fire. My clothes would smell like the fire for a long time afterwards. To this day, when I smell the smoke of a fire, I remember remote places I’ve been, and Africa is always among them. I had dinner around 6:00. The food was good, much better than if I had been carrying it and preparing it myself. I went to the tent, but it was leaking and very wet inside. It didn’t take much deliberating for me to decide that I wasn’t going to spend the night in the leaky tent. I went back to the main hut and met an Austrian woman who lent me a spare sleeping pad. When the first dinner table was empty for the night, I laid out my sleeping pad on it and went to sleep. About two hours later, I woke up again, and there were still a few folks drinking and partying. 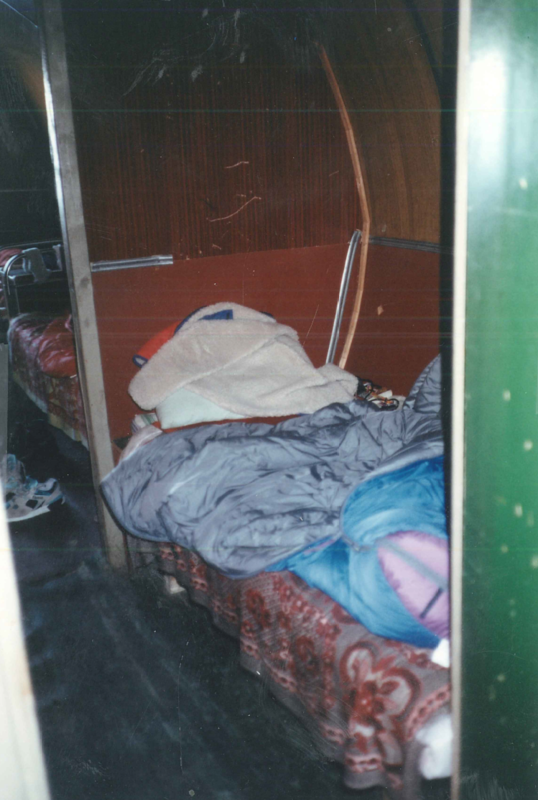 A woman told me there was an empty bunk up on the second floor, and I ended up sleeping the rest of the night there. The next morning, the weather had cleared and it looked like it was going to be a nice day. I could see the mountain’s white top for the first time. Since it was not raining, I decided to go all the way to the top hut, Kibo, which is situated at 4700m. Obre didn’t like the idea, but because I was carrying all of my own things, there wasn’t much he could do to stop me. I hiked and ran up by myself. 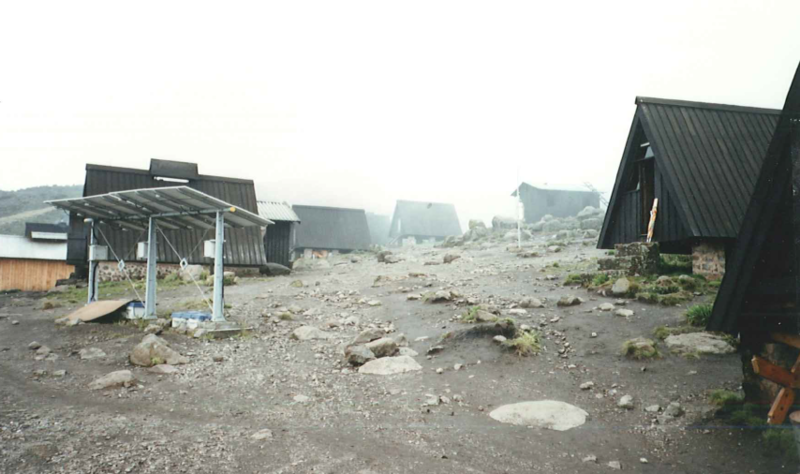 After I passed the Horombo Hut at 3700m, it started snowing. 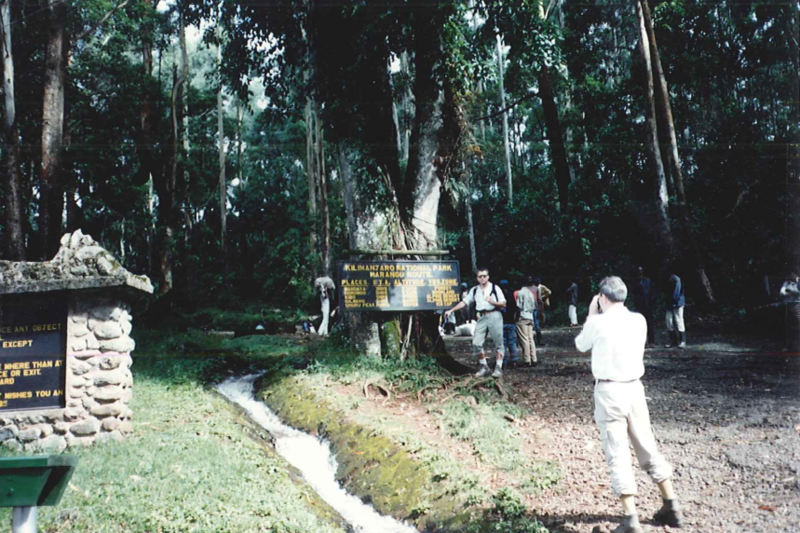 When I got to Kibo, there were 3 inches of snow on the ground. Obre and the porter arrived more than two hours later. After dinner, we agreed we would leave at 1:00 AM for the summit. I went to sleep at 7:30, but was woken only two hours later. Obre had altitude sickness. He needed to go down the mountain. I got dressed and went over to the guides’ hut. Obre was strapped in a metal gurney with what appeared to be a bicycle tire in the middle and two men at each end to balance and navigate. I said goodbye and they took Obre down the mountain. The night they took Obre off the mountain was pretty chaotic in the camp. I don’t think too many locals descend the mountain on a gurney. The porter then became a hybrid porter-guide; he said he would go to the summit with me at 1:00 AM. He woke me up at 12:30 AM, but the weather was bad. 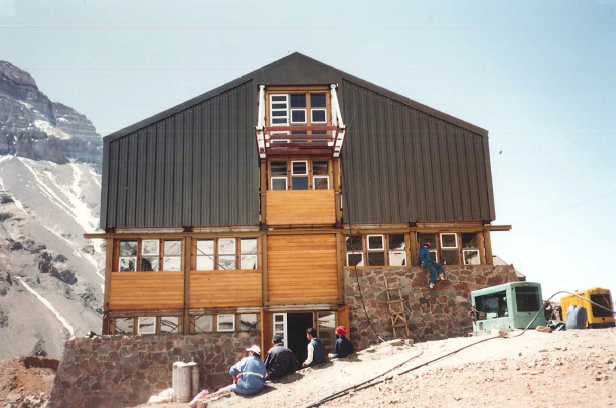 There were only 15 climbers at Kibo, because everyone was at the lower huts waiting for the weather to improve. We left that morning with the hope that the weather would improve. It didn’t. It got worse. 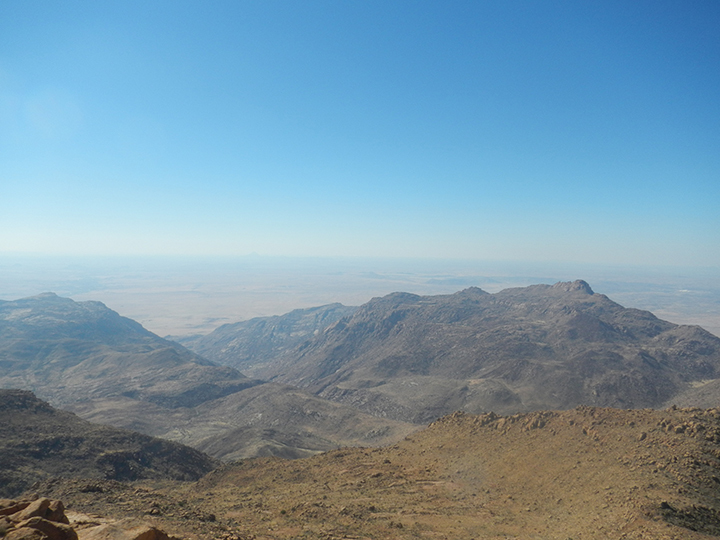 We struggled all the way to the Hans Meyer Cave, a famous landmark at 5150m. I was exhausted and frozen. It would have been better if I’d had the kind of gear that I would have used on a winter climb. We were caught in a white-out blizzard. I called “uncle” and we went back down to the hut. It wasn’t safe for us to continue. We had a hard time finding Kibo. In the snow, we had no tracks or path to follow. We had to wait for breaks in the snow when we could catch a glimpse of the hut and then aimed ourselves toward it, walking until the next glimpse would help us to reorient ourselves. We finally found it, and by the time we got back we were both exhausted and frozen solid. I was beginning to realize that the snow on the mountain was at its deepest in more than twenty years. 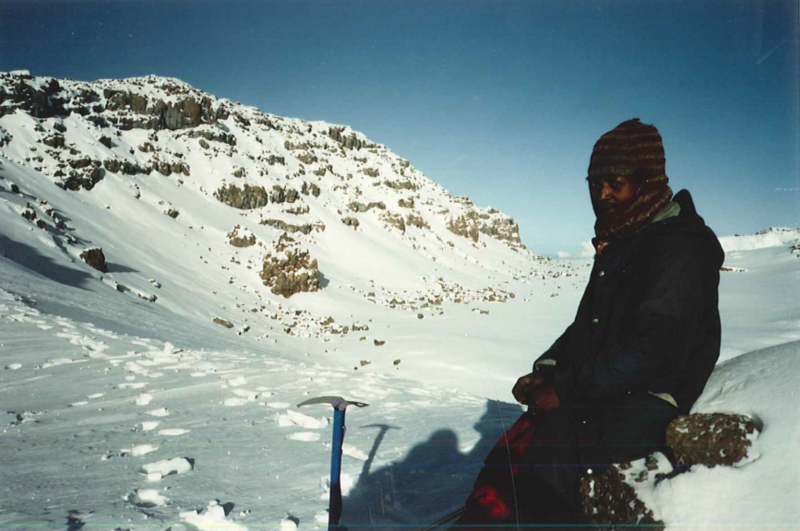 I was then told that no one would be allowed to go to Uhuru Peak (the summit, at 5963m) because there was too much snow. This was the 2nd mountain in a row (Mt. 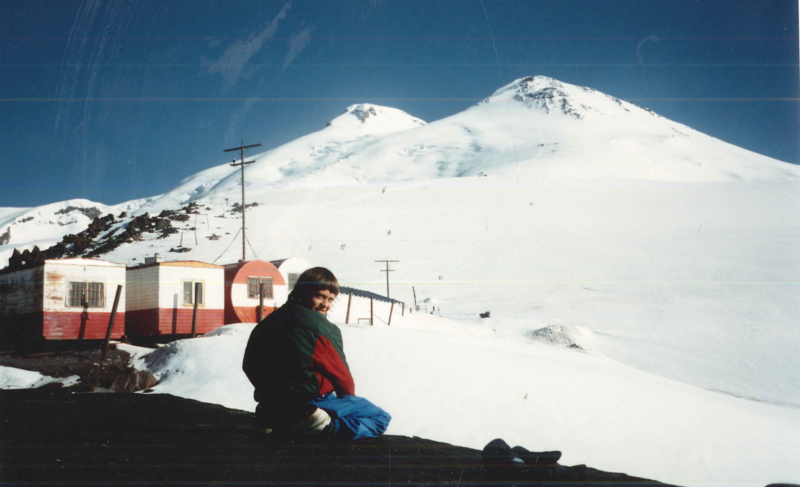 Elbrus being the first) where I was told I wasn’t allowed to go to the summit. I am pretty sure that most of the guides (and some of the climbers) simply didn’t want to deal with the snow. 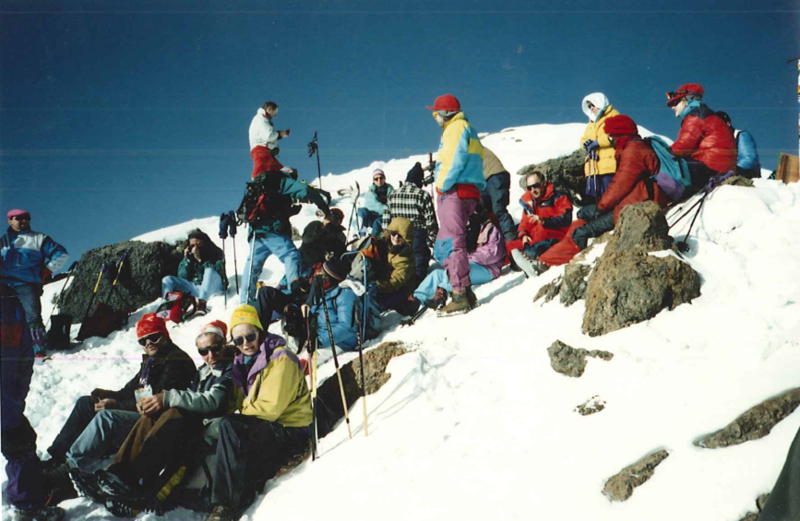 The guides were taking climbers to a lower peak on the mountain, Gillman’s Point at 5680m, and calling that the top. This was just another hurdle I’d have to deal with later. The current hurdle was that I had taken a gamble and raced up the mountain. I was starting to get sick from the altitude and was exhausted. If the weather conditions had been favorable, I probably would have tagged the summit and gotten down fast, but conditions were bad and I was paying the price. I needed to go down to a lower altitude and regroup. When we got back to Kibo, I took a three-hour nap. At 10:00 AM, we started down the mountain. I think my porter-guide was happy. He thought we were going down for good. I was extremely sick, with diarrhea and a host of other nasty symptoms. We were back at the Manadara Hut (2700m) at 5:00 PM. After dinner, I found a bunk and tried to go to sleep. I felt like the walking dead—up all night going to the bathroom in the cold, pouring rain. When I woke up at 6:30 AM, I was feeling a little better, but not much. After breakfast, I decided I was going back up the mountain. When I told my porter-guide, he was in utter disbelief. He told me he would have to “get this approved”. 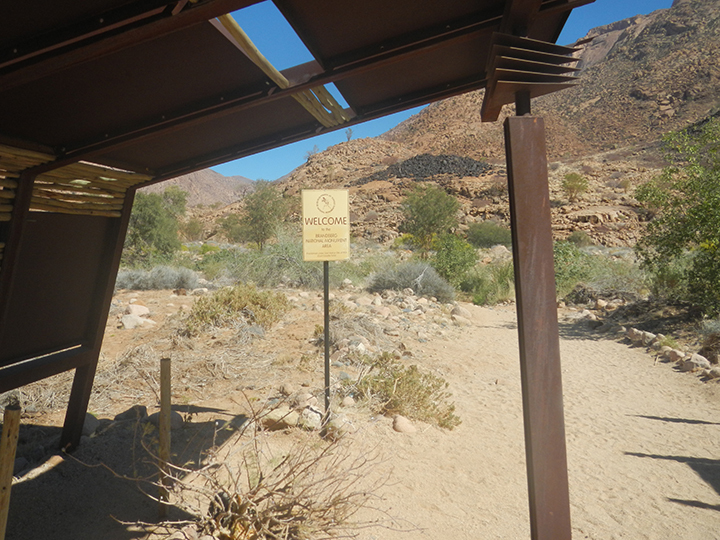 He disappeared and reappeared with a park ranger named Roman, who told me that it would cost me $170 to go back up. He figured it would take days extra. I thought this was complete BS, but promptly paid the money. This time I was going to stay at the Horombo Hut, at 3700m. It took four and a half hours to get to the hut. The rain was in full force. It was not a ton of fun. I found a bunk and went to sleep at 3:00 PM. I was woken at 6:00 PM for dinner, ate as much as I could and, went back to bed. It was a rough night. When I woke up at 7:00AM, I felt better than the day before, but still not great. After breakfast, we left for the Kibo Hut together. It took us three hours. No rain or snow, and the really good news was that I was feeling stronger. When we arrived, I took a three-hour nap. It was snowing a little by then. The hut was full this time. In my bunk area, there was a big group of a couple dozen Swiss climbers. They were very nice and well equipped with radios and fancy climbing gear. Everyone’s plan was to leave at 1:00 AM again for the summit. When I went to sleep, the mountain was still clouded over. When I went outside to go to the bathroom at 9:30 PM, I knew that I was going to the top for sure this time. There was not a single cloud in the sky. All I saw was the mountain and hundreds of stars. This time there were probably close to a hundred people attempting the summit, including my new Swiss friends. I moved up the mountain conservatively this time around, staying behind my porter-guide. The whole way up, I was talking about going to the top: Uhuru Peak. My porter-guide would always agree, but in the sort of way that made me suspect there might be a problem later on. For the moment, though, I set that concern aside and focused on the climb. I don’t ever remember seeing so many stars in my life. At 5:00 AM, we were the first to reach Gillman’s Point, the lower peak at 5680m. The second we got to Gillman’s Point, my porter-guide shouted “The top!” and “Congratulations!”. This caught me by surprise. I said, “This is not the top. We need to go to Uhuru Peak”. He replied, “No, this is the top. We can’t go to Uhuru Peak because there is too much snow”. I asked to go by myself, but I received a definite “NO!” to that proposal. In frustration, I said, “I want to wait for the sunrise,” which is a pretty common thing for people to do at the top of Kilimanjaro. This bought me some time. Within about ten minutes, I had surveyed the situation. 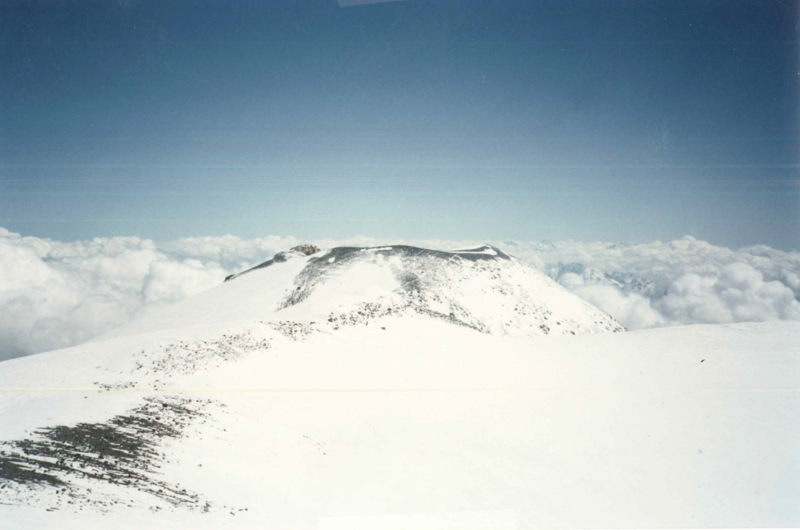 From Gillman’s Point, the trail goes into the mountain’s crater and climbs out to Uhuru Peak. There appeared to be a lot of snow in the crater, but I noticed a ridge linking Gillman’s Point to Uhuru Peak. I thought that would be the best way to go, because the weather was perfect (for a change) and probably the least amount of snow would be on the ridge. 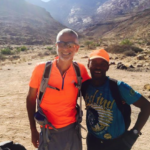 I decided that I was creating the Zalokar Route: the ridge to Uhuru Peak. I told my porter-guide that I needed to use the restroom, and then I was gone. 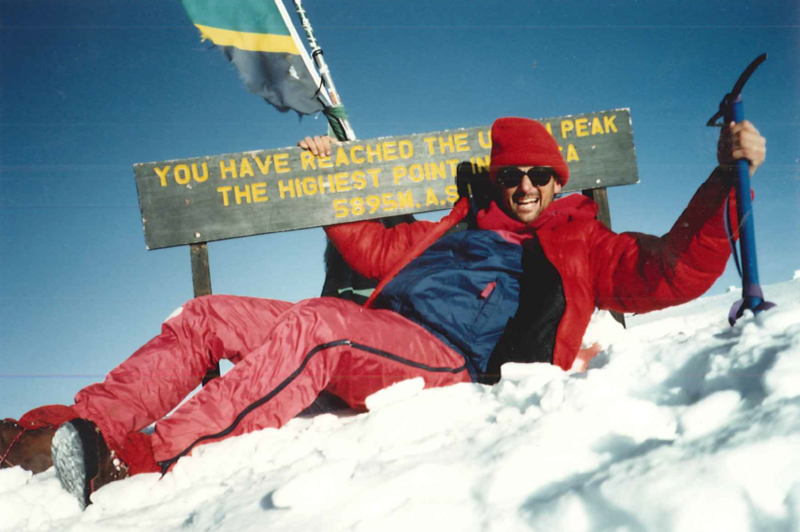 On January 22, 1993, I reached Uhuru Peak at 7:00 AM. There was some post-holing in the snow along the ridge, but it wasn’t too bad. There were no signs that anyone had been there in quite a while. I was so pleased. The summit sign was only barely visible, two feet above the snow. It was a beautiful sight, and the view from the top was incredible, because the sky was so clear. I stayed on top for about 10 minutes and then started back down the ridge. I met my porter-guide about 3/4 of the way down the ridge; he had figured out where I’d gone and had started his way up to meet me. He smiled and congratulated me. I was glad our meeting went that way instead of being confrontational. I gave him a $100 tip then, and he was even happier after that. We got back to Gillman’s Point at 8:00AM and all the Swiss were there. One asked me, “Did you go all the way to Uhuru Peak?” I said, “Yes!” and jumped down the ridge from Gillman’s Point and ran through the snow all the way back to Kibo. Climbing to the true summit of Kilimanjaro, Uhuru Peak, despite the obstacles I had to overcome (mud, sickness, cold, snow, guide-on-a-gurney, less-than-perfect-equipment, and being told “NO!” in no uncertain terms) actually made the trip more fun, exciting, challenging, and rewarding than if it had been a typical Kilimanjaro summit attempt! The biggest challenge in climbing Kilimanjaro is really the altitude. It is not a technical climb at all. In perfect conditions, it is really just a long hike. When my porter-guide got to Kibo an hour after me, we decided to go all the way out to Marangu Gate—the entrance to the park at 2000m. I was ready to leave the park and sleep in a bed. 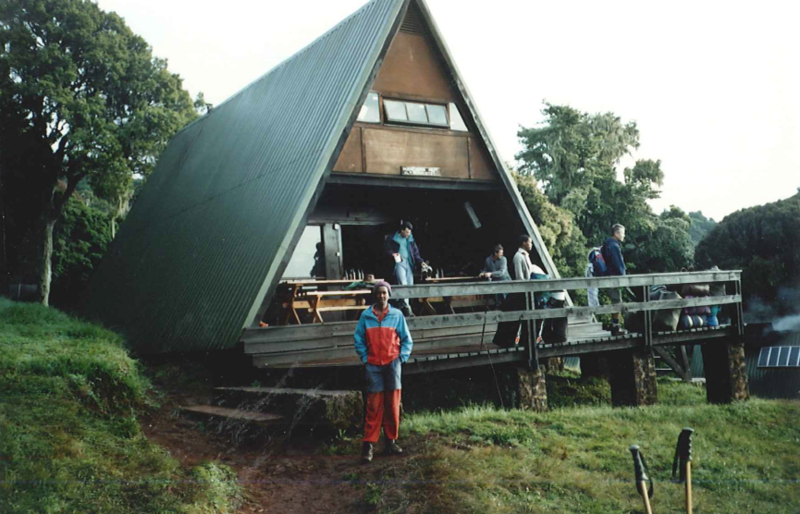 We arrived at the Horombo Hut at 11:45 AM and had lunch. We passed by the Mandara Hut at 2:00 PM, and then arrived at the gate at 4:15 PM. Guess who was waiting for us? It was Obre. I wanted to go to the Moshi Hotel about 35 miles away. I desperately wanted to get to the hotel and take a shower. I agreed to pay $30 for the ride. With my ex-guide and his father driving, we left. First, we stopped to pick up the bag I left at the first night’s lodging and then went on to Moshi. Half way there, Obre asked me, If I remembered my promise. I said, “What promise?”. He said, “Your promise of a tip”. I offered him some t-shirts, but he refused them and demanded cash. I explained to him that he didn’t do the job he had been hired for, and that I had payed top dollar for this ride. He insisted again. Finally, I said, “No, and let’s not talk about it again.” When we arrived at the Moshi Hotel, Obre tried to come in with me, and I suggested that he go home. I checked in, went to my room, and noticed that my door didn’t lock, but I was really tired and I figured it wouldn’t be a problem. When I checked in the hotel had water and electricity, so I started to run a hot bath, since I didn’t have a shower. Then someone burst into my room. It was Obre. I reacted without thinking. I ran right at him and put my right hand around this neck. I lifted him off his feet, took him out the door across the hallway, and pinned him to the wall. It all happened in matter of seconds. I snarled, “What the hell do you want?”. He had a hard time speaking with my hand around his throat, but he managed to squeak out, “My t-shirts”. I said, “Fine” and dropped him. I went back into my room and brought him 2 t-shirts. He took them and left without saying another word. Damn. Now I had to get my things together and get another room with a locking door. I tried to call the front desk but the phone didn’t work. I went to the front desk and asked for a new room—this time with a door that locked. Obre was still there, but he didn’t confront me. I went to my new room and locked the door. Luckily, I had time to fill the bath tub with hot water before the water and electricity went off for the night. I really needed a bath. After that, I went straight to sleep, without even eating dinner. The next morning, I checked out at 6:30 AM and took a local bus to Arusha. It was a good local experience. I arrived at Arusha at 8:30 AM. I got the word out that I wanted to go on safari with English-speaking tourists. About three hours later, a group called Star Tours contacted me at the hotel bar. Leaving the next morning, they had a five day, four night camping safari. It was with two couples, one Canadian and one English, and I would be the fifth person. It cost $250 and included food and lodging. 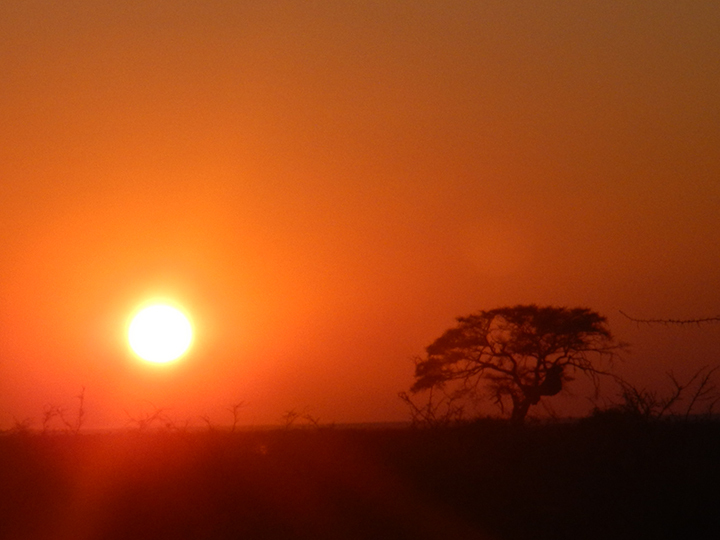 It went everywhere that I wanted to go: Tarangire, Serengeti and Ngorongoro Crater. The safari was amazing, but I will save that story for another Trip Report.